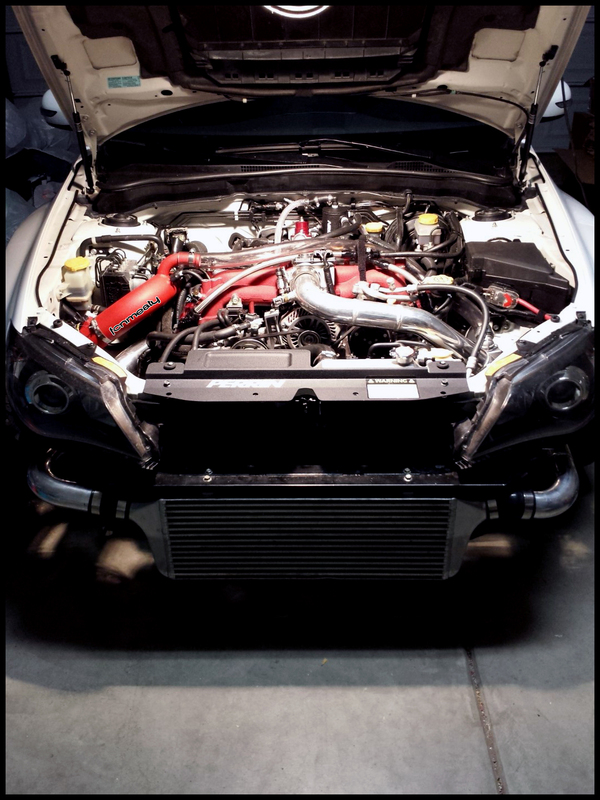 Finished engine bay and first fire video. 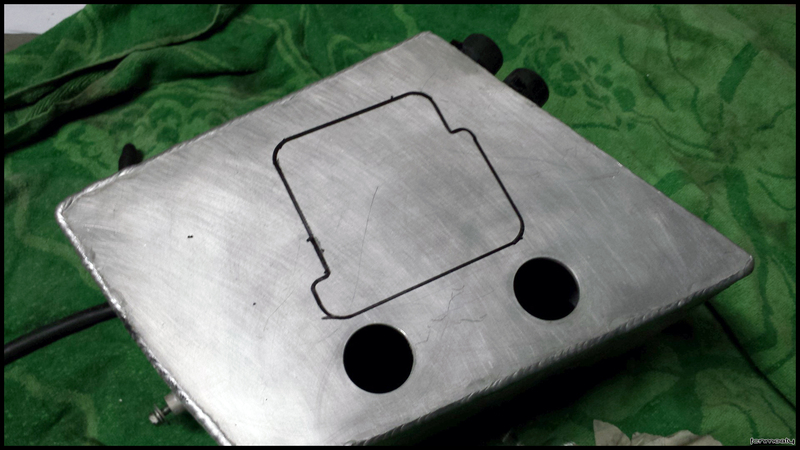 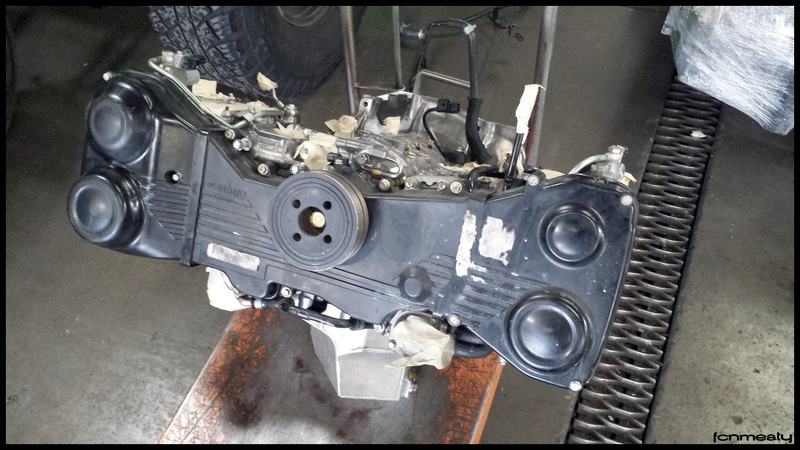 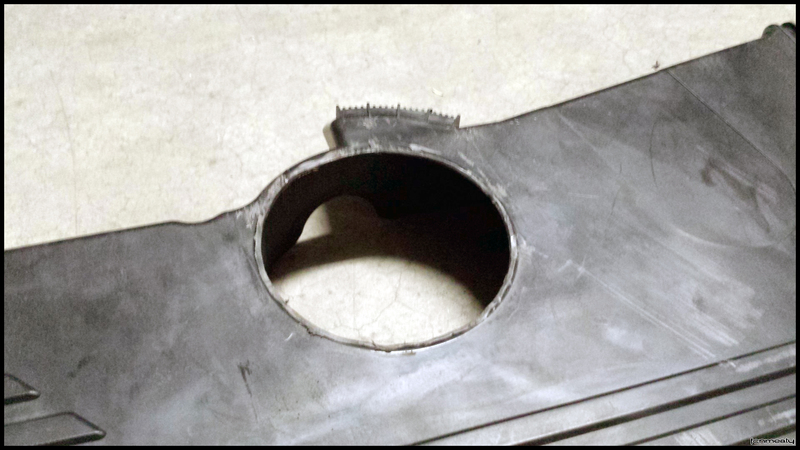 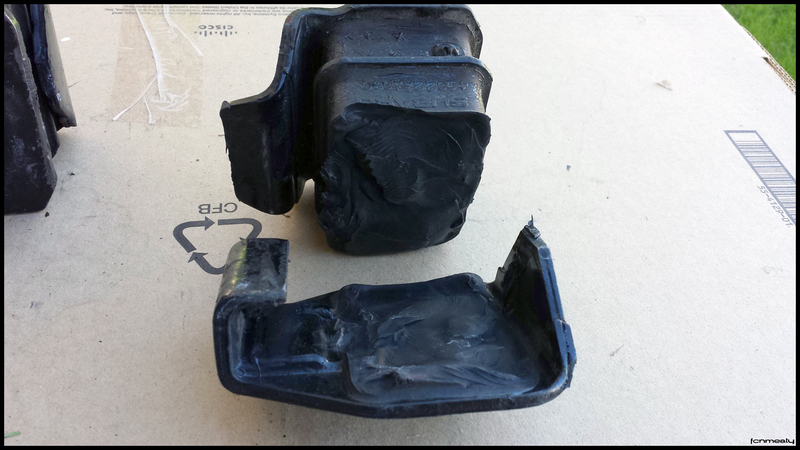 Worked on the engine bay, fabbed a bracket for expansion tank. 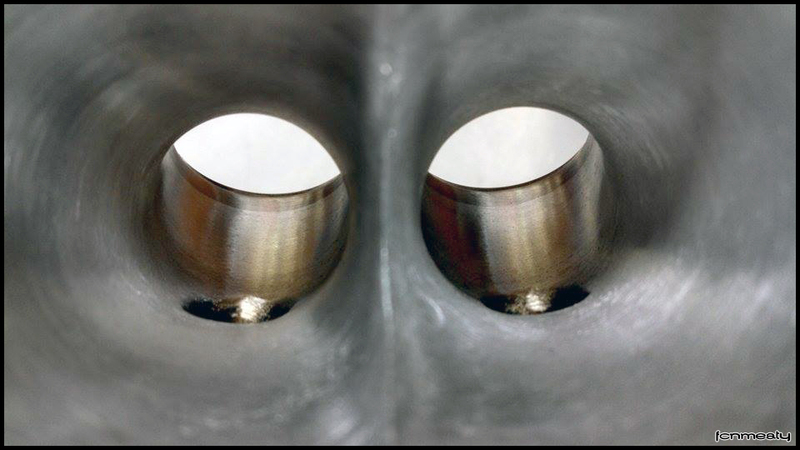 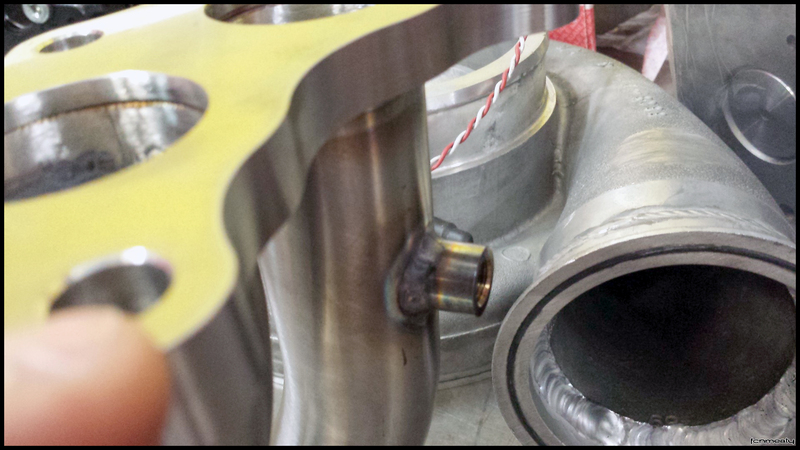 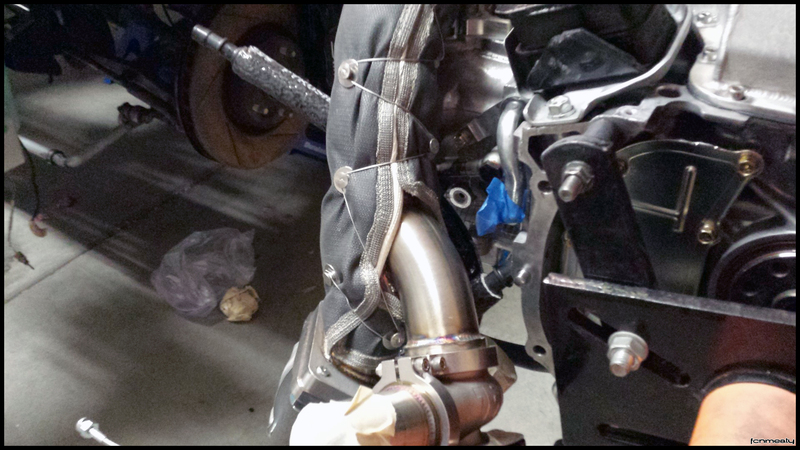 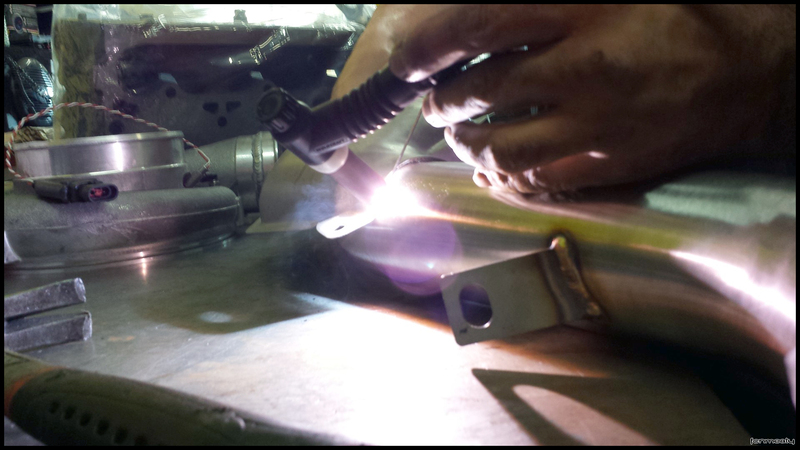 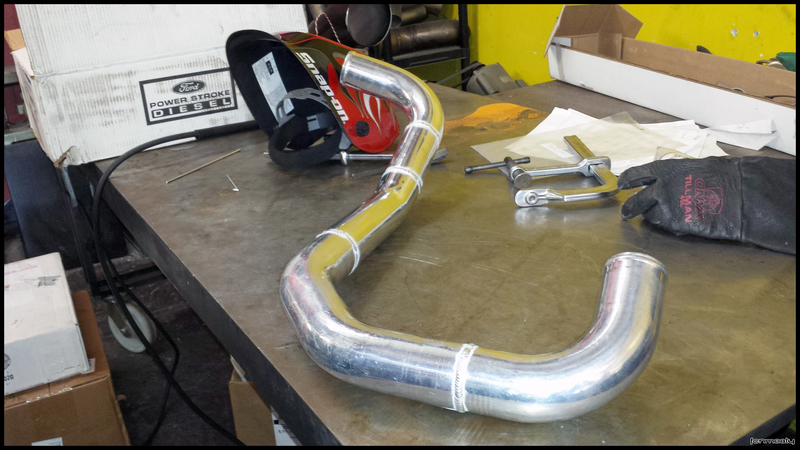 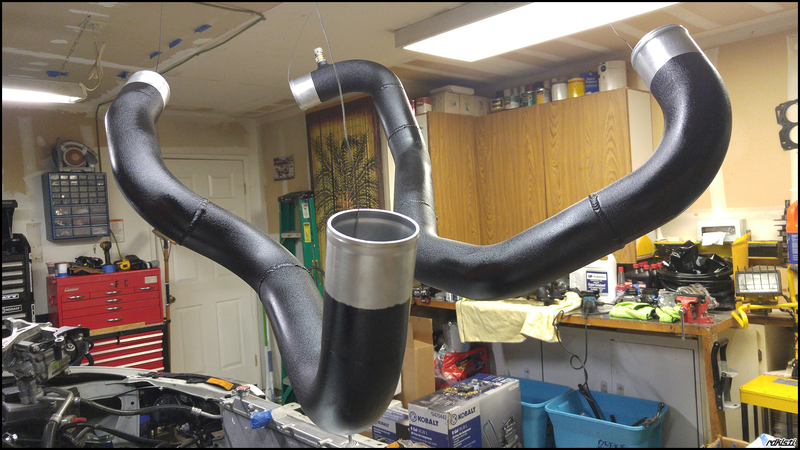 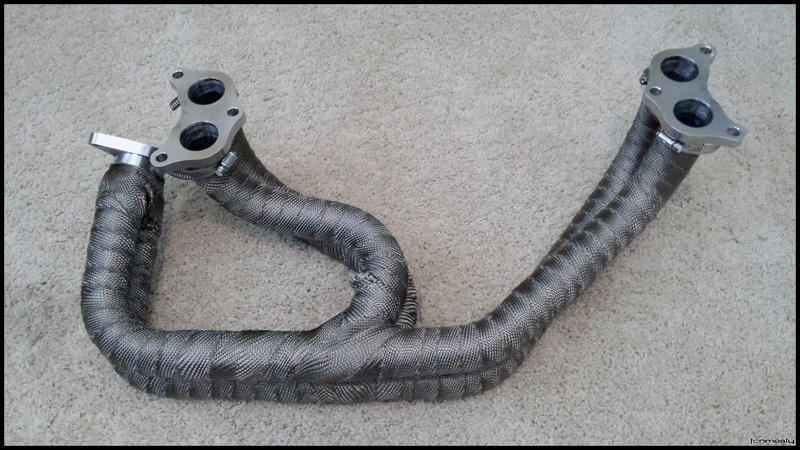 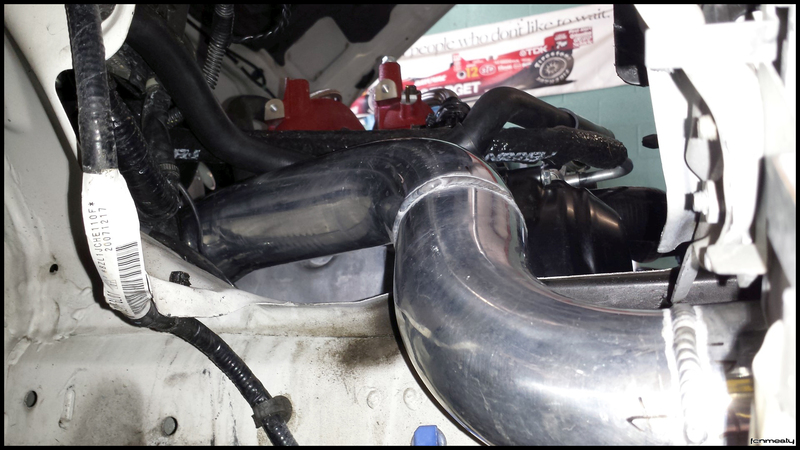 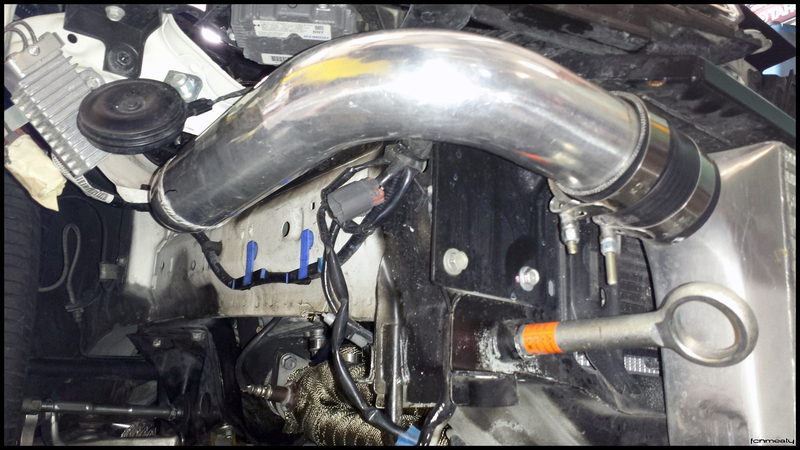 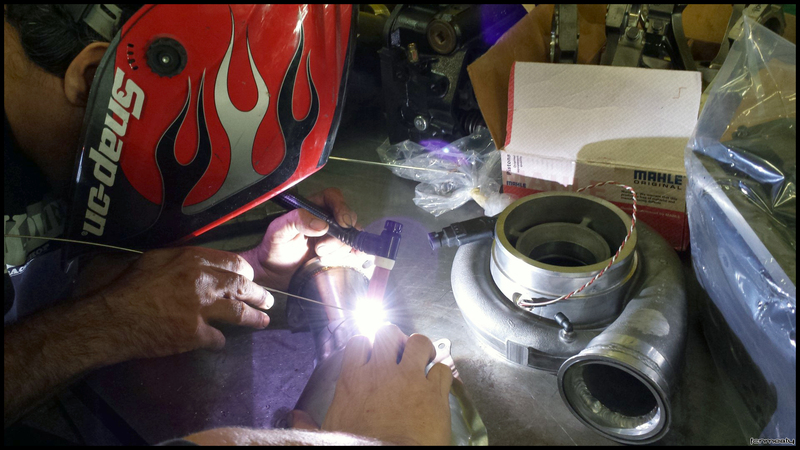 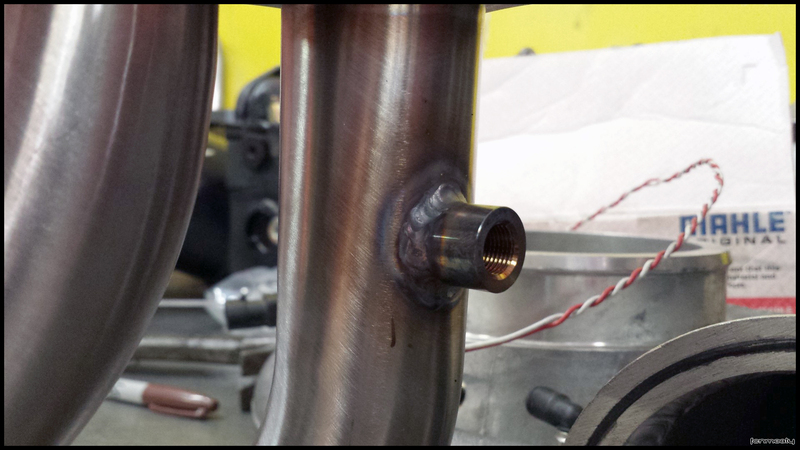 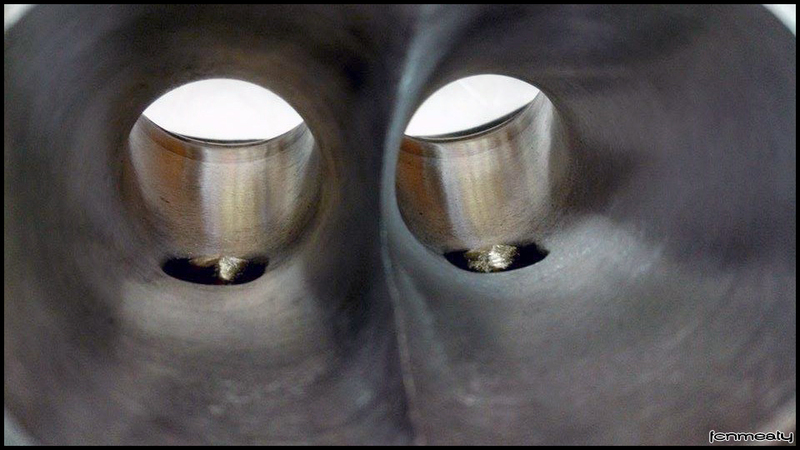 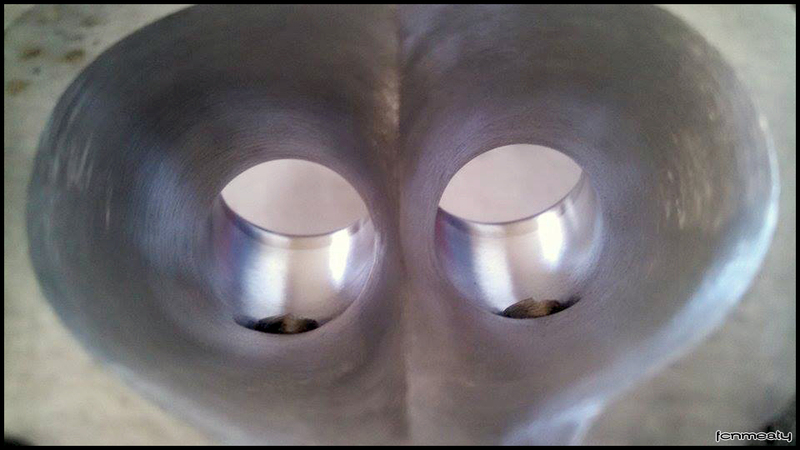 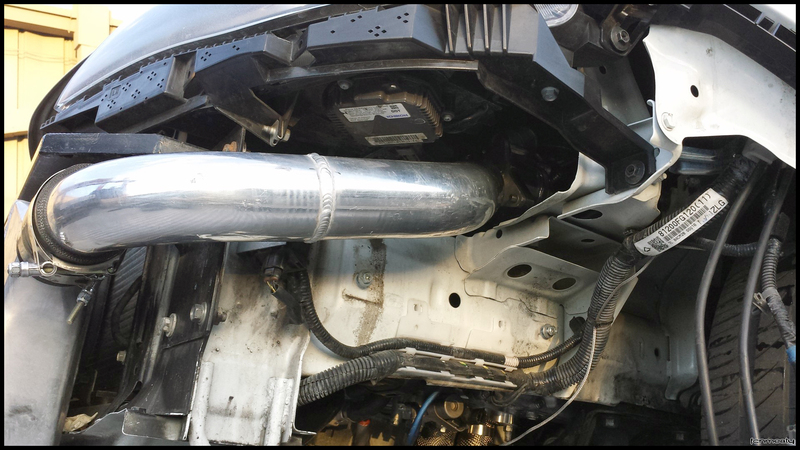 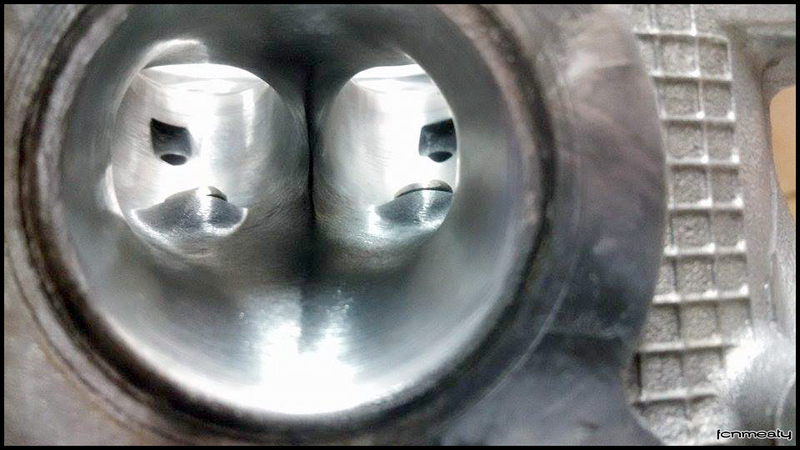 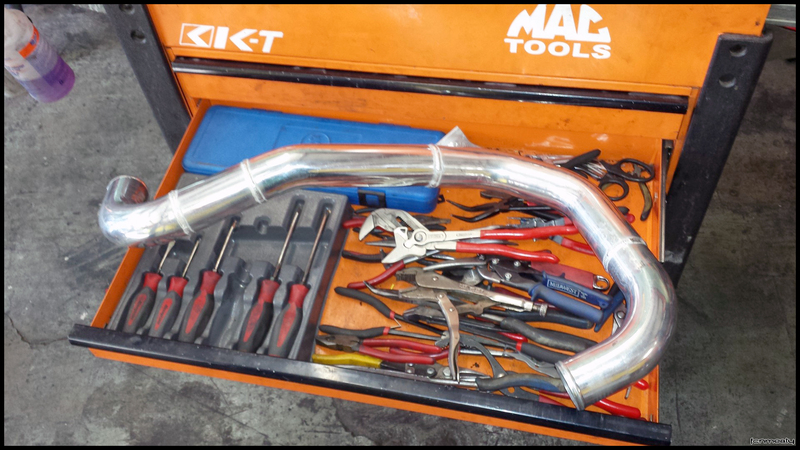 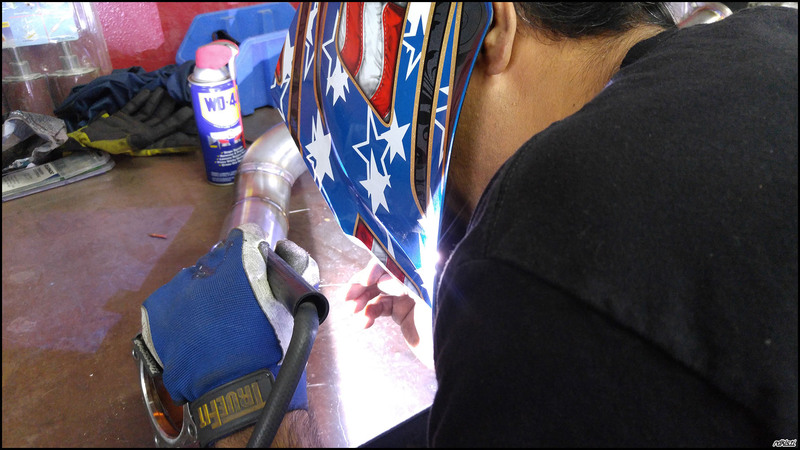 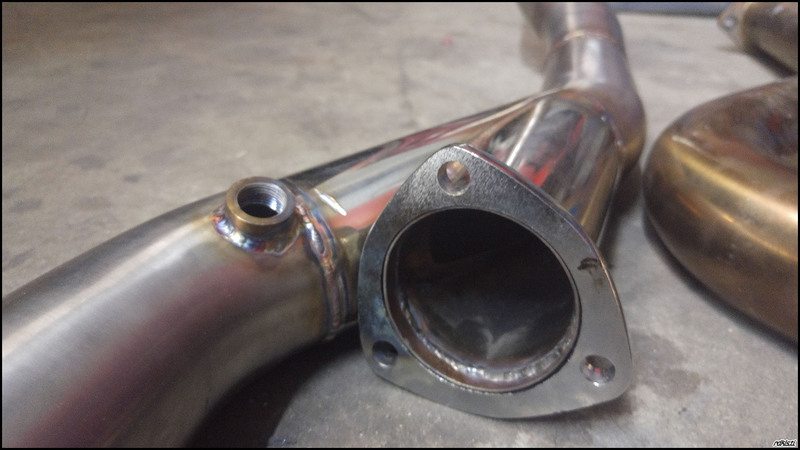 Exhaust fab done, small changes and added Y-pipe for QTP cutout. 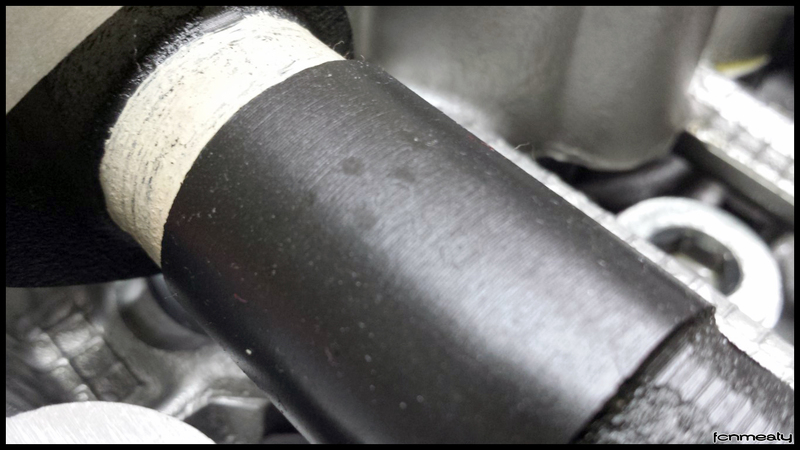 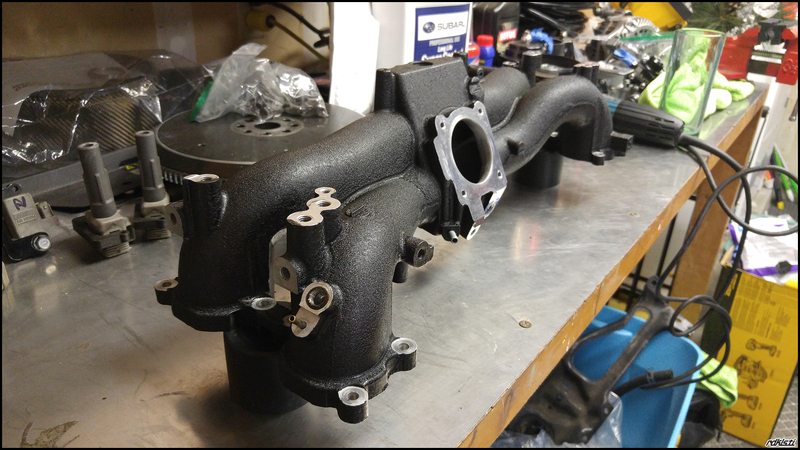 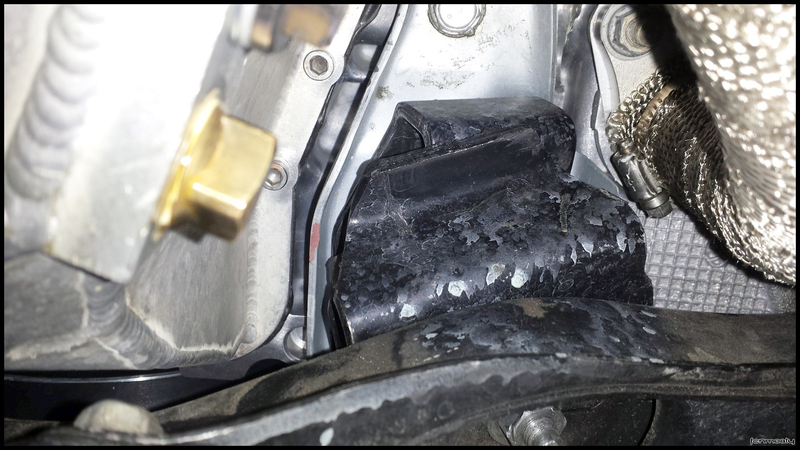 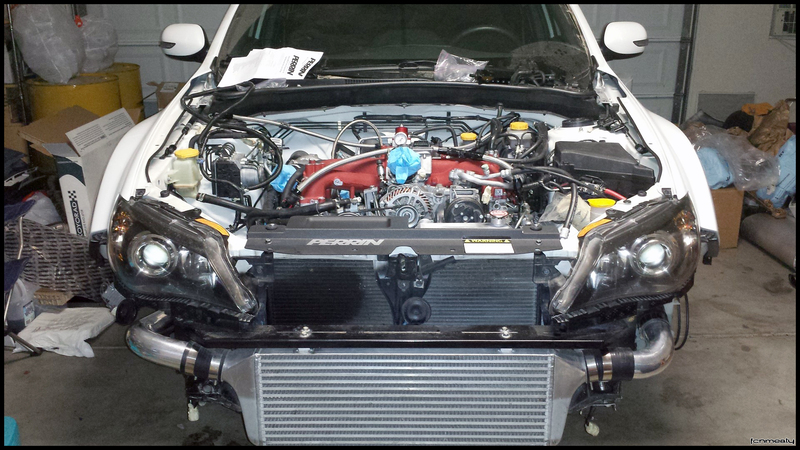 Resprayed intake, intake manifold and charge pipes wrinkle black. 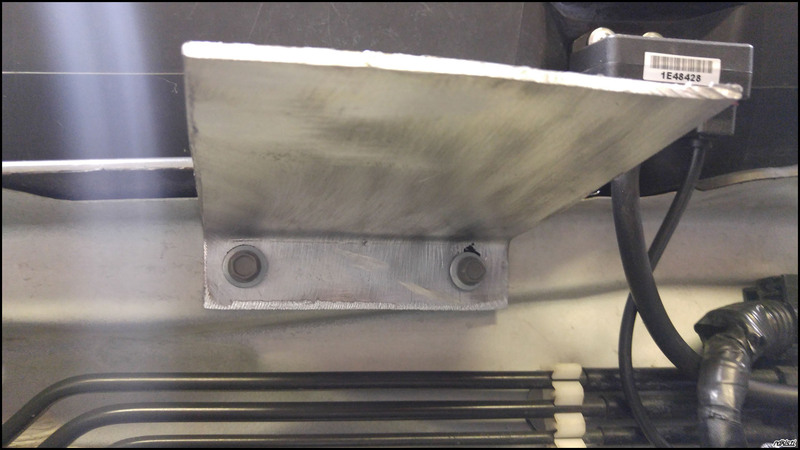 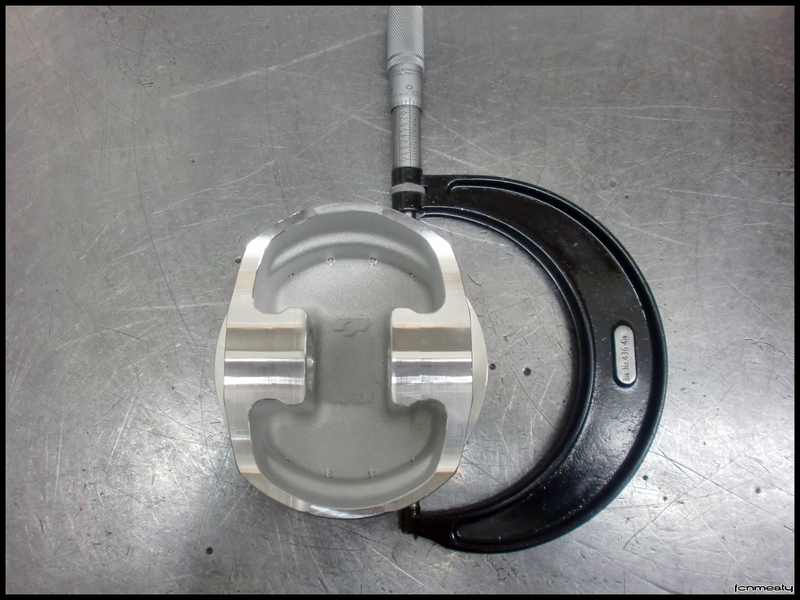 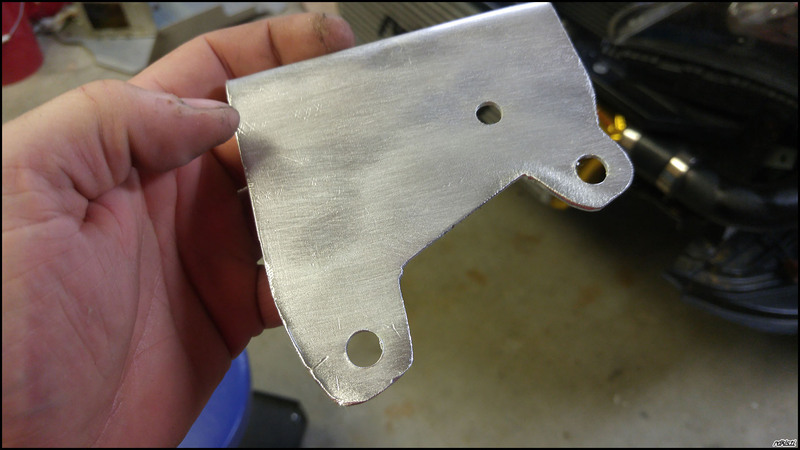 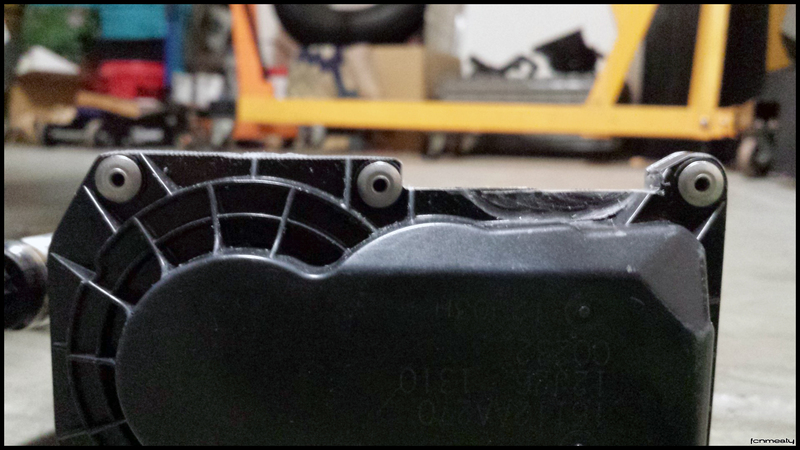 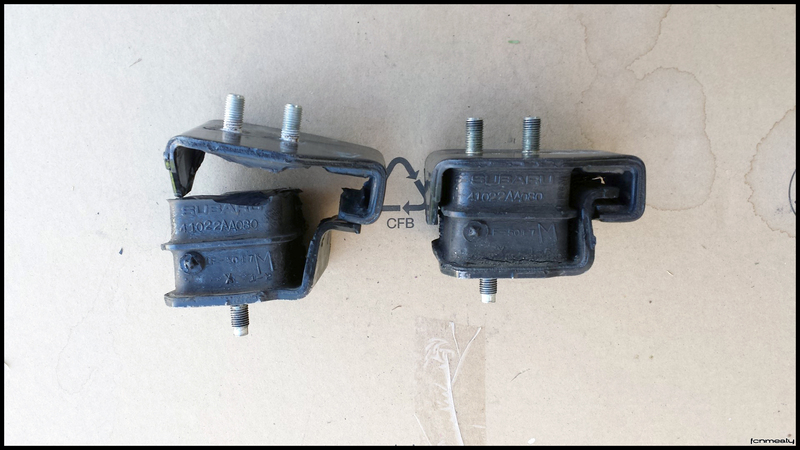 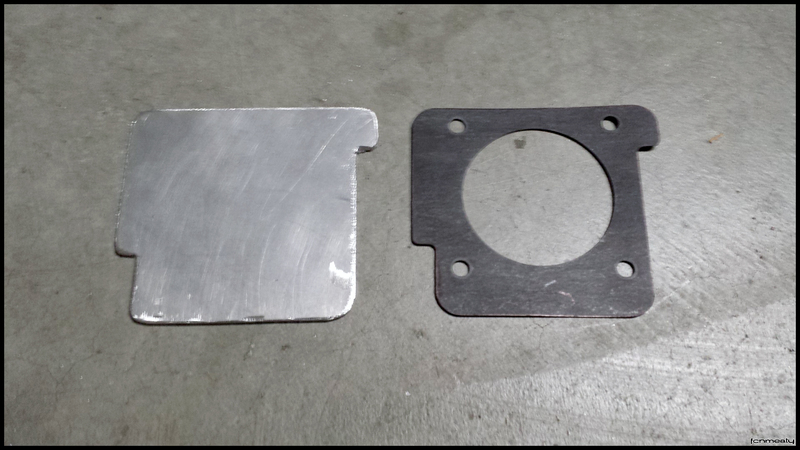 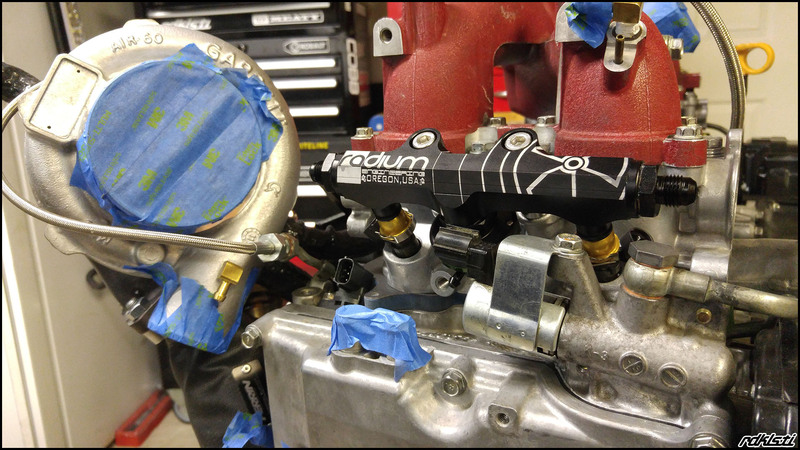 Fabbed MPR & Y-Splitter bracket & made Teflon fuel lines. 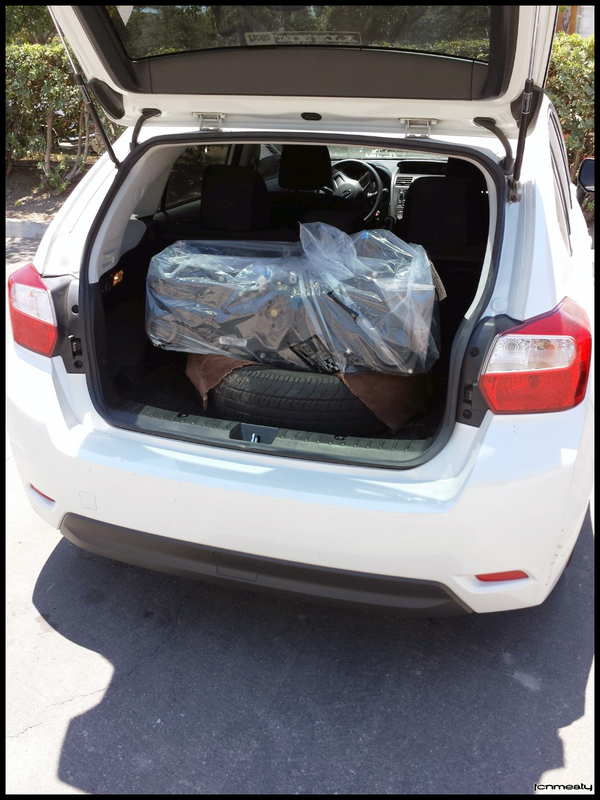 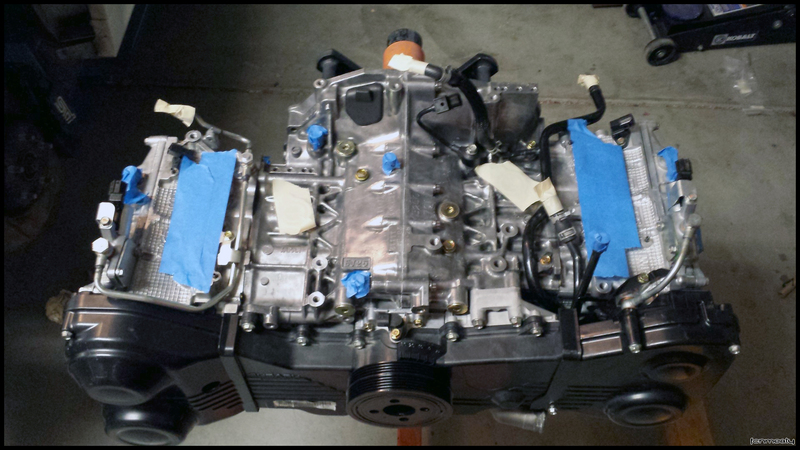 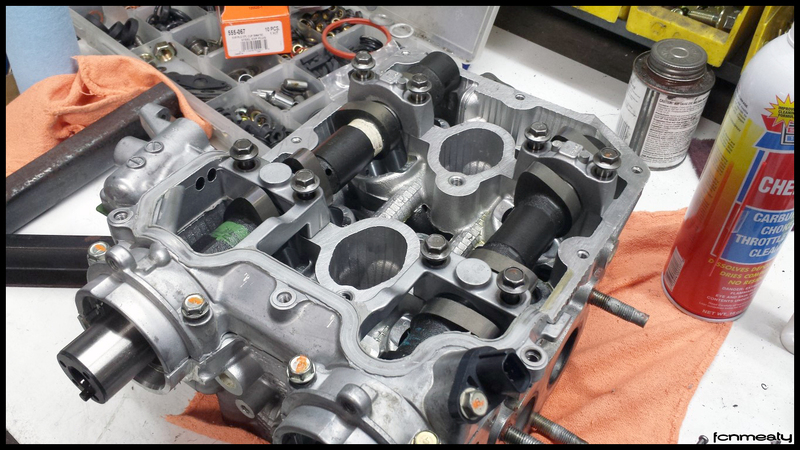 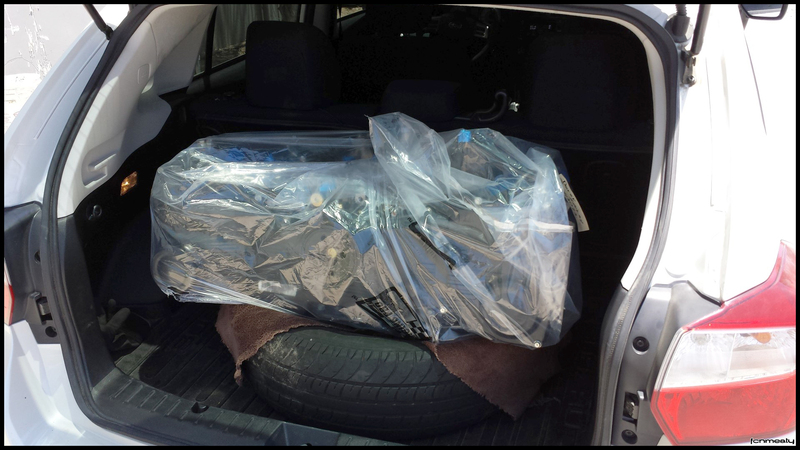 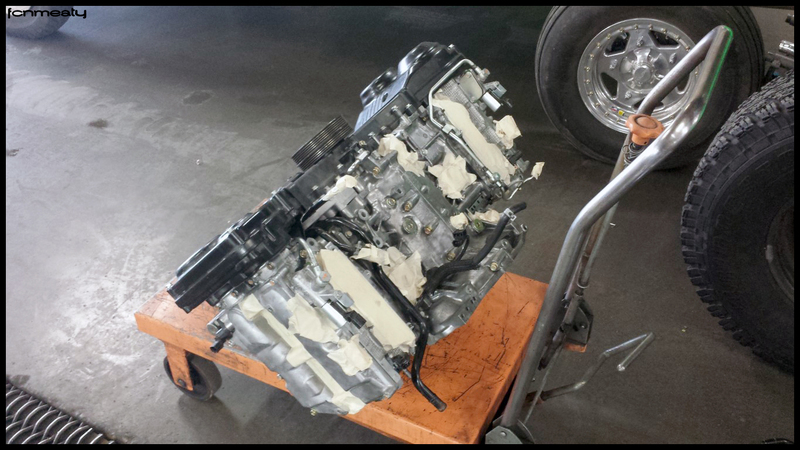 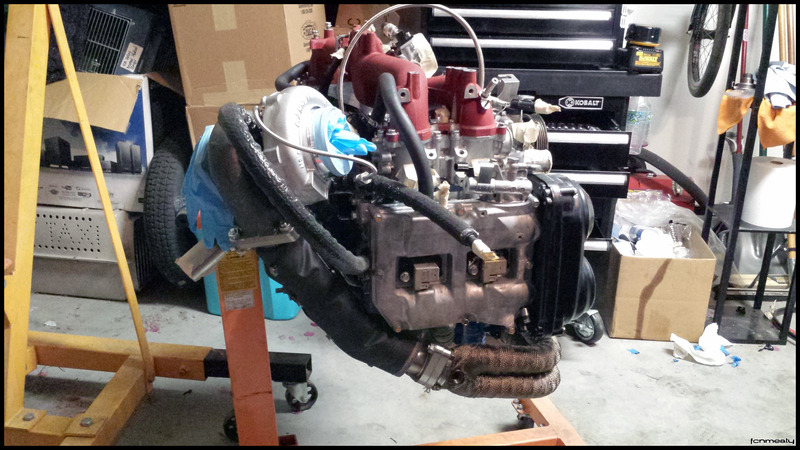 Picked up the engine from Outfront! 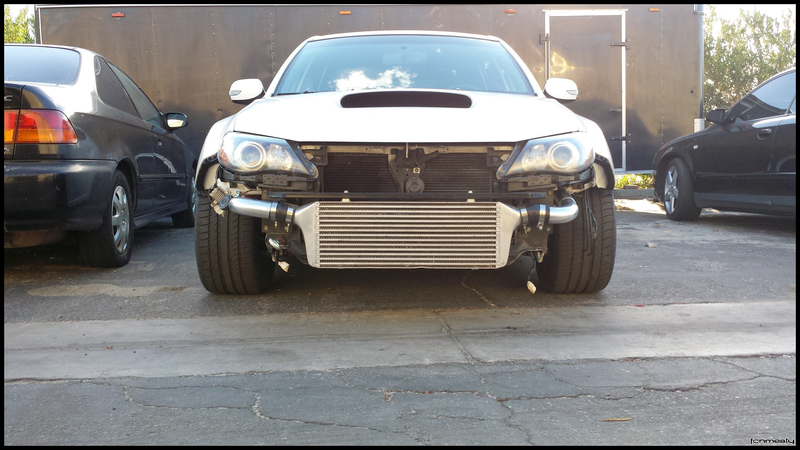 Perrin/Setrab oil cooler and Hella horns shenanigans. 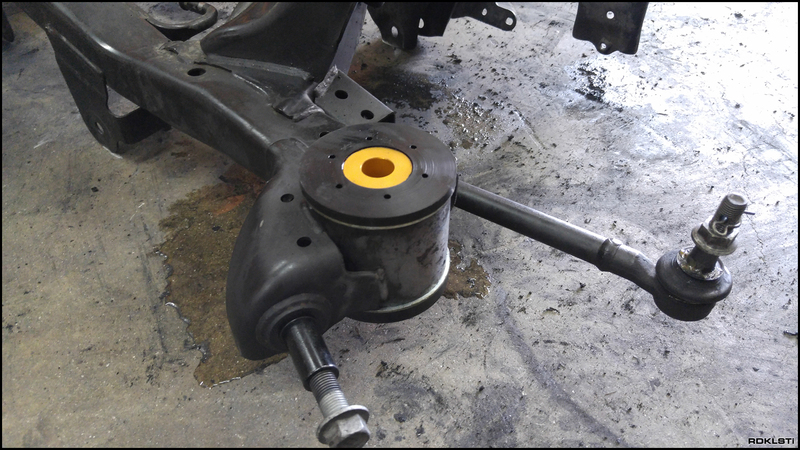 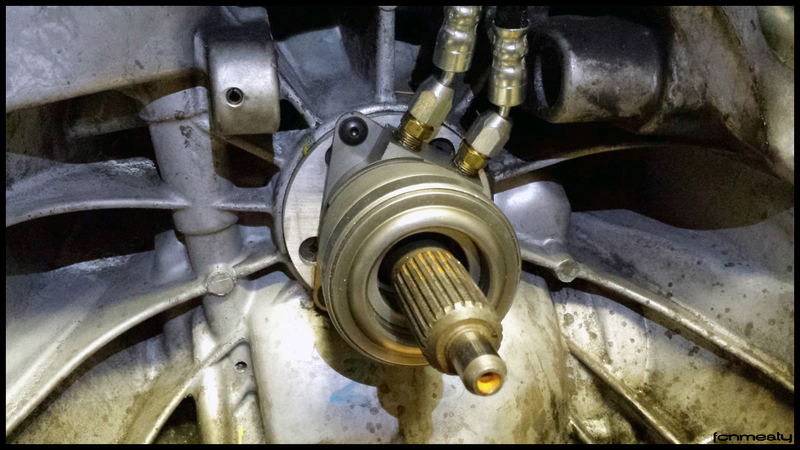 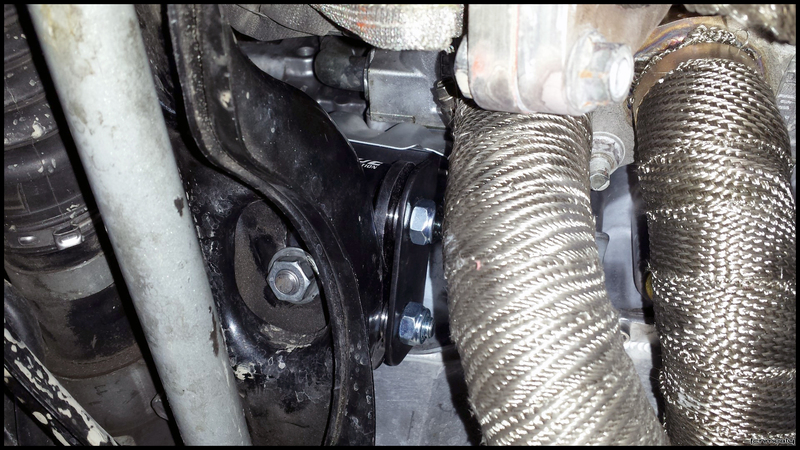 Rear diff back in, Driveshaft Shop carbon driveshaft installed. 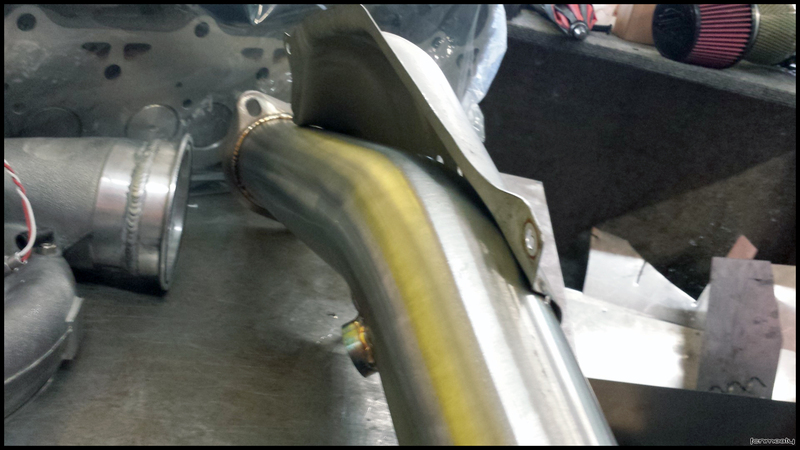 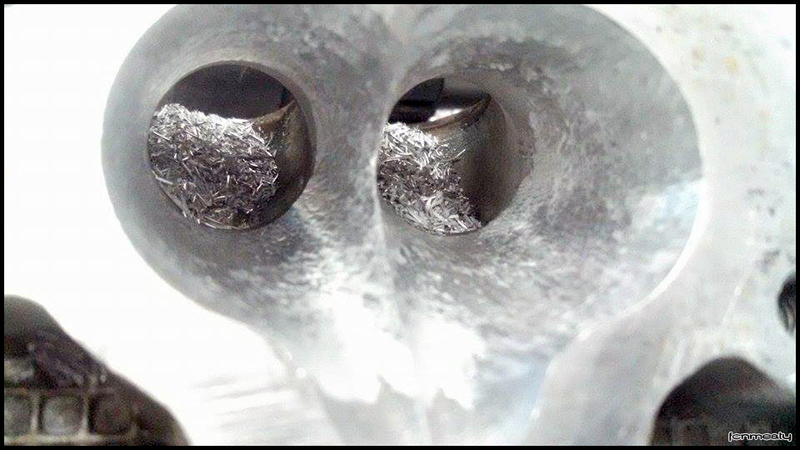 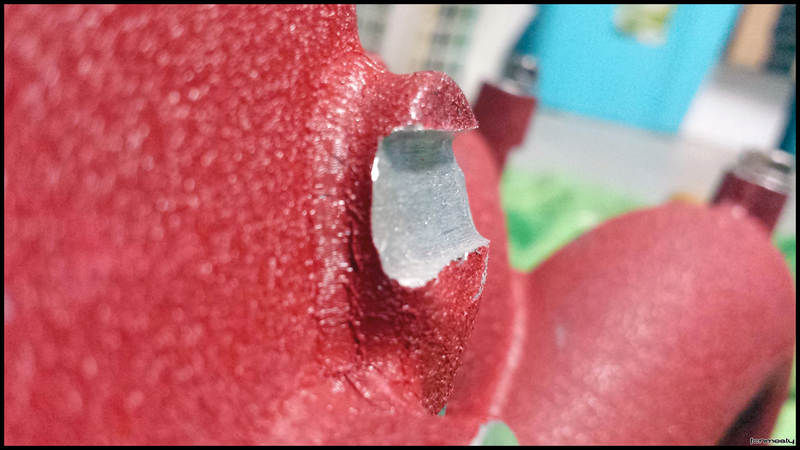 Full gamut of poly bushings for the rear end. 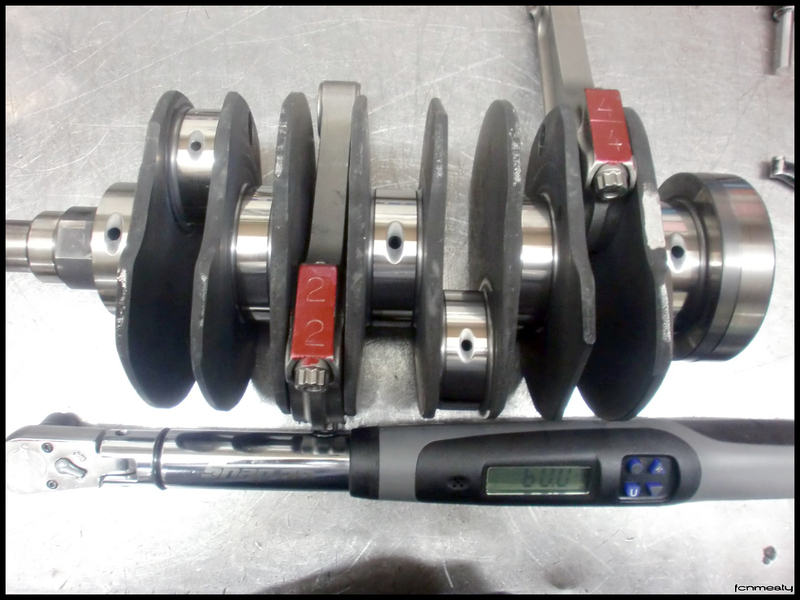 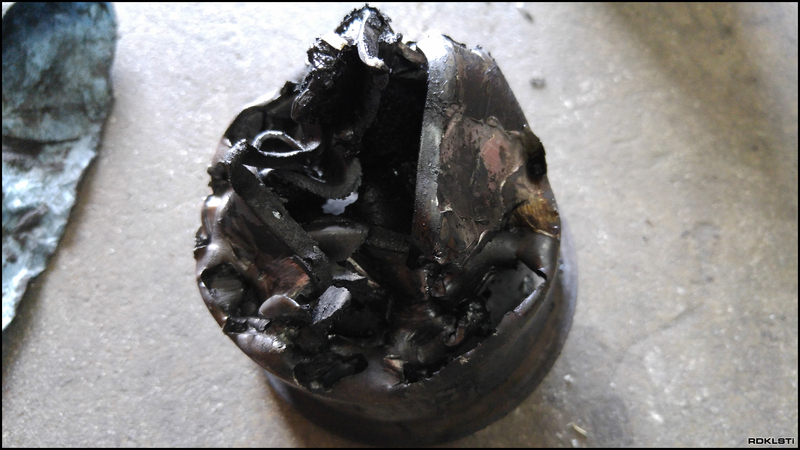 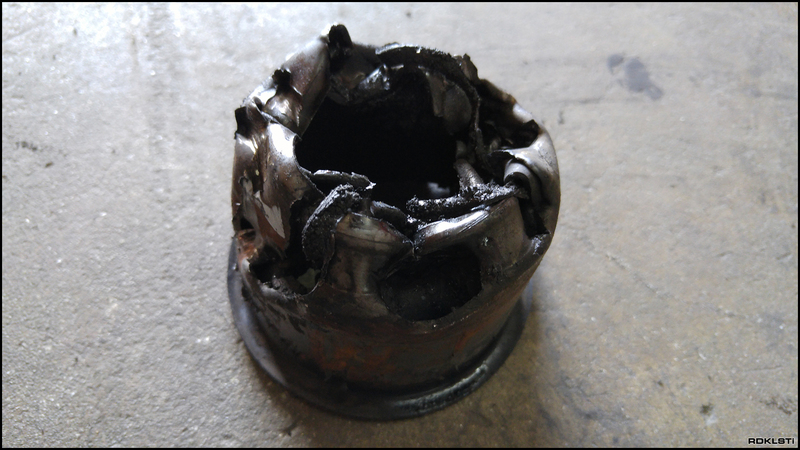 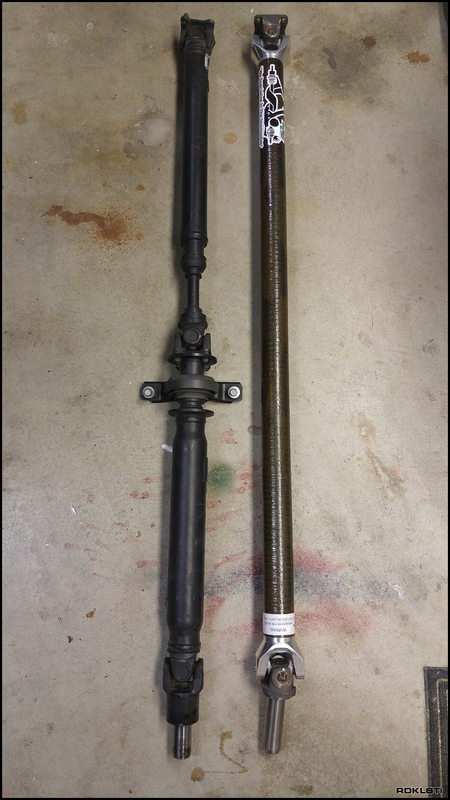 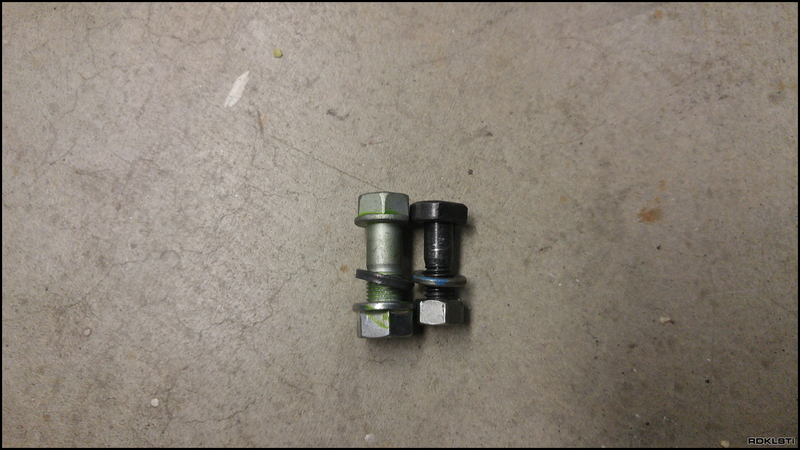 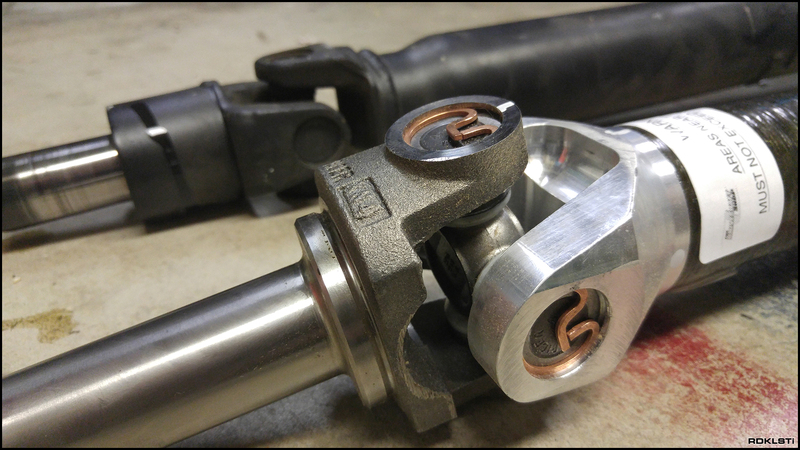 The Driveshaft Shop carbon 1 piece drive shaft, next to OEM counterpart. 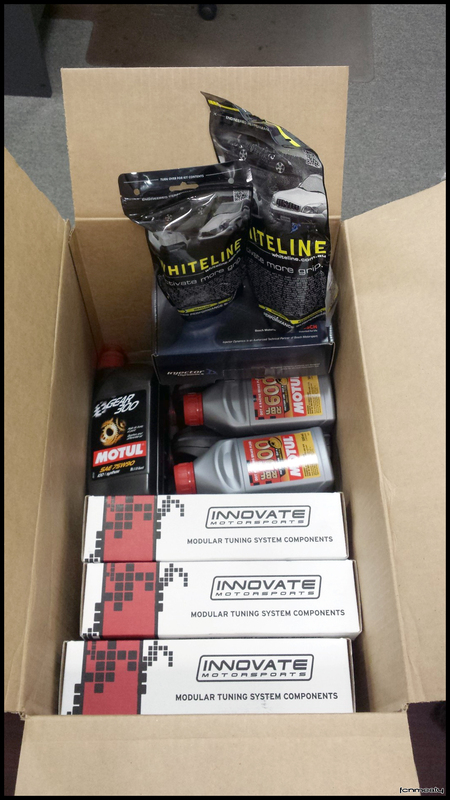 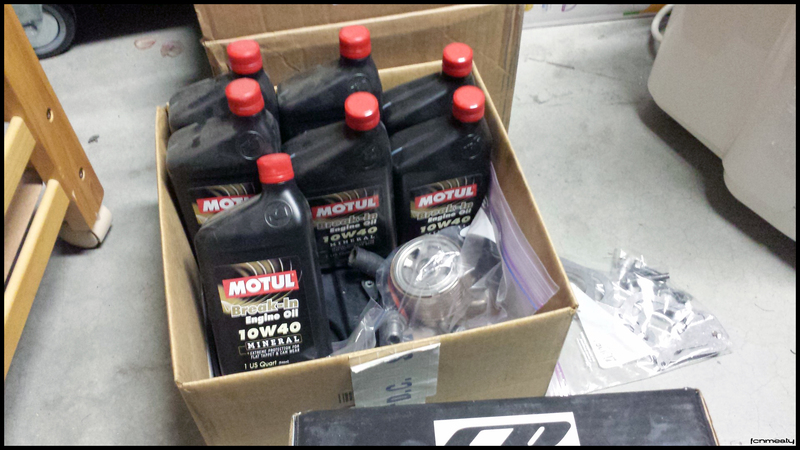 Boxes of parts are always exciting. 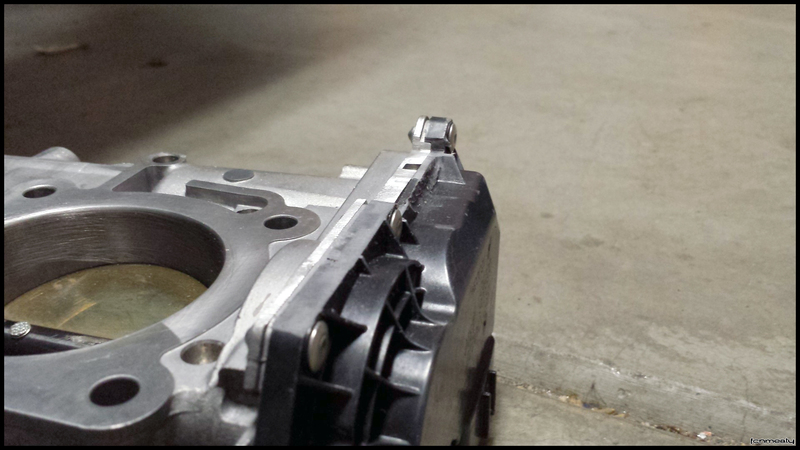 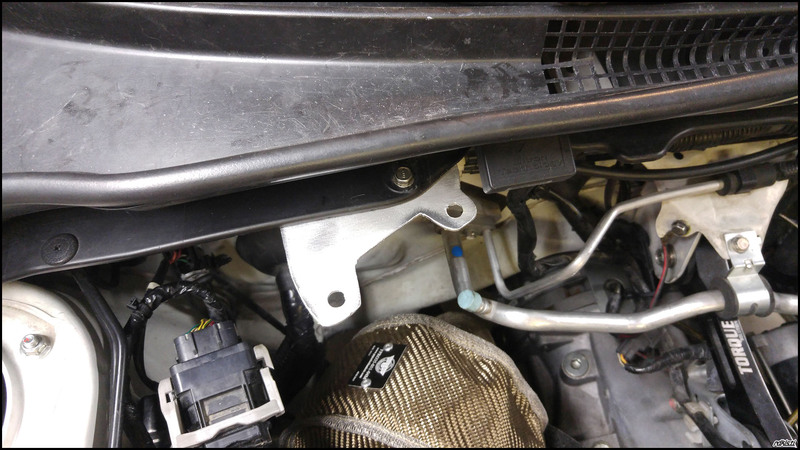 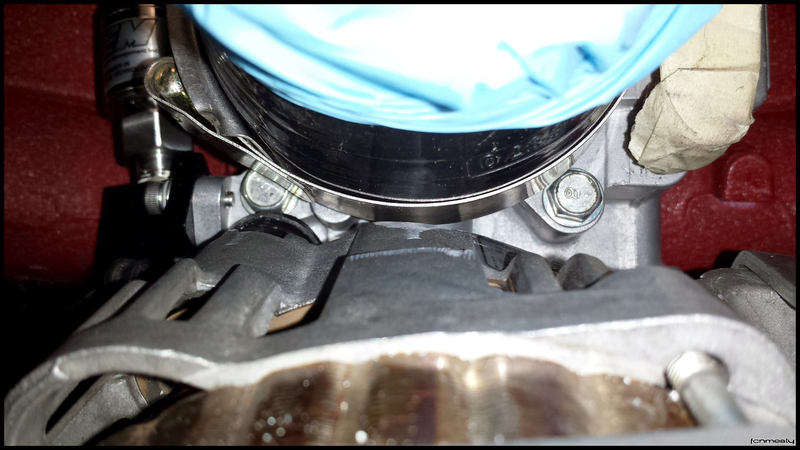 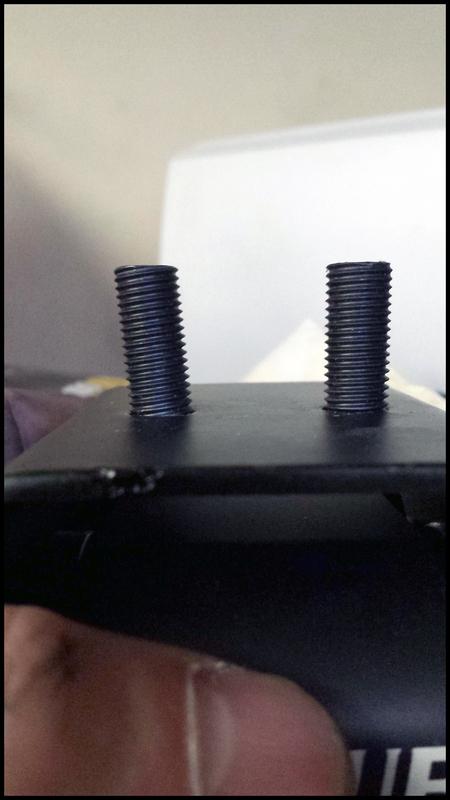 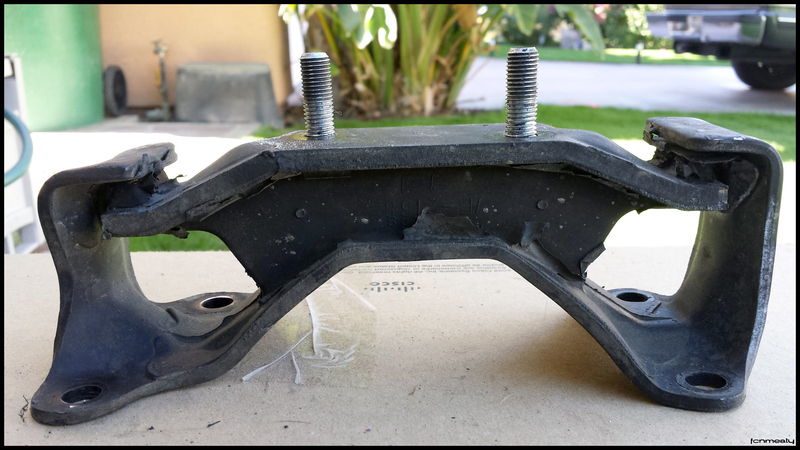 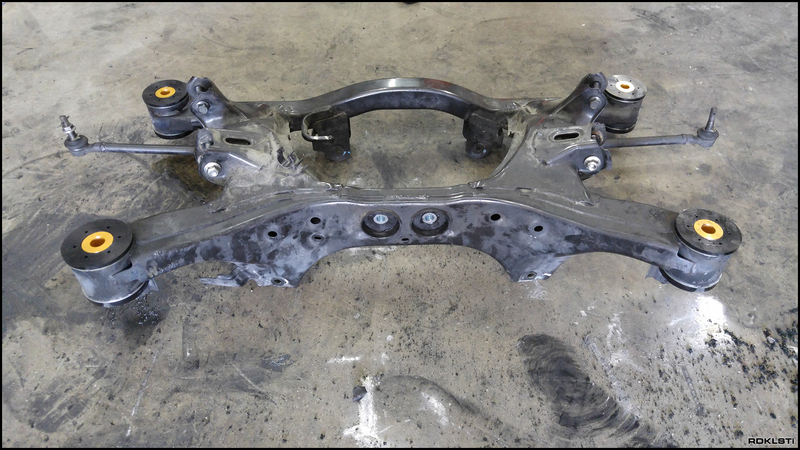 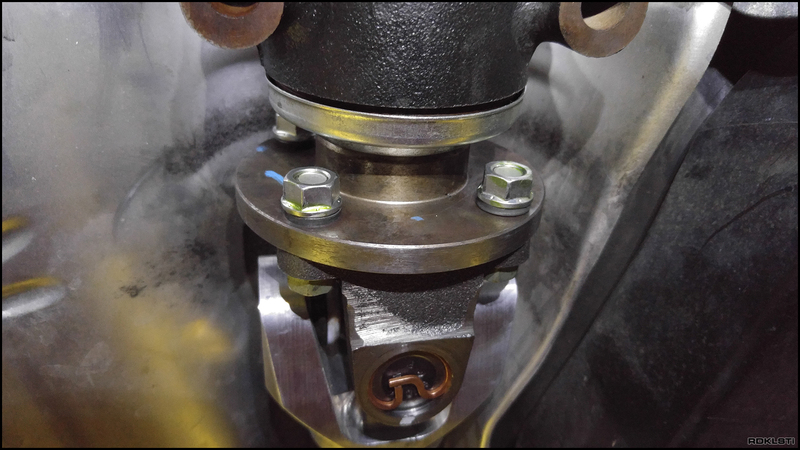 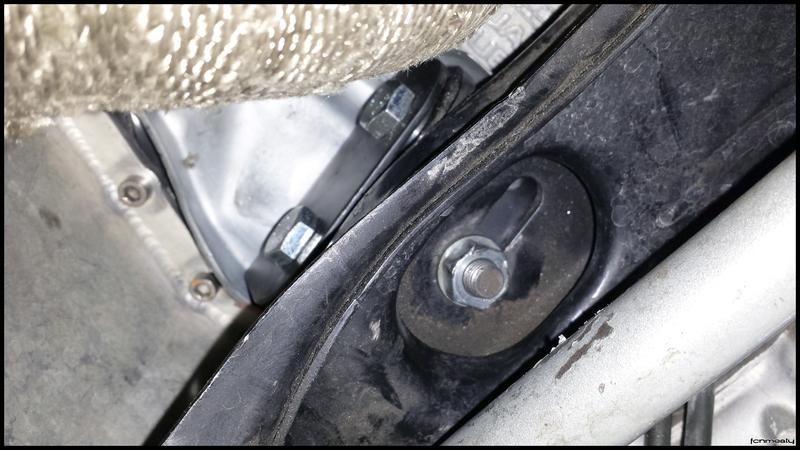 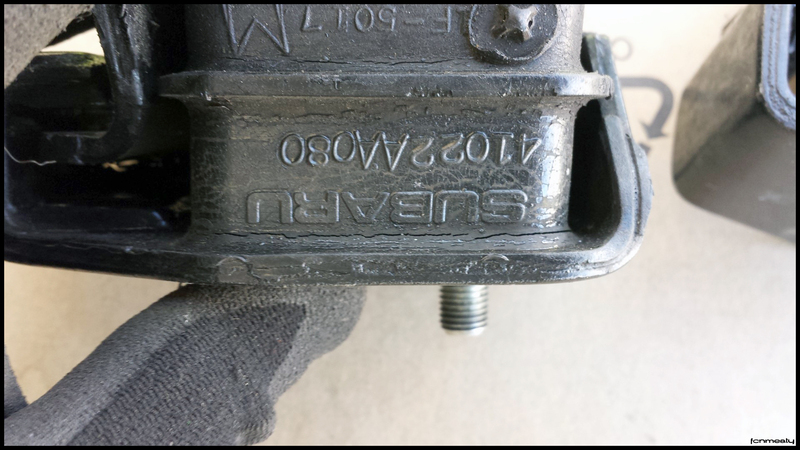 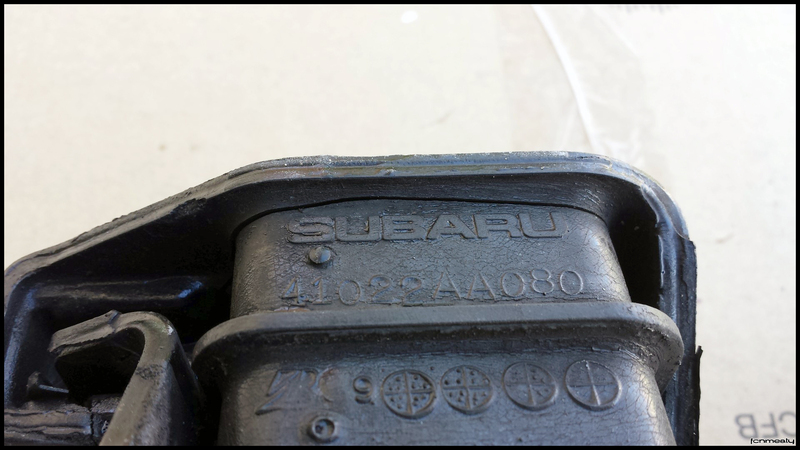 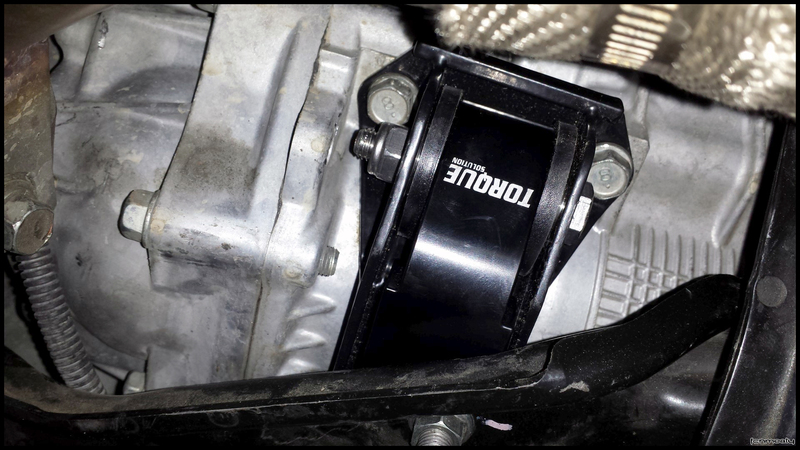 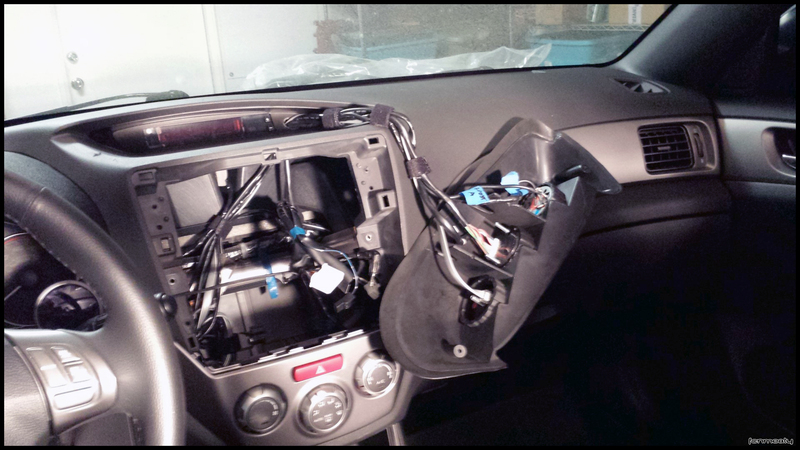 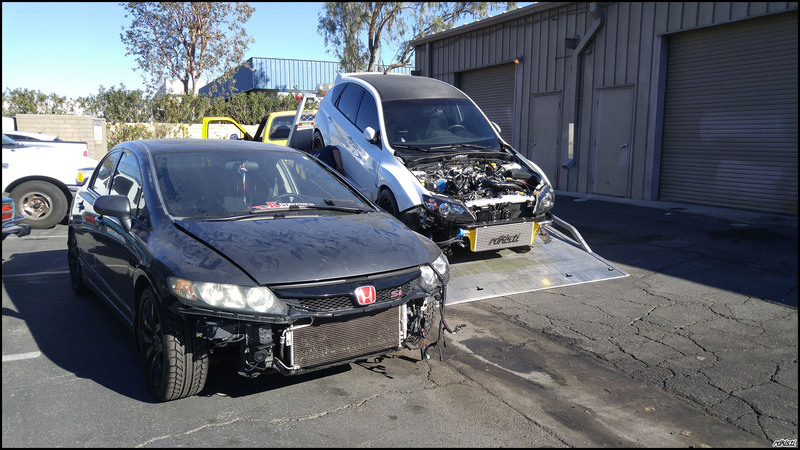 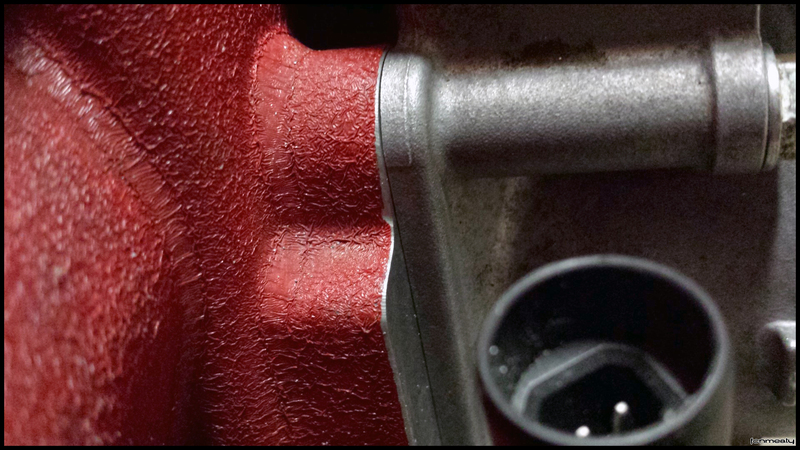 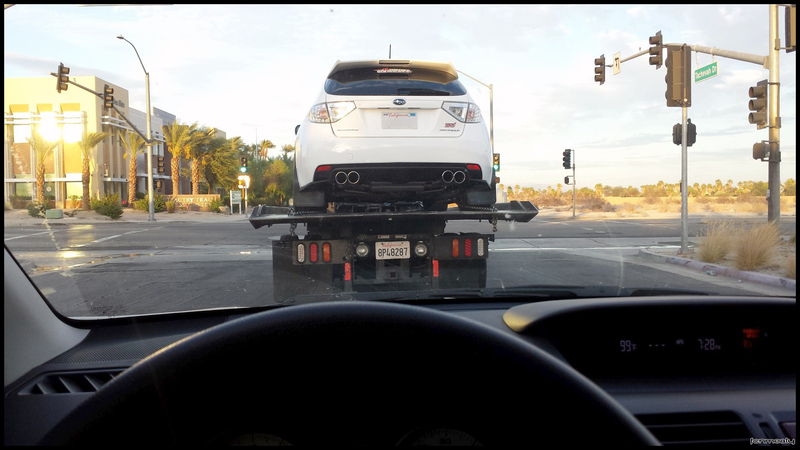 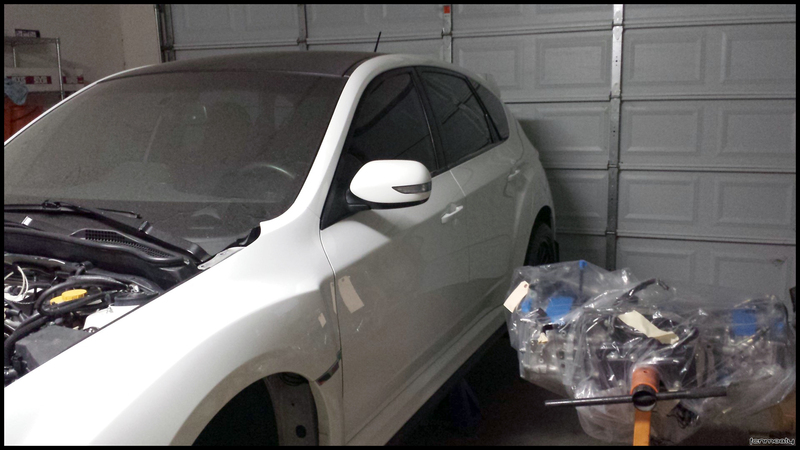 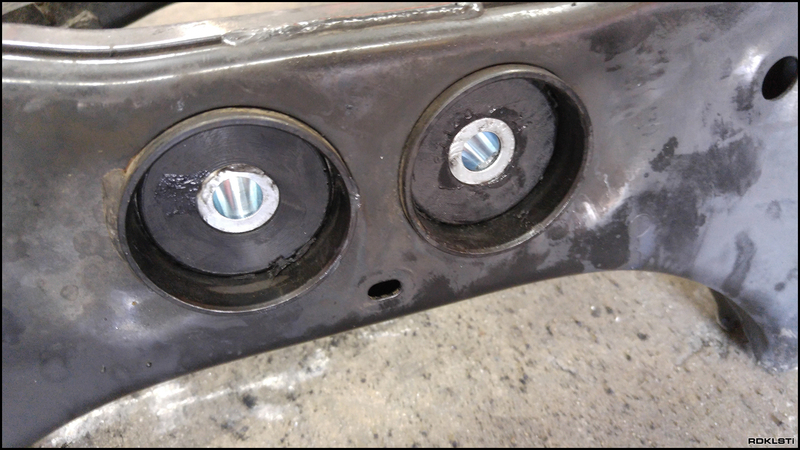 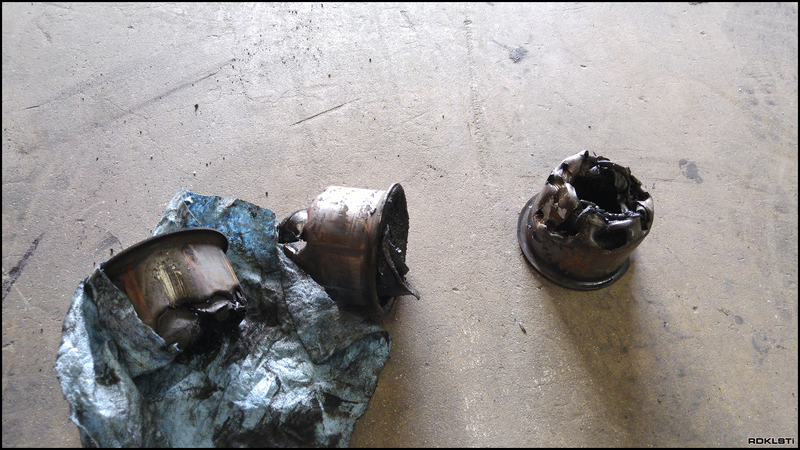 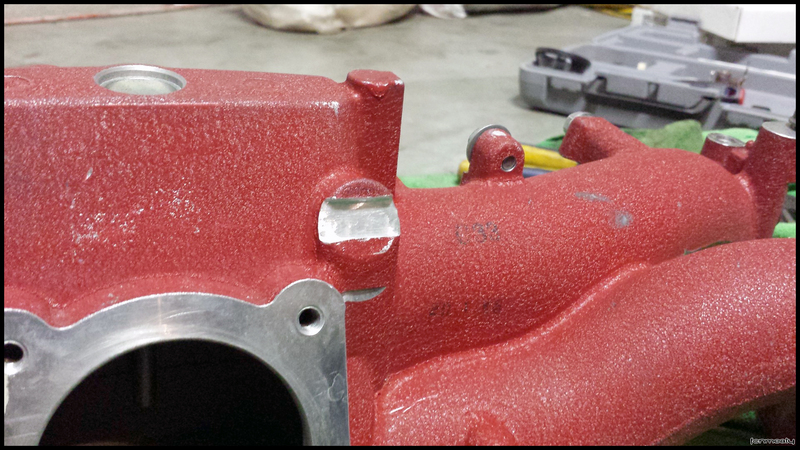 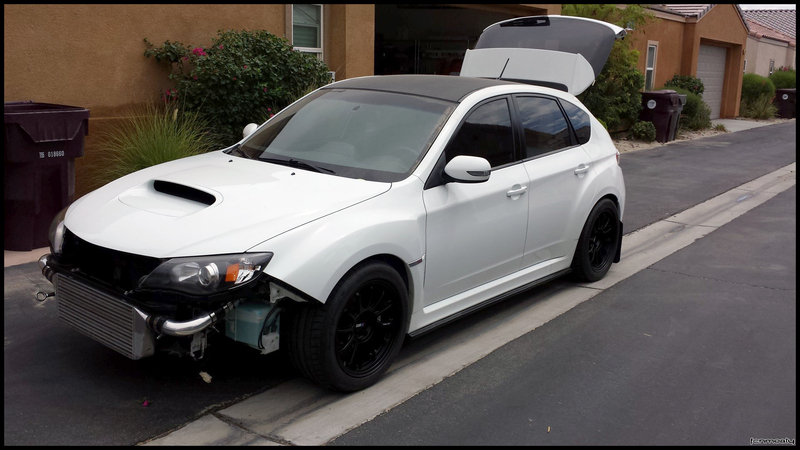 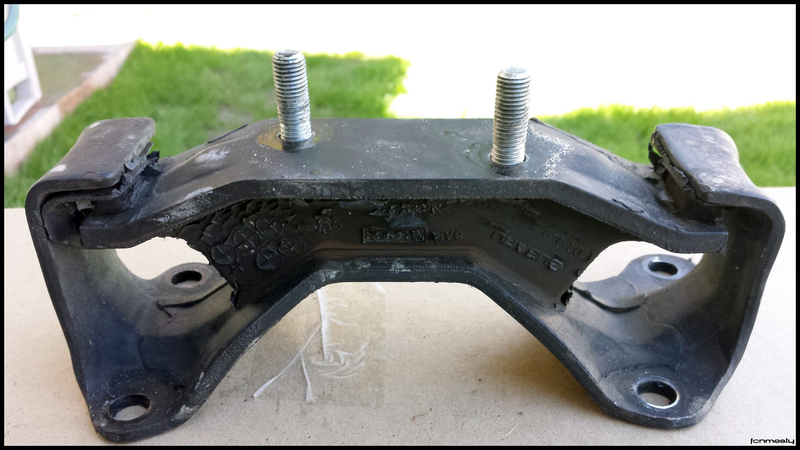 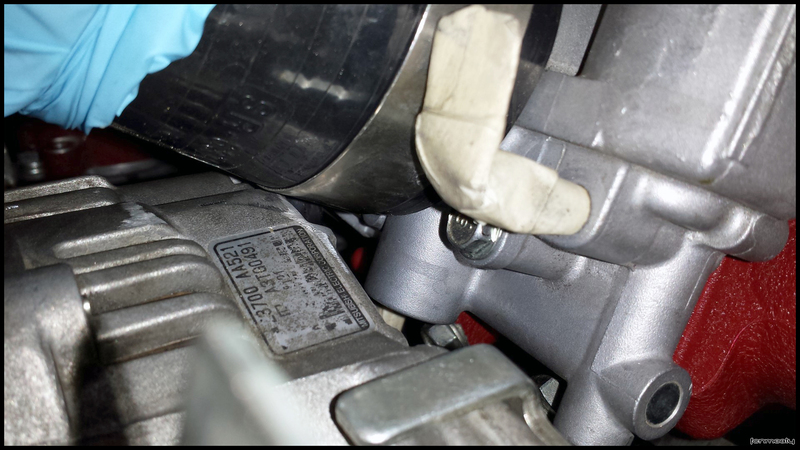 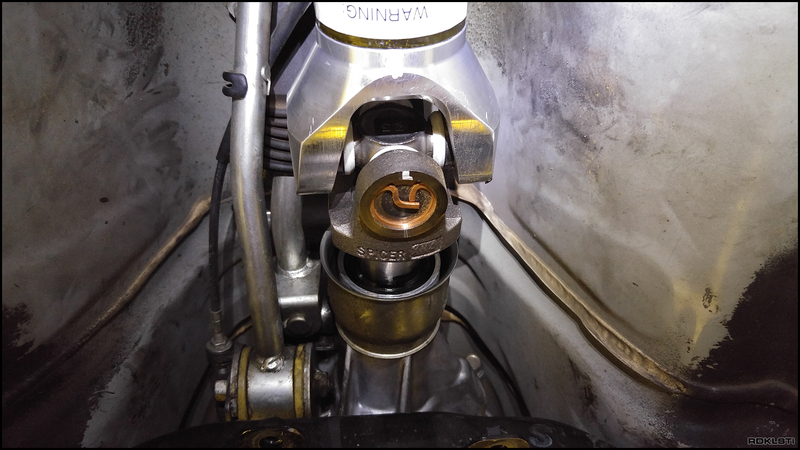 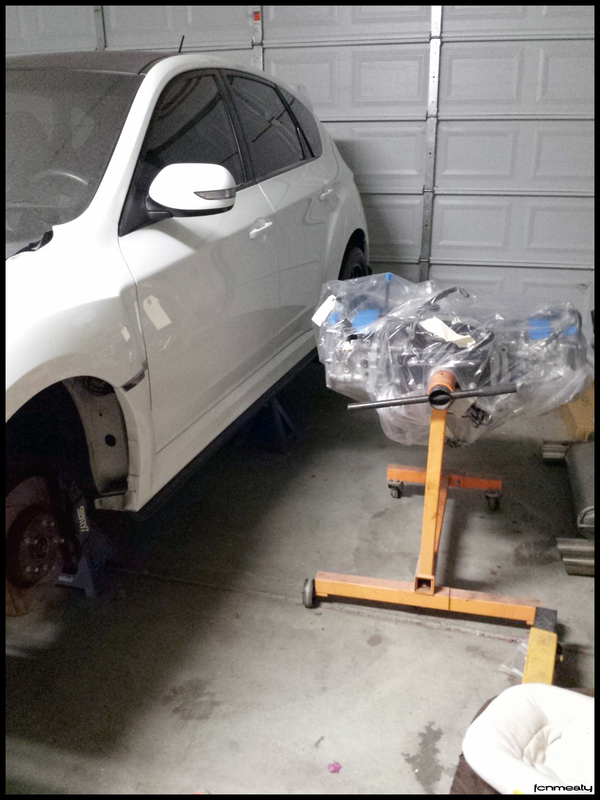 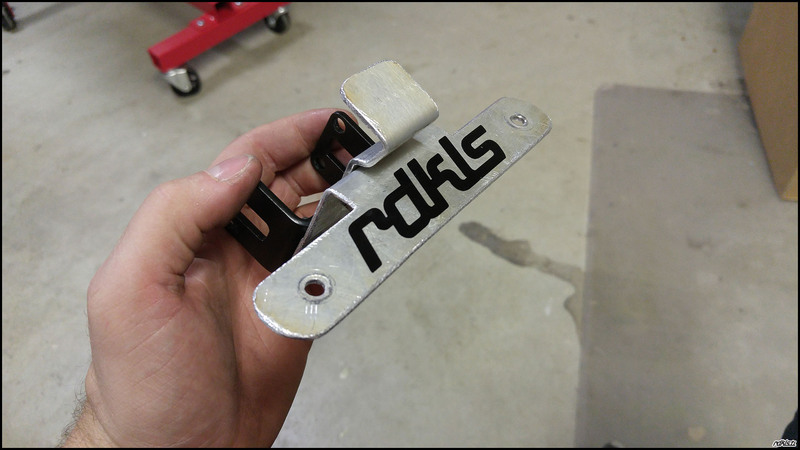 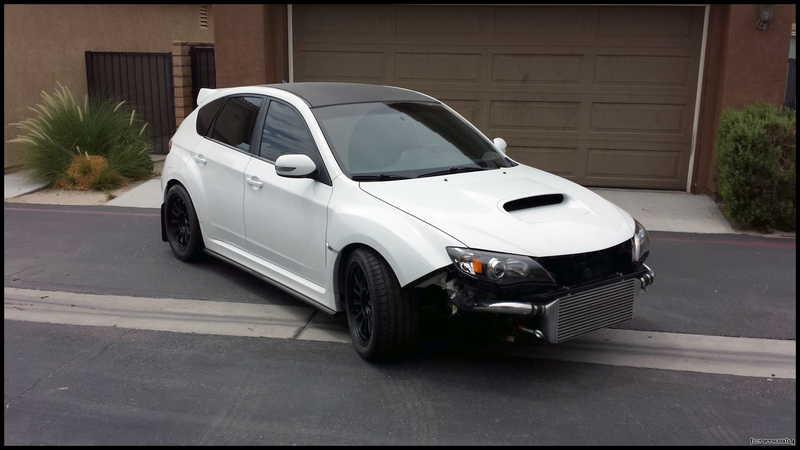 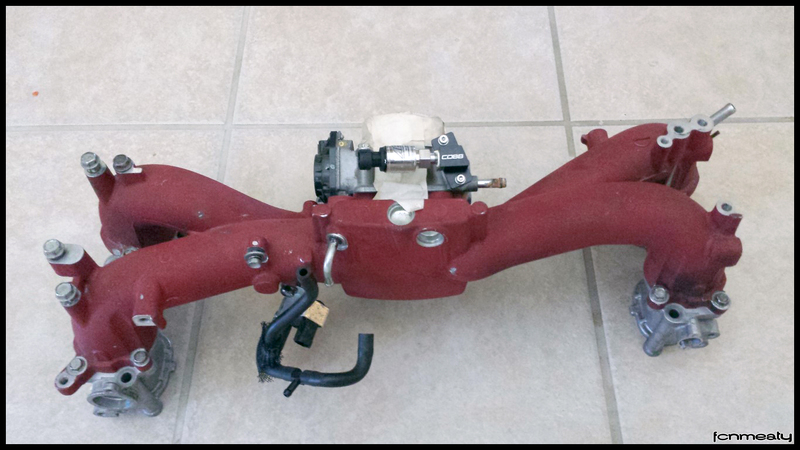 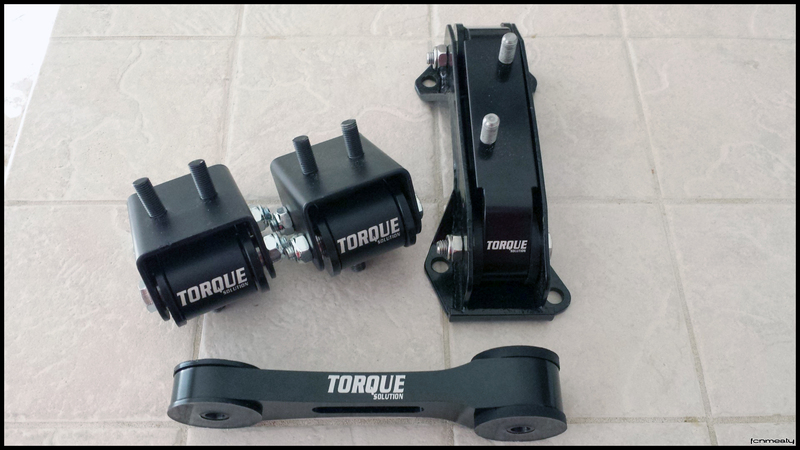 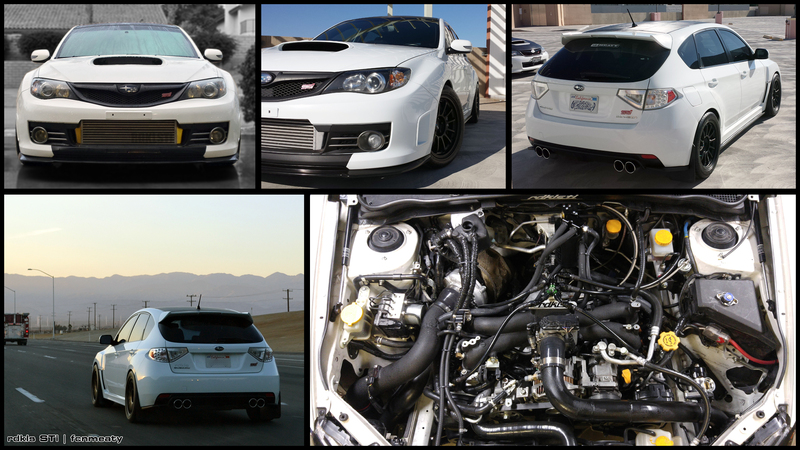 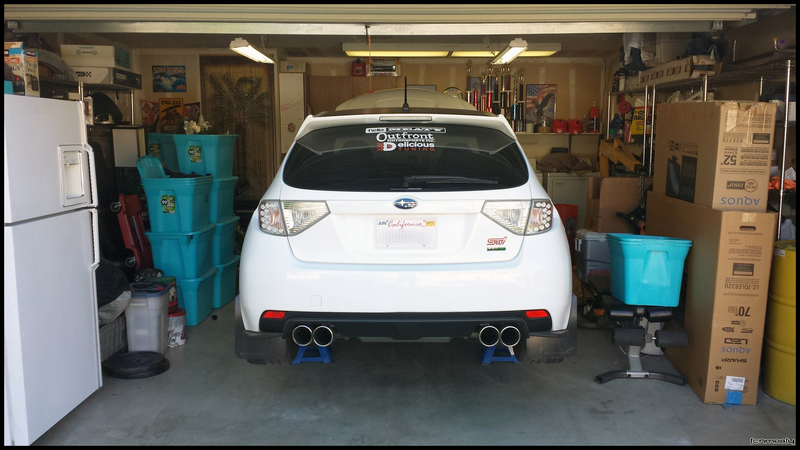 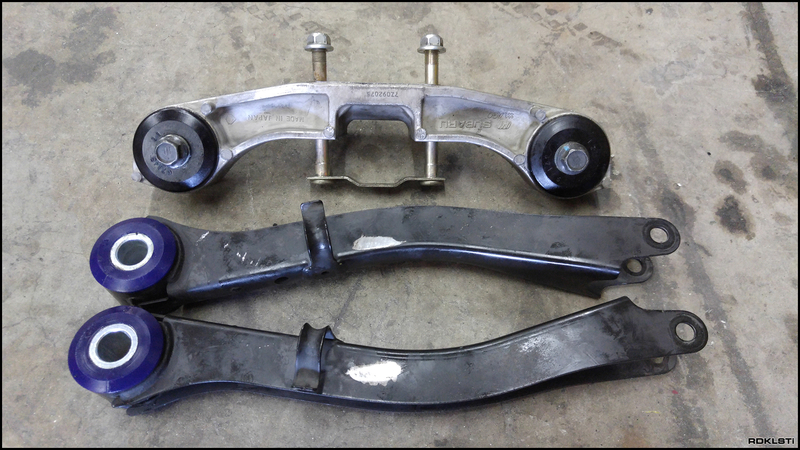 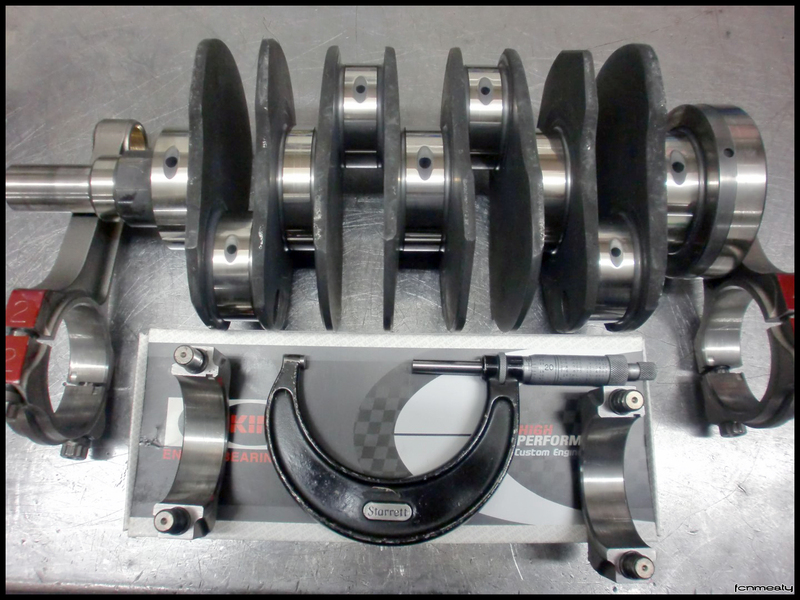 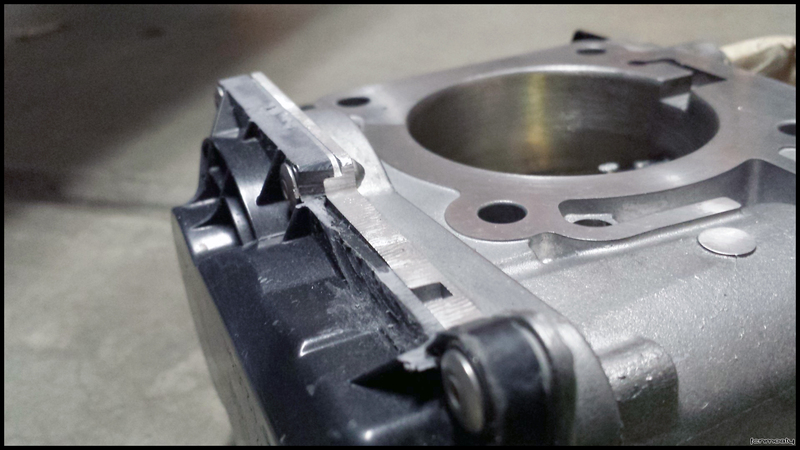 Replaced STi Group-N mounts with Torque Solution mounts (engine, transmission and pitch-stop). 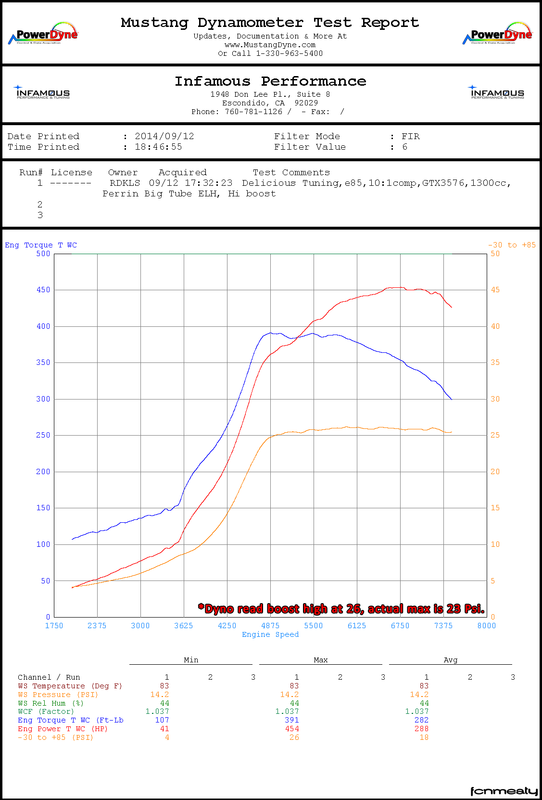 Super happy with the power for now, but we ran out of fuel at 23 Psi. 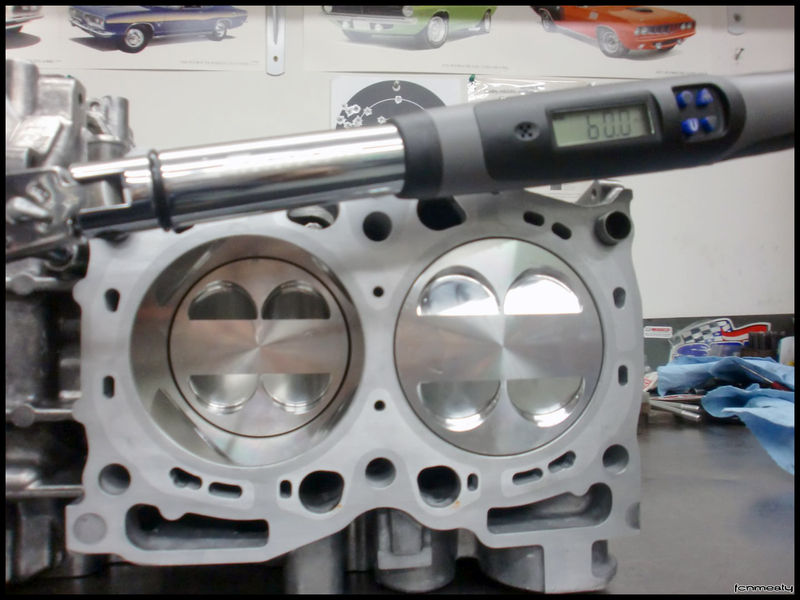 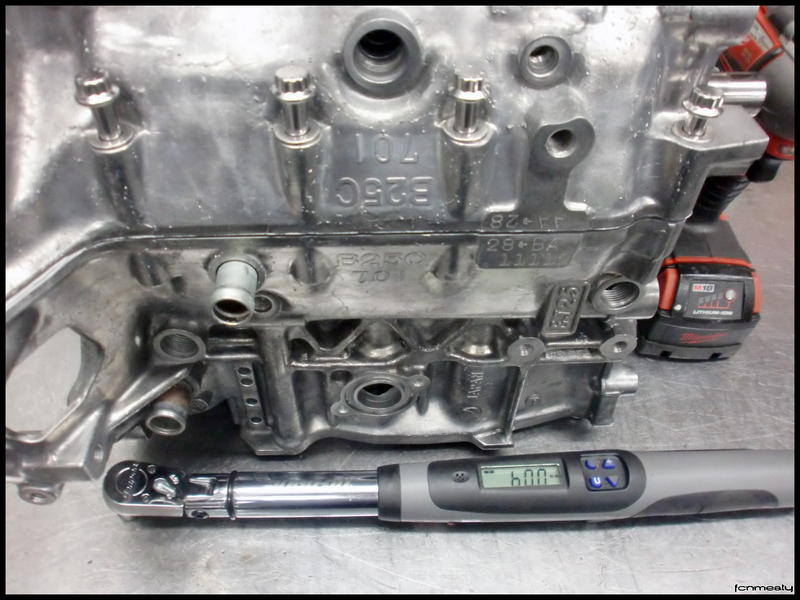 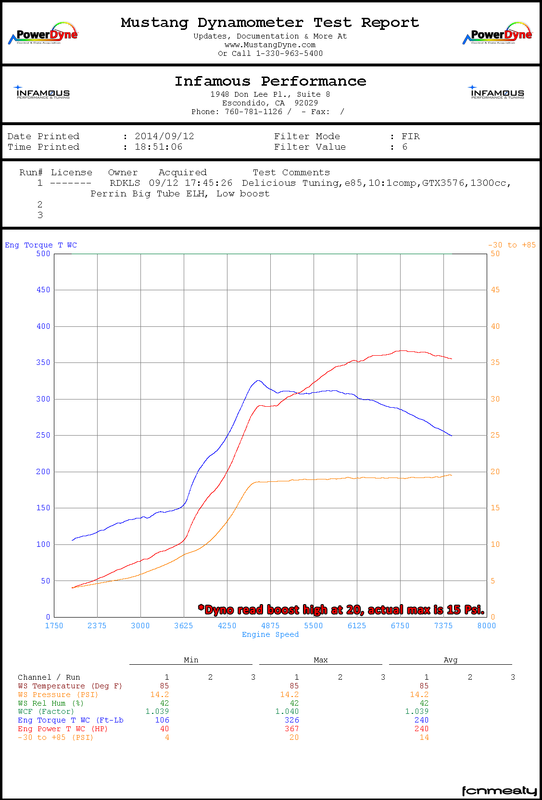 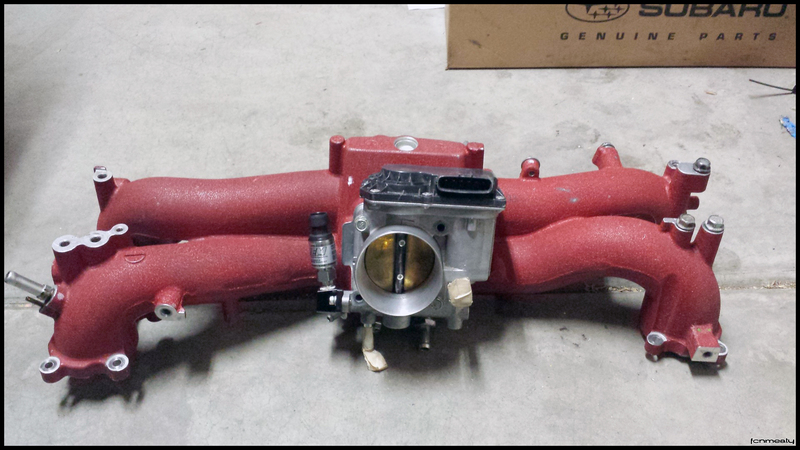 I see 30+ Psi in my future after adjusting and making some fuel delivery changes. 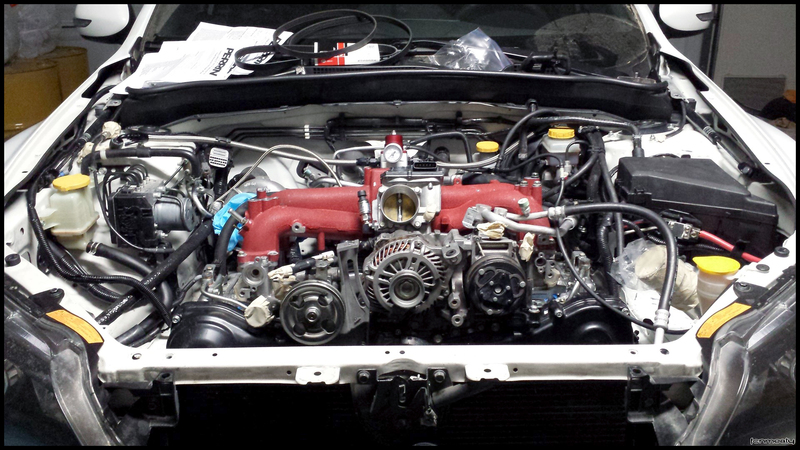 Finally got it running this week. 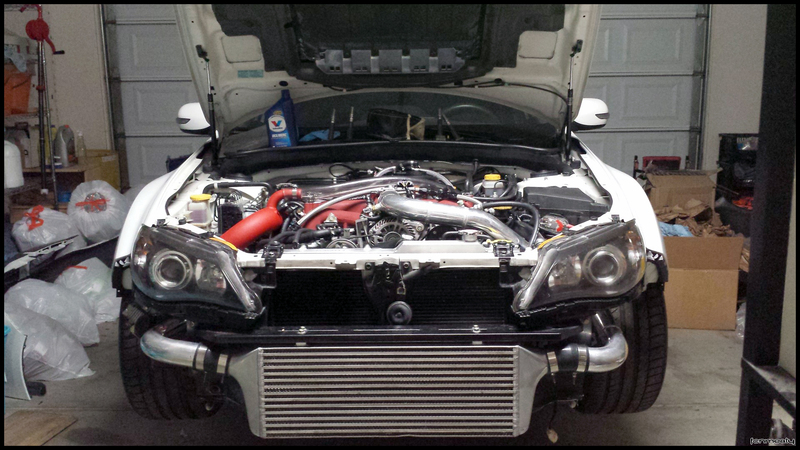 Just need to sort out a couple fitment issues and start breaking it in. 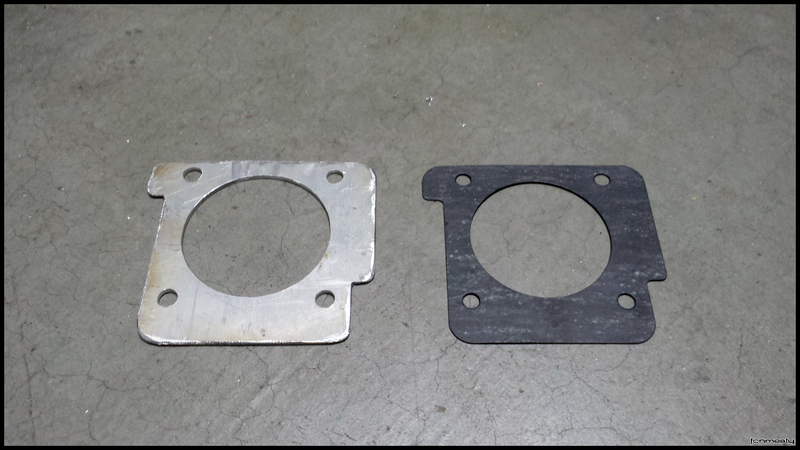 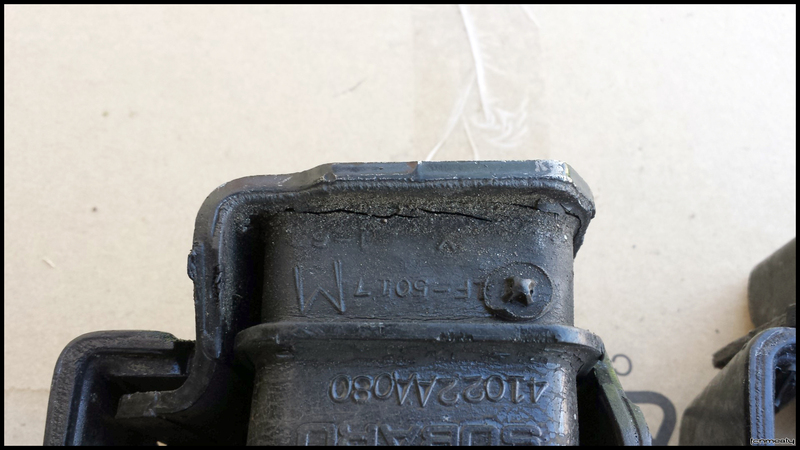 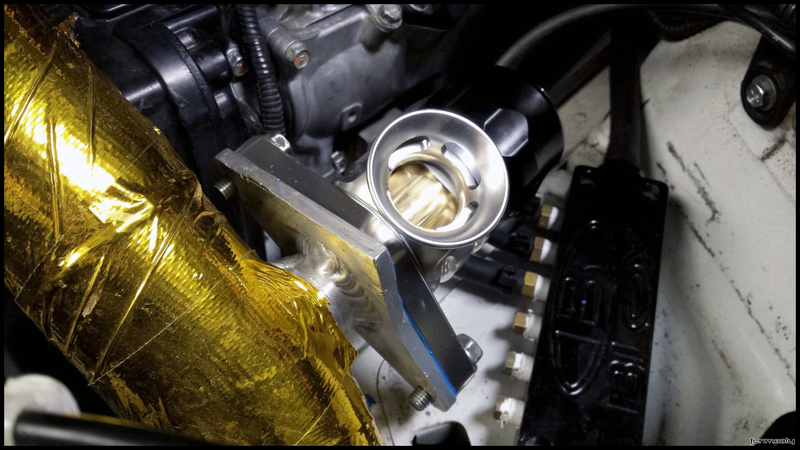 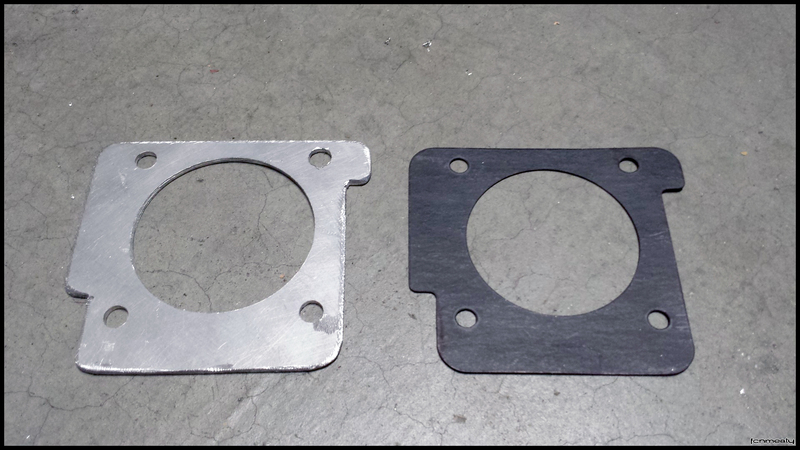 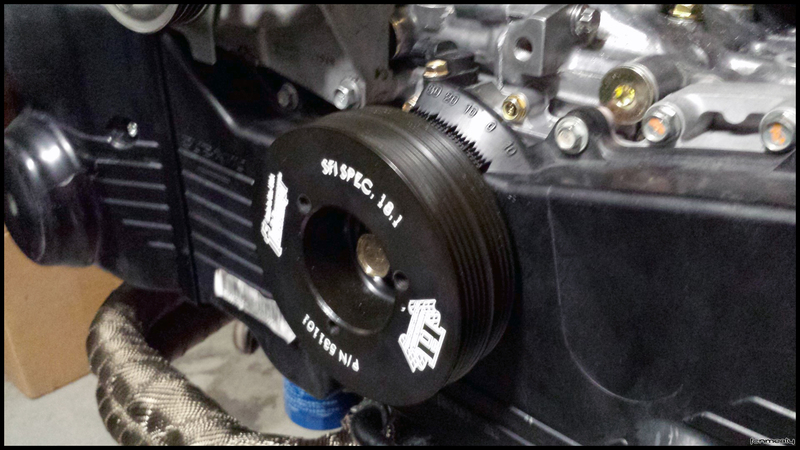 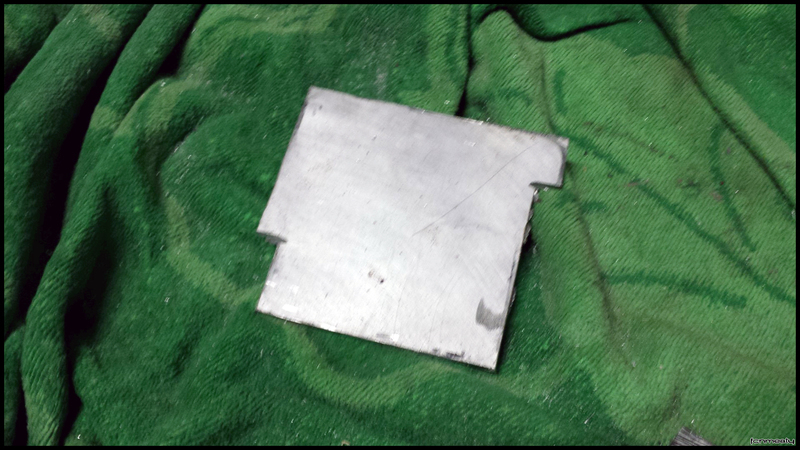 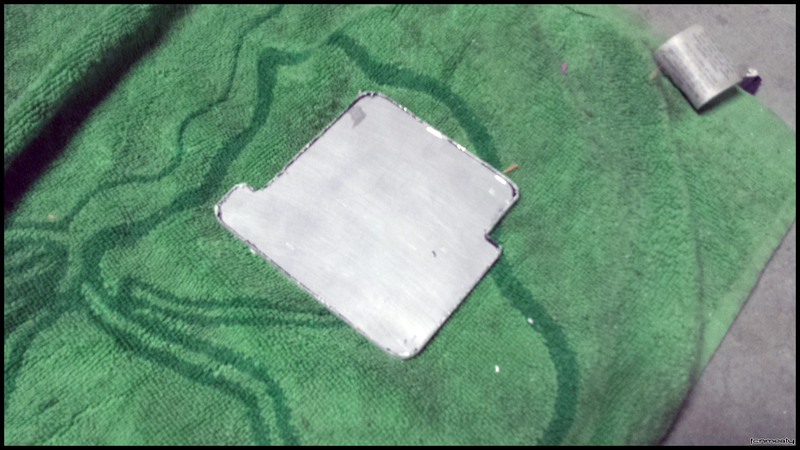 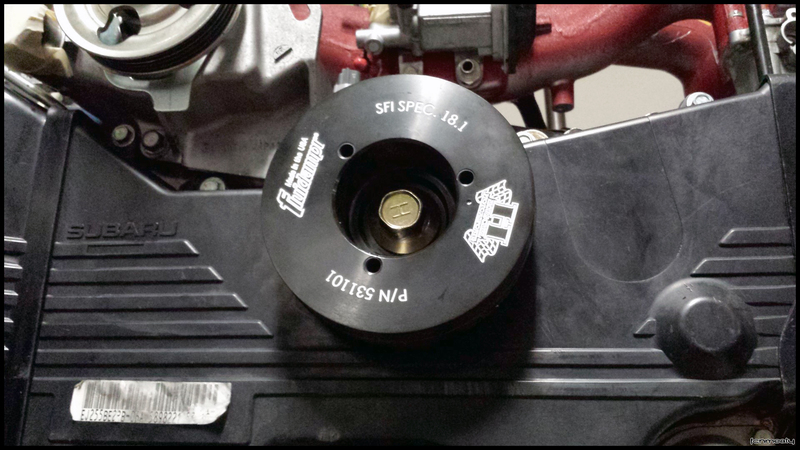 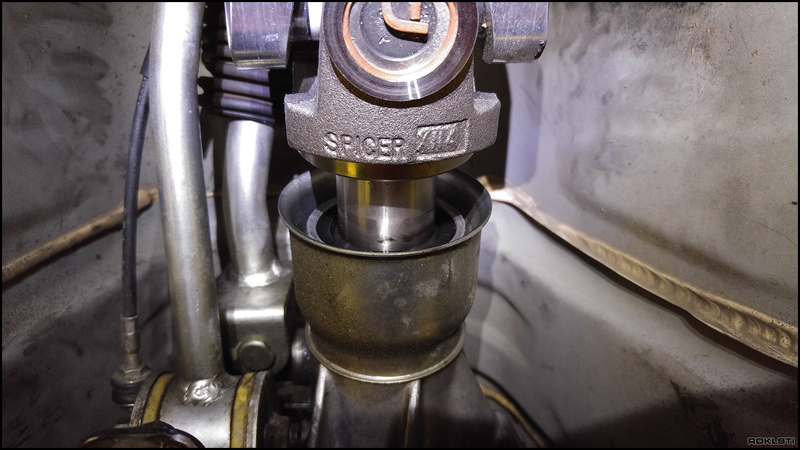 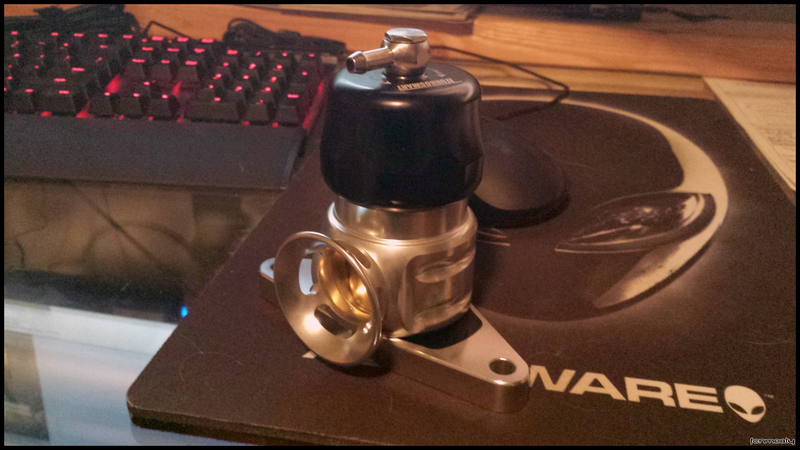 Snagged an angle-grinder from Home Depot and fabbed up a throttle body spacer. 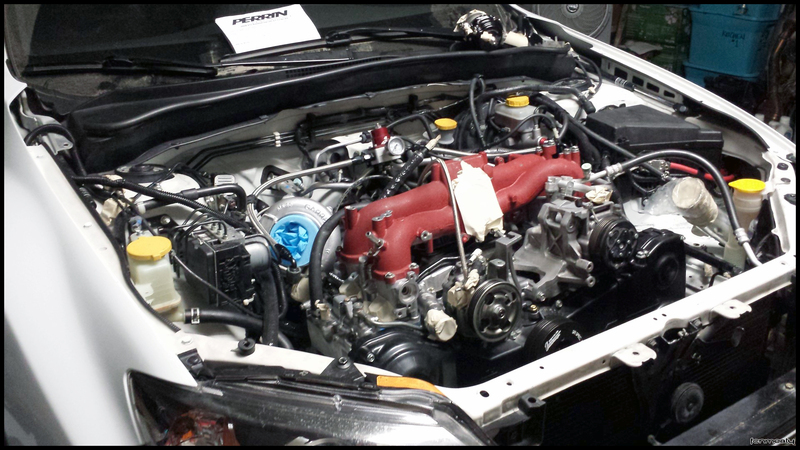 Engine bay finally complete (a couple things to clean up, but it’s fireable). 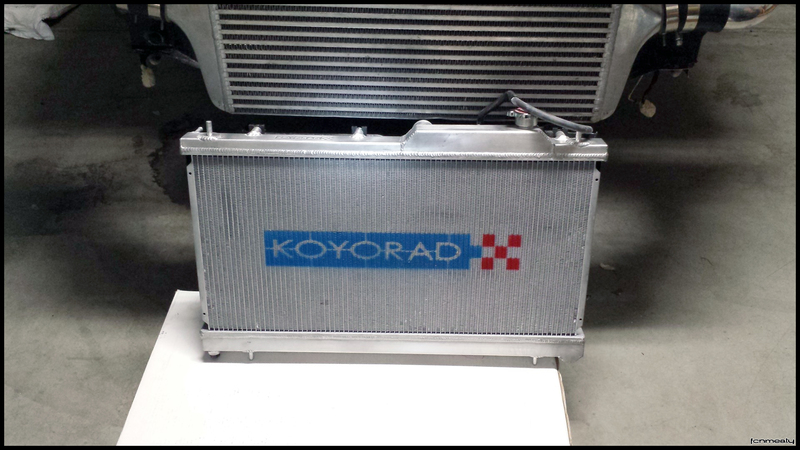 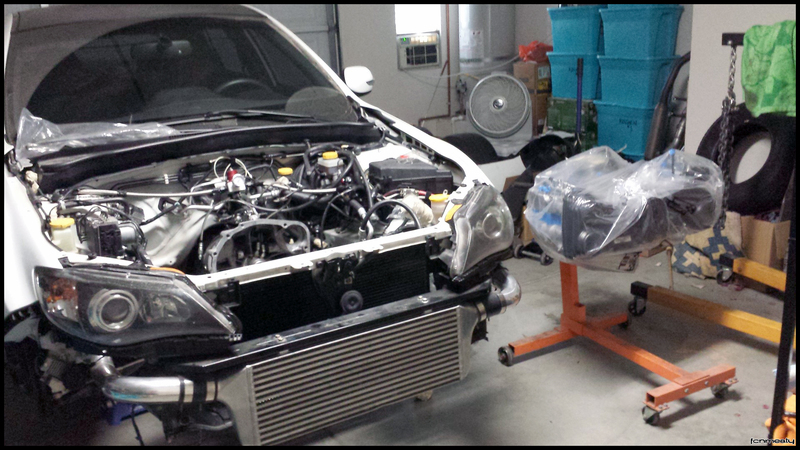 Radiator shroud waiting for install until after coolant system is burped. 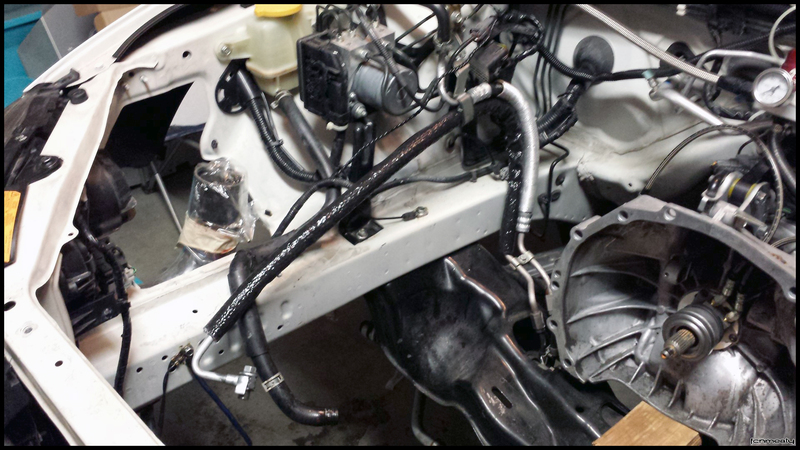 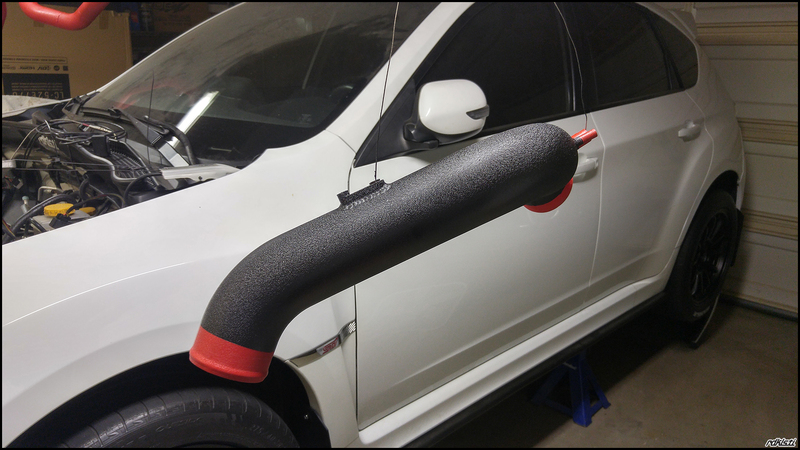 Charge pipes fabbed up today. 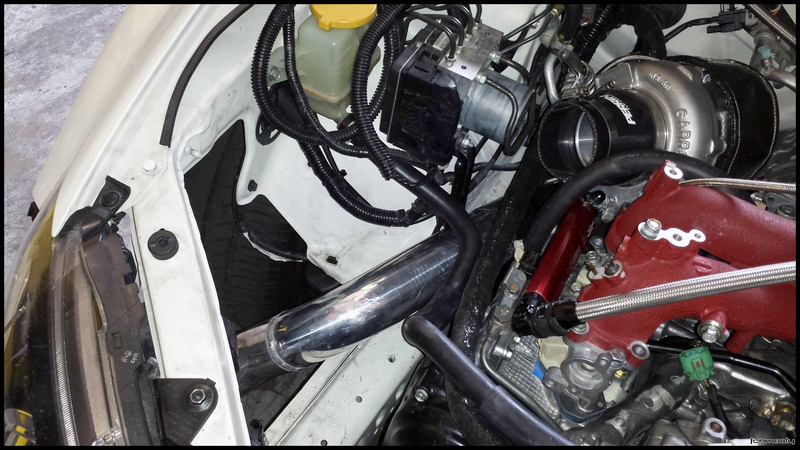 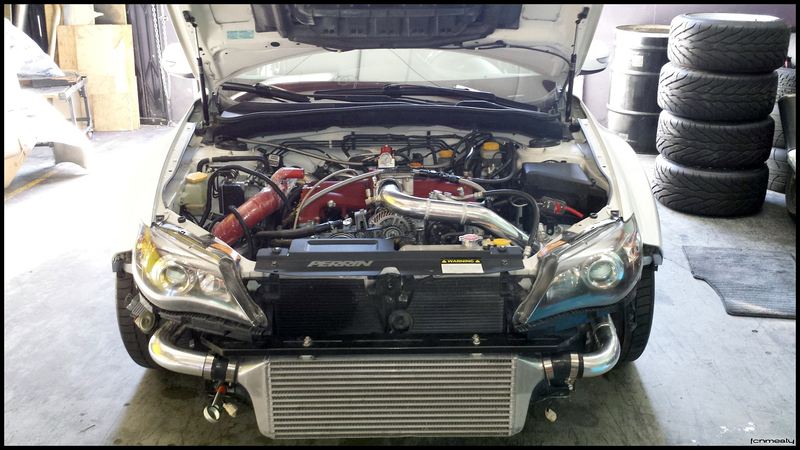 Couple odds n’ ends, mached up everything in the engine bay to get charge pipes fabricated the following day. 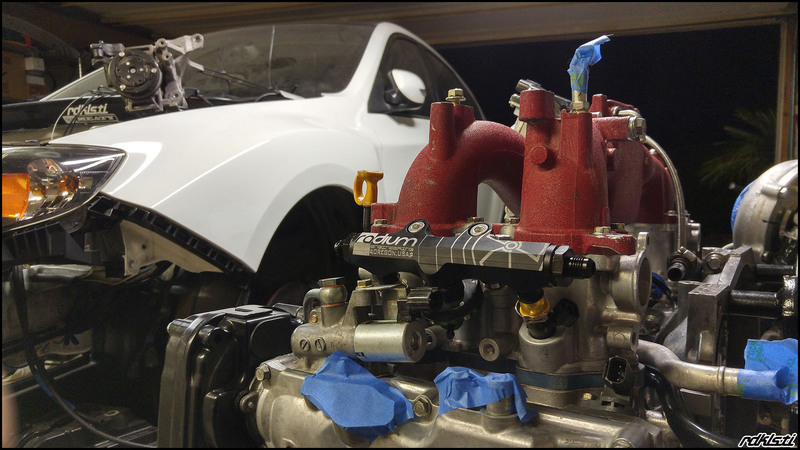 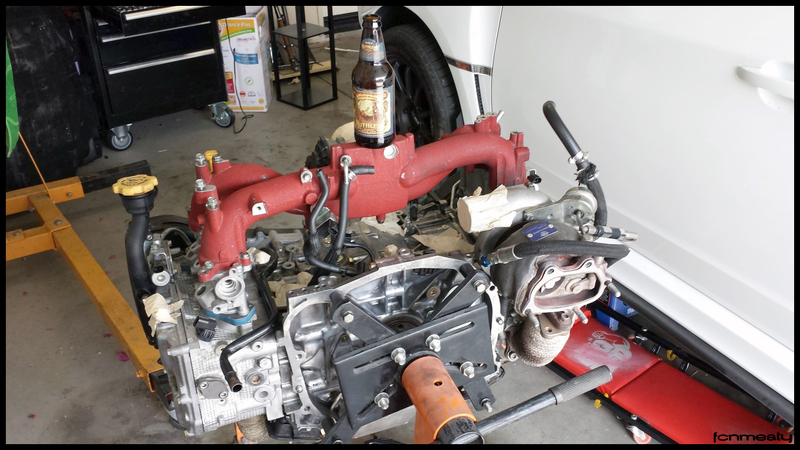 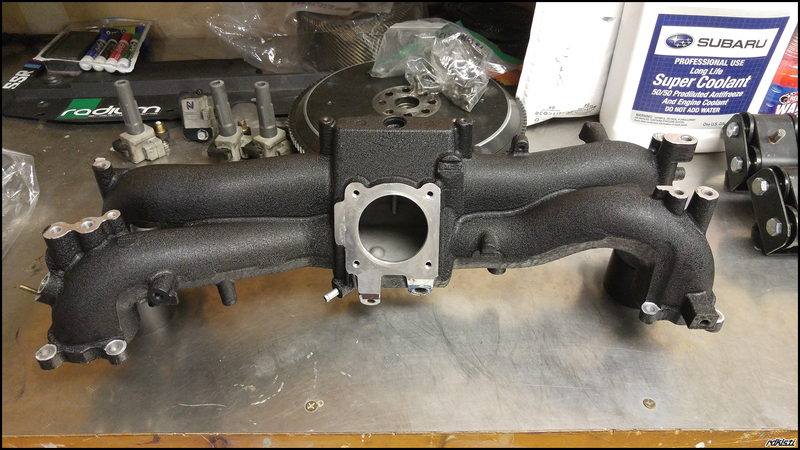 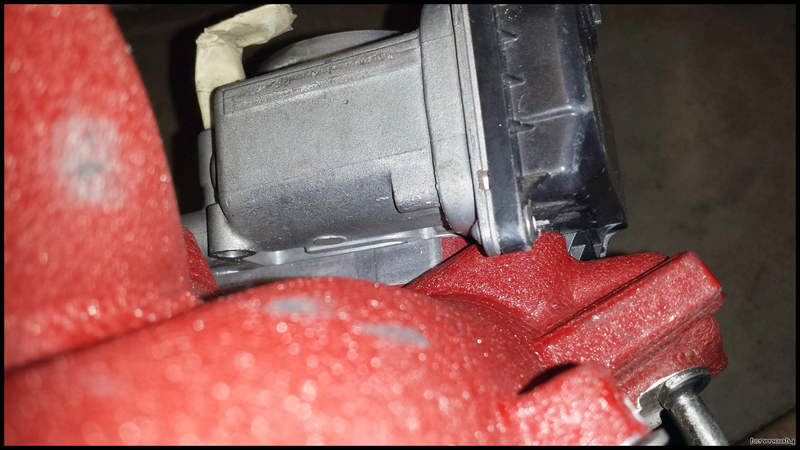 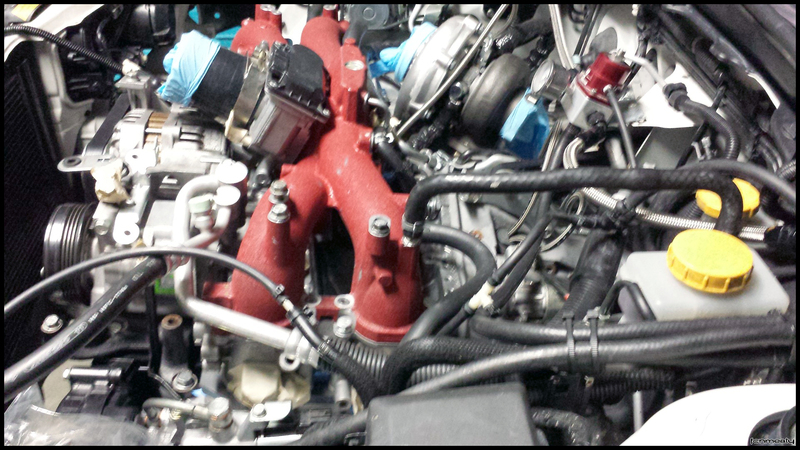 Modded intake manifold and throttle body so I could rotate the intake manifold. 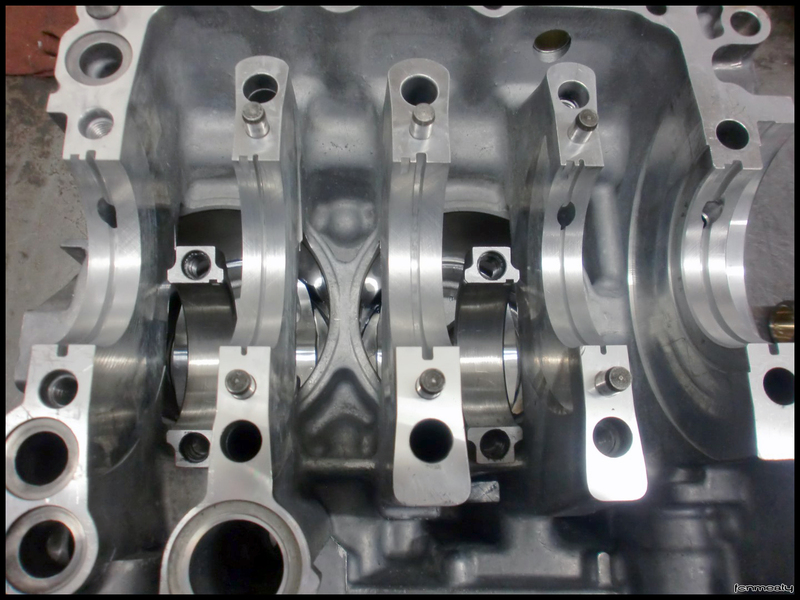 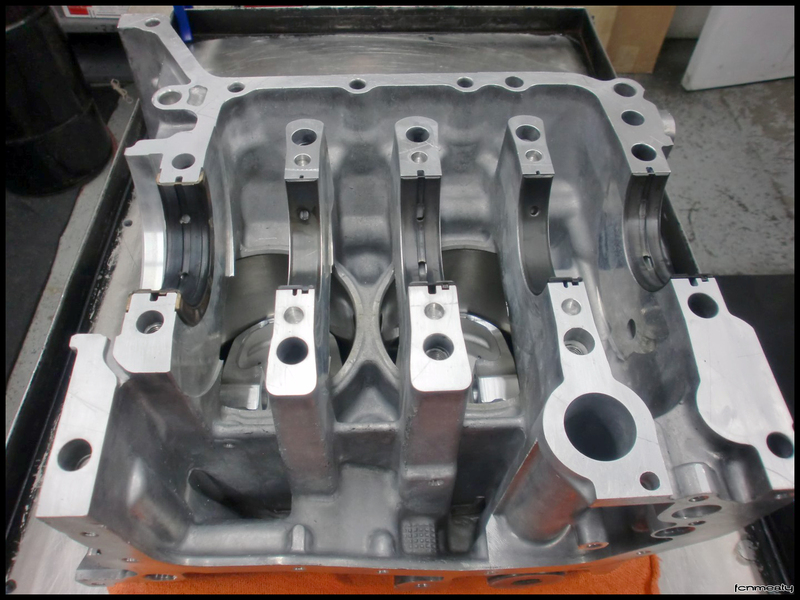 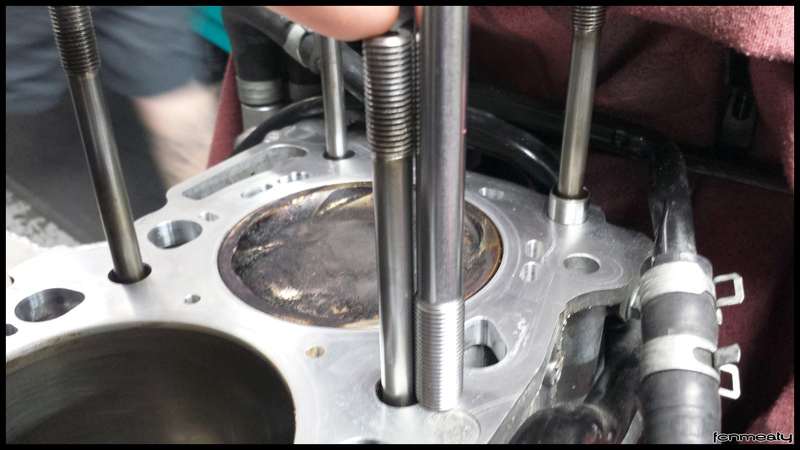 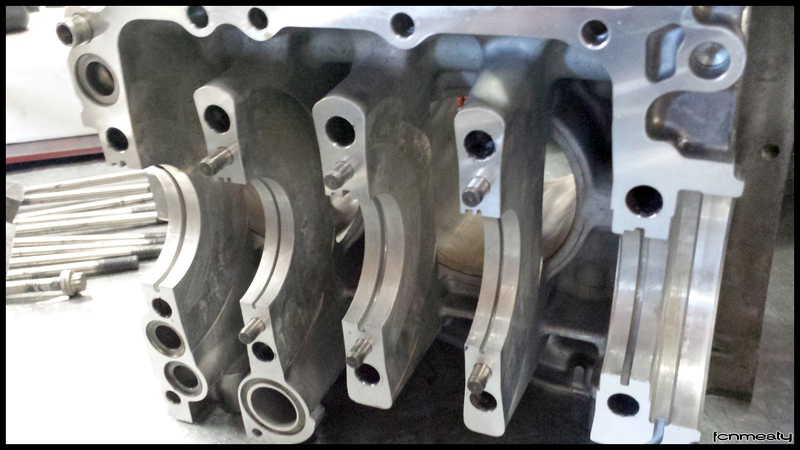 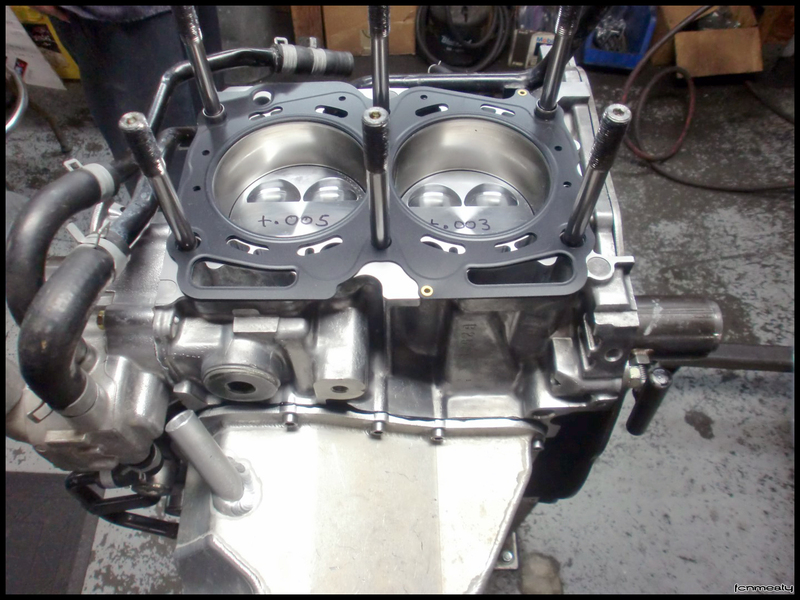 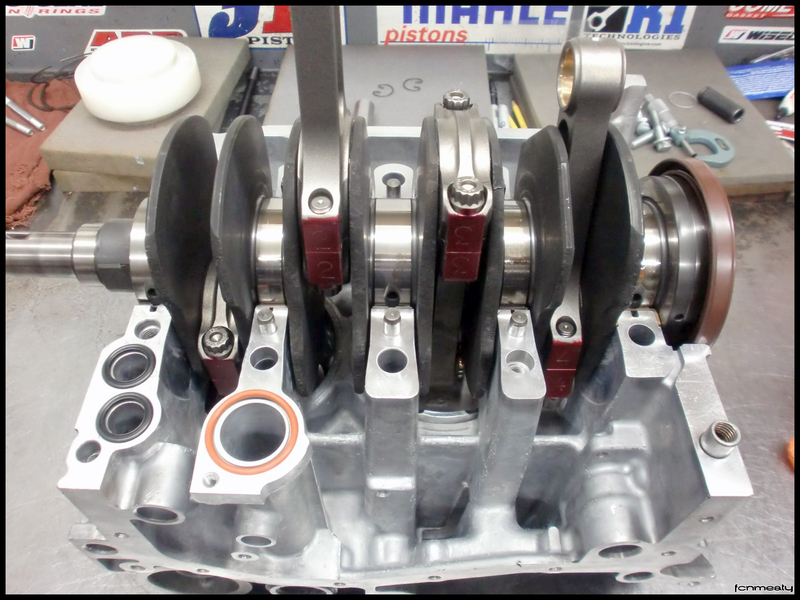 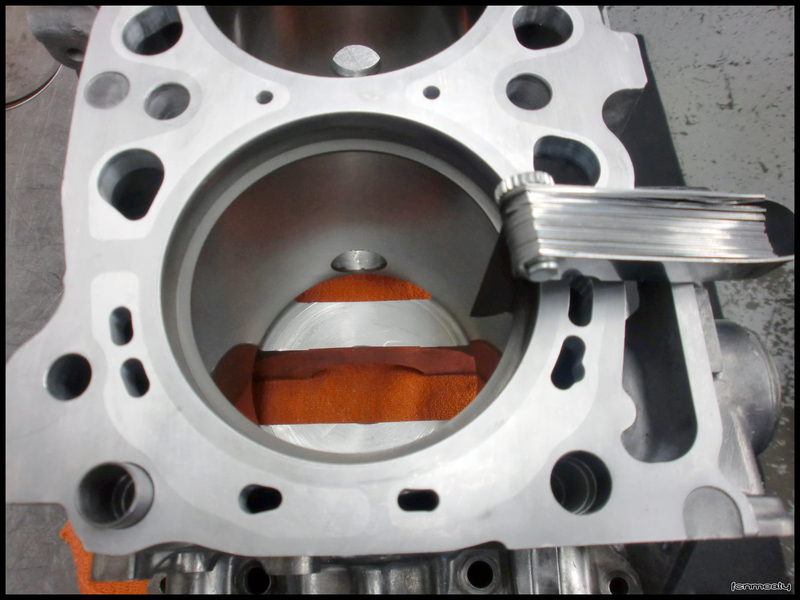 *Everything is just mach-fitted onto the engine to get charge piping fabricated this weekend, gaskets will go on before final assembly. 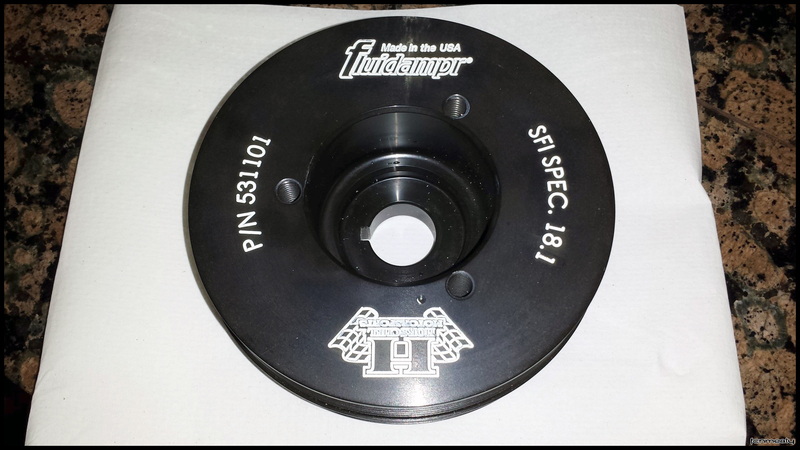 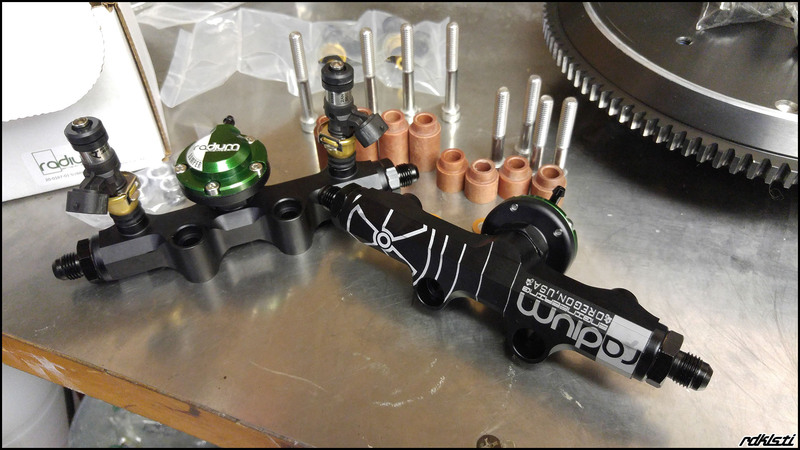 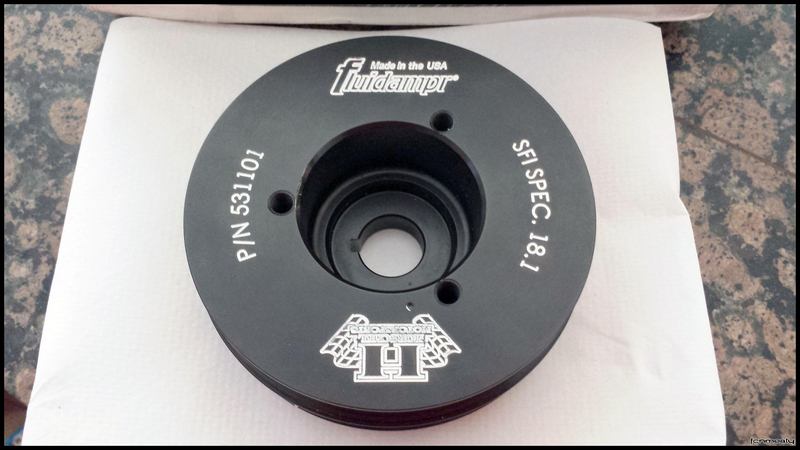 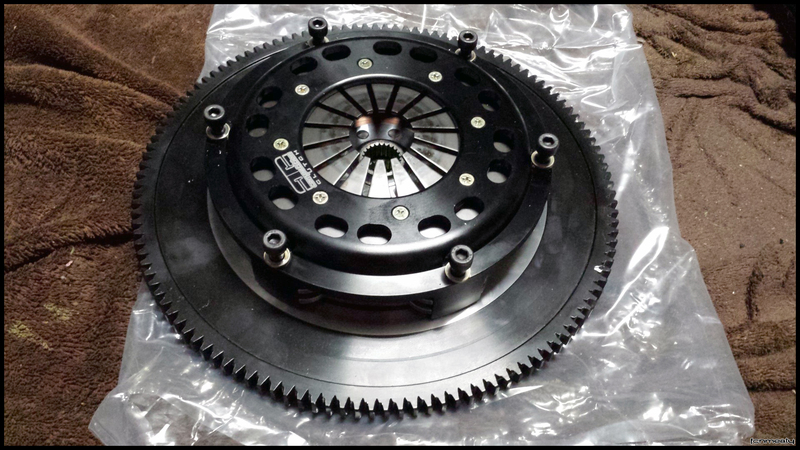 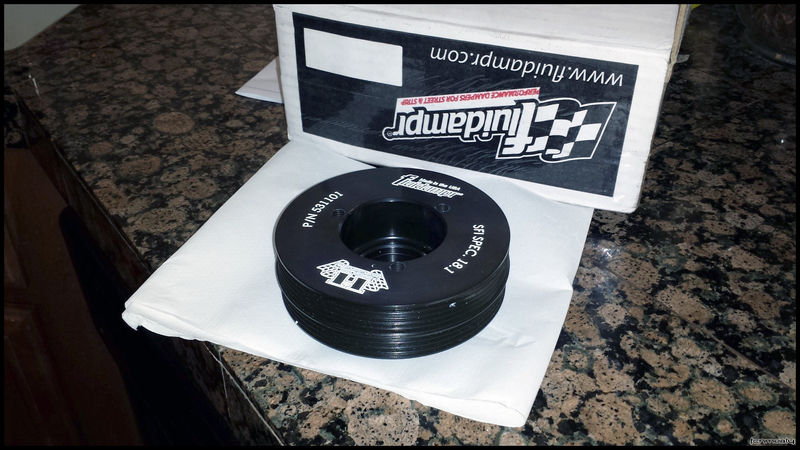 Received the Fluidampr crank pulley. 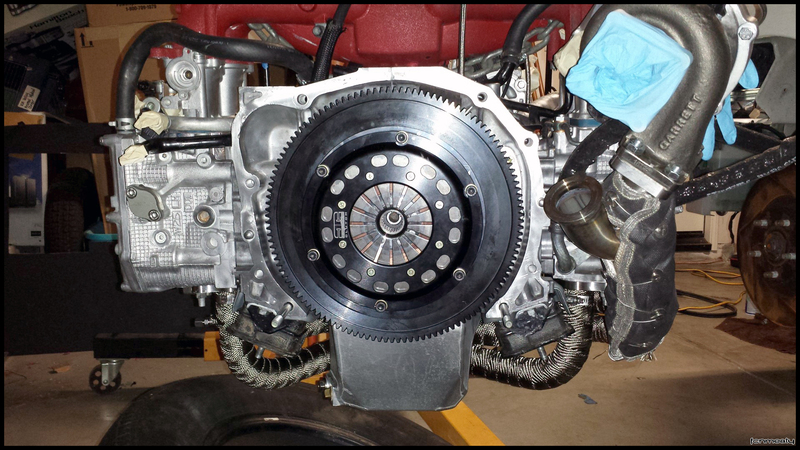 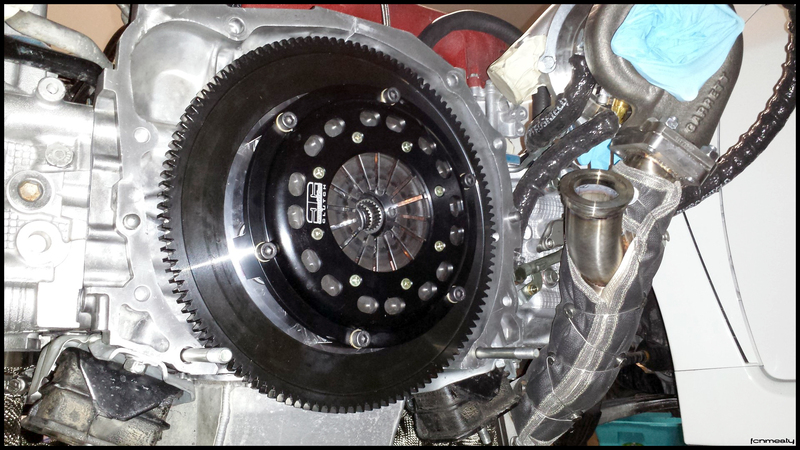 Installed that and the Competition Rigid Twin clutch, then put the engine in the chassis. 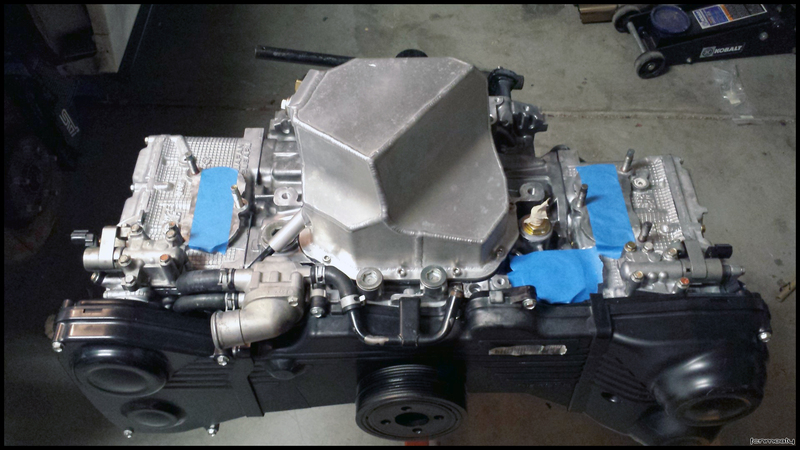 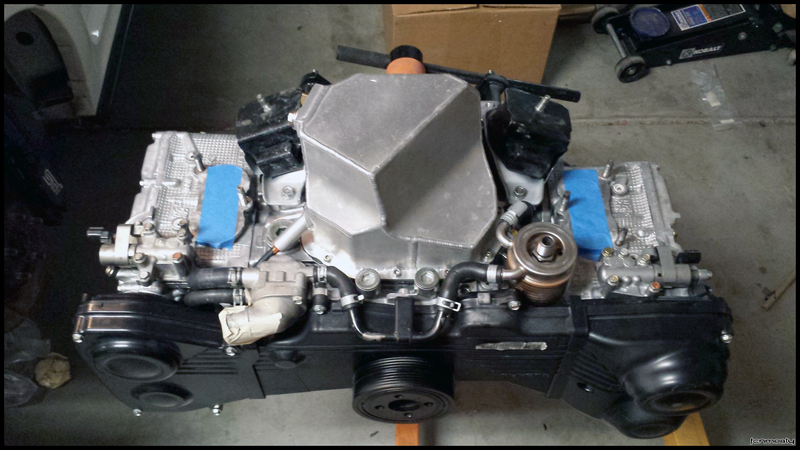 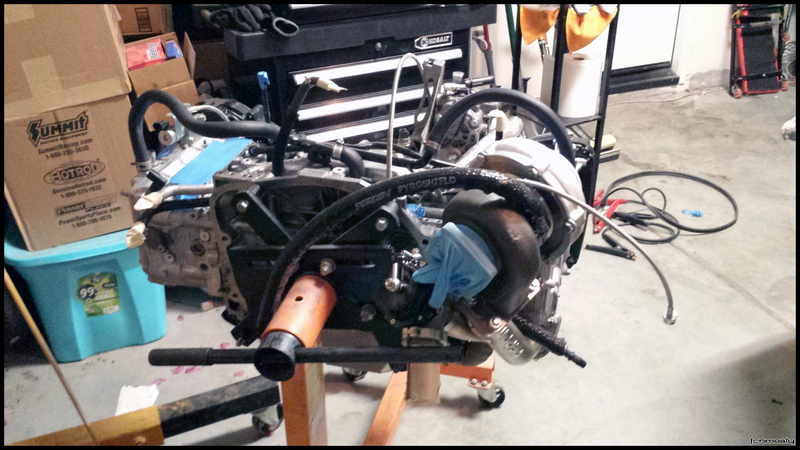 Made some progress bolting parts to the engine and prepping for the install. 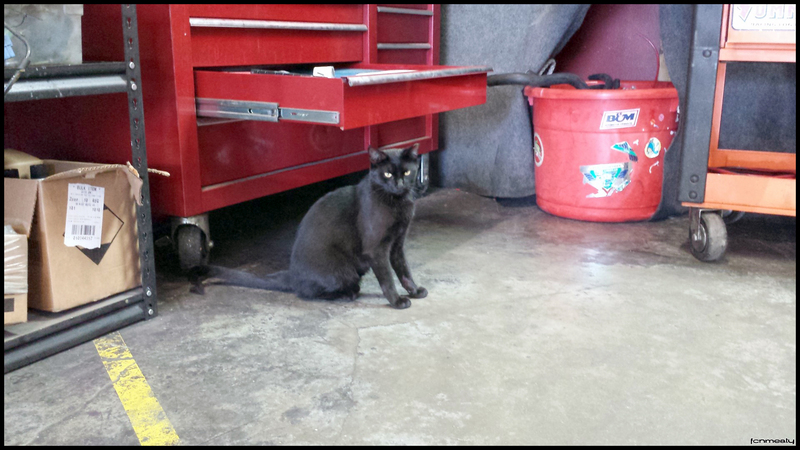 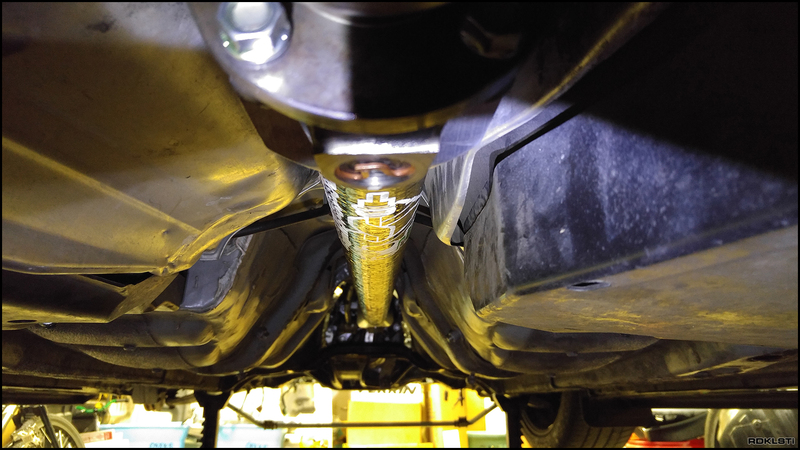 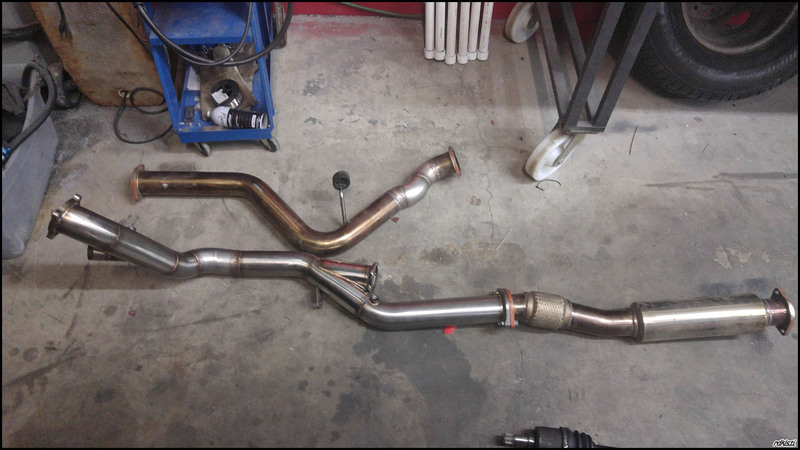 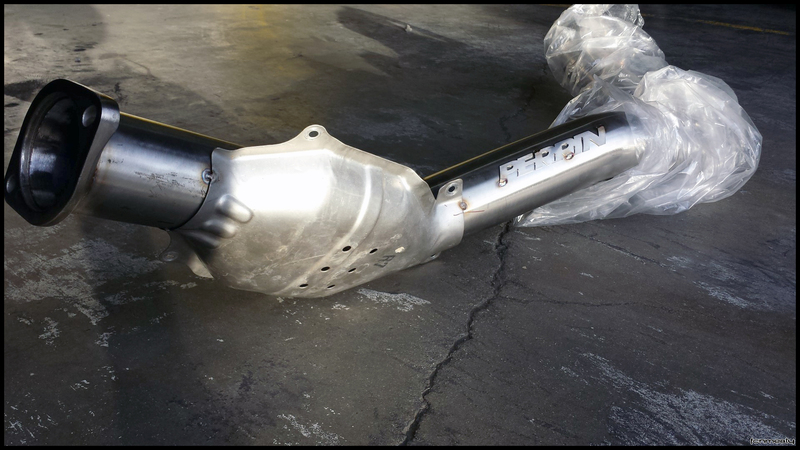 EGT bung welded onto cylinder #4 runner, put a “cat” on my Perrin rotated downpipe; bonus picture of shop cat at K-Powered. 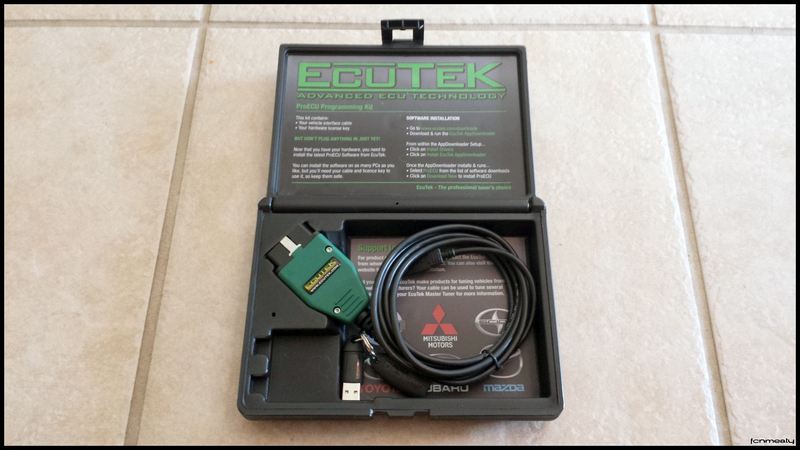 Re-organized my gauges over the weekend, knocked a few other things off the list; received my EcuTek ProECU kit from Delicious Tuning today. 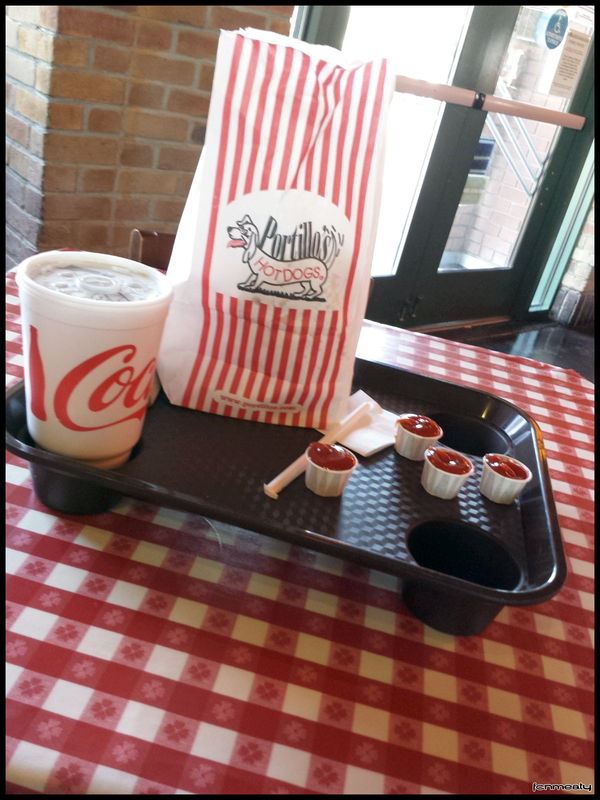 Picked the engine from Outfront Motorsports, stopped by my favorite food joint on the way home (mmm, PORTILLOS!). 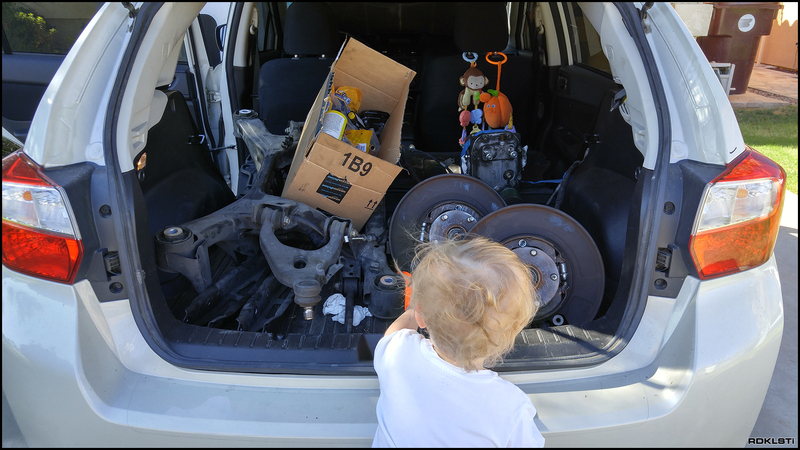 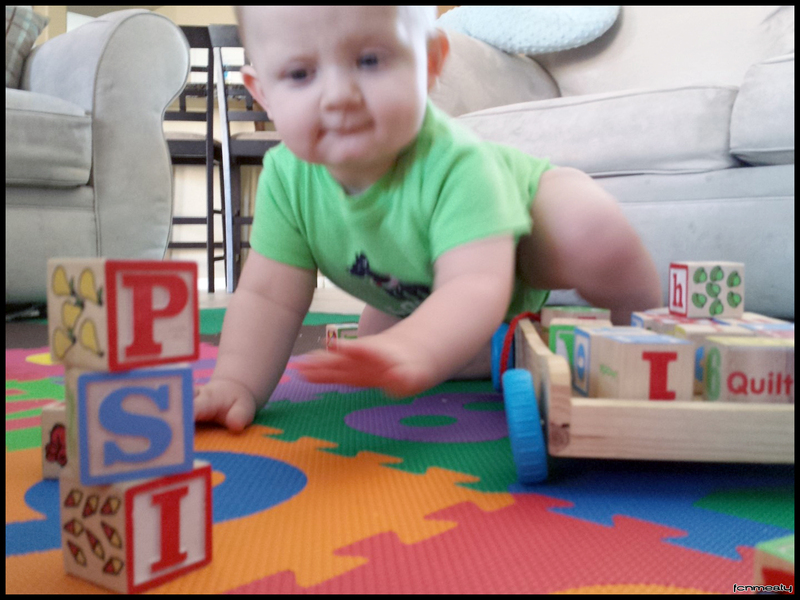 My son, Liam, is ready for boost; are you?! 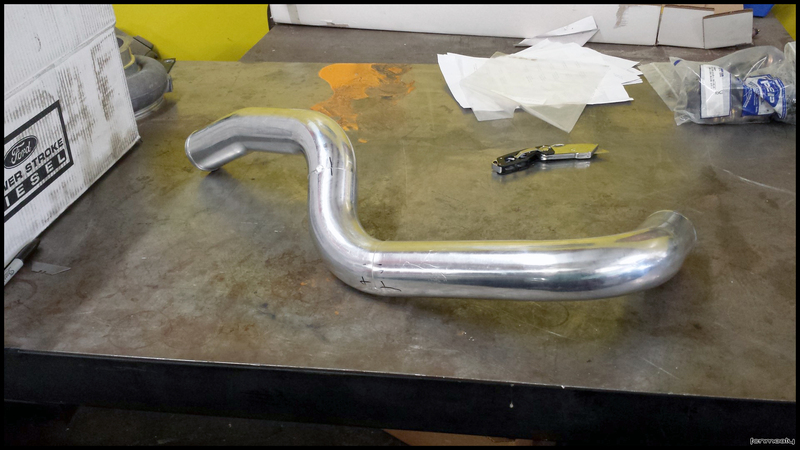 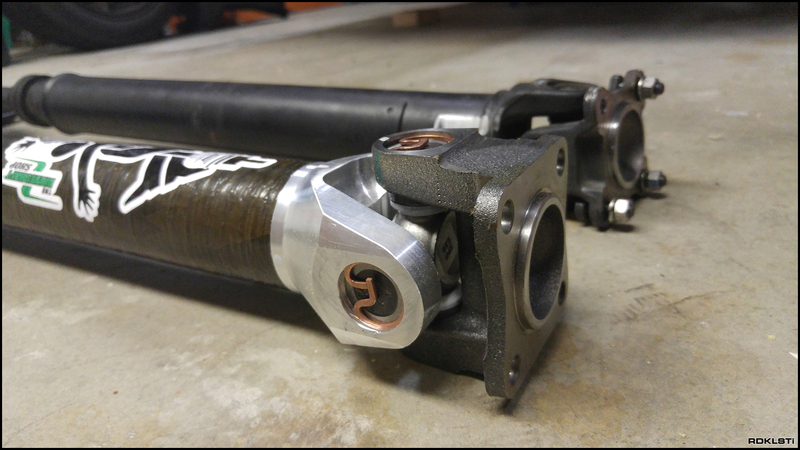 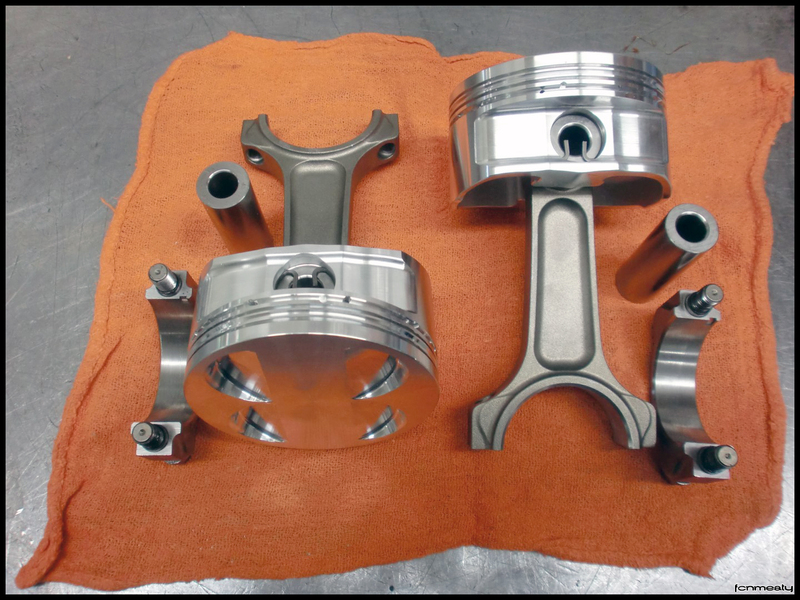 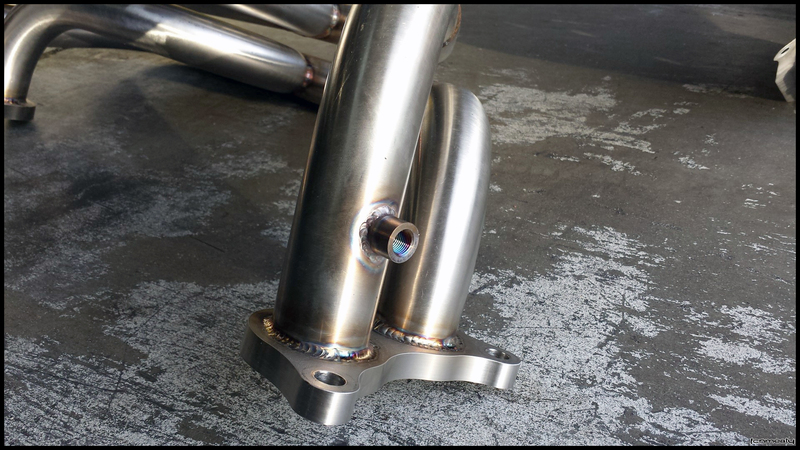 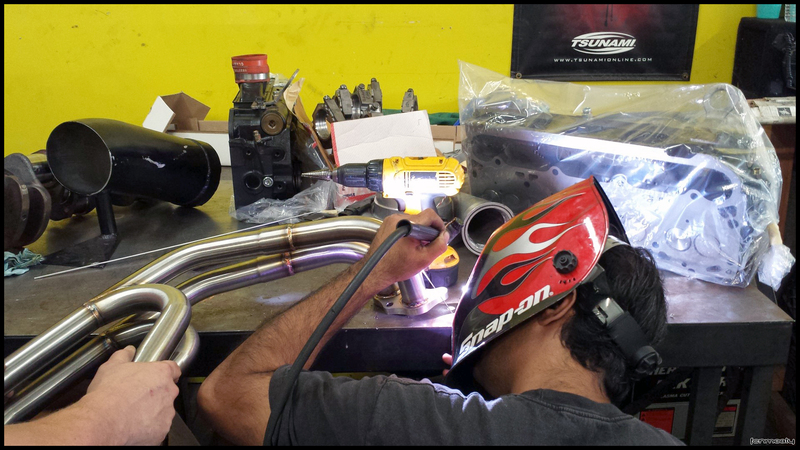 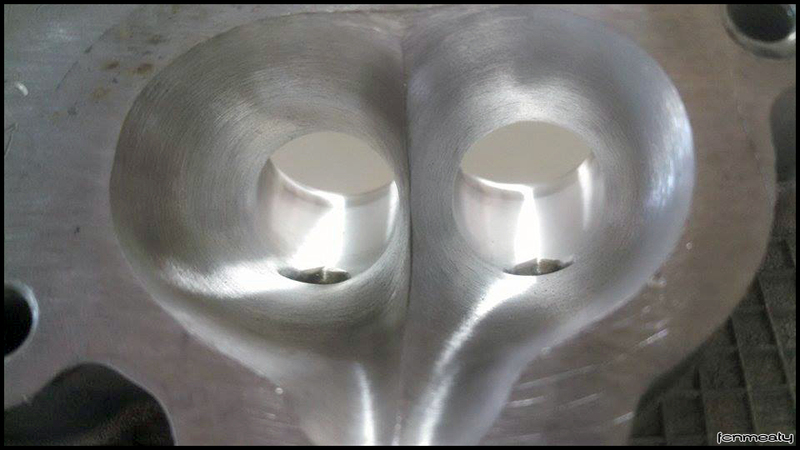 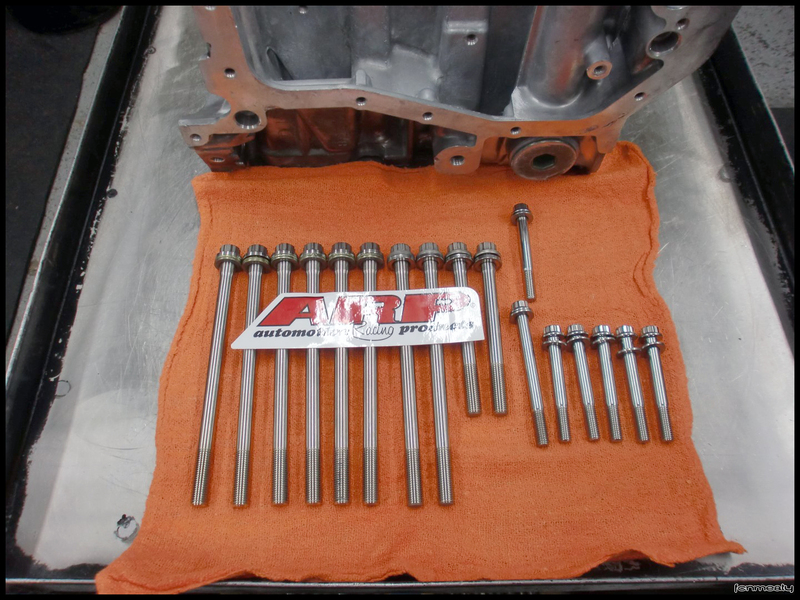 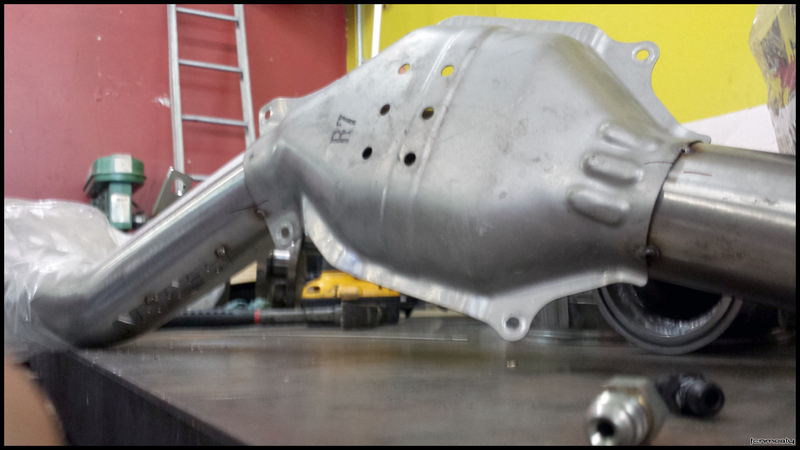 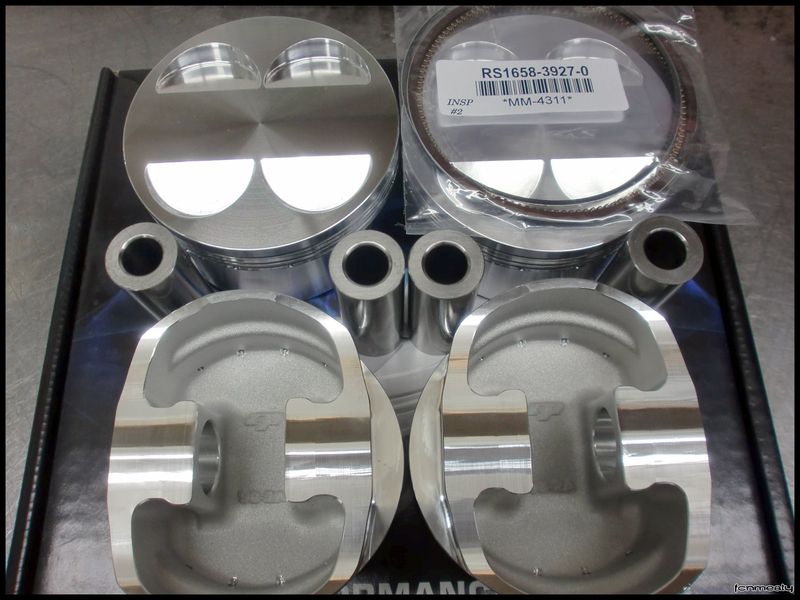 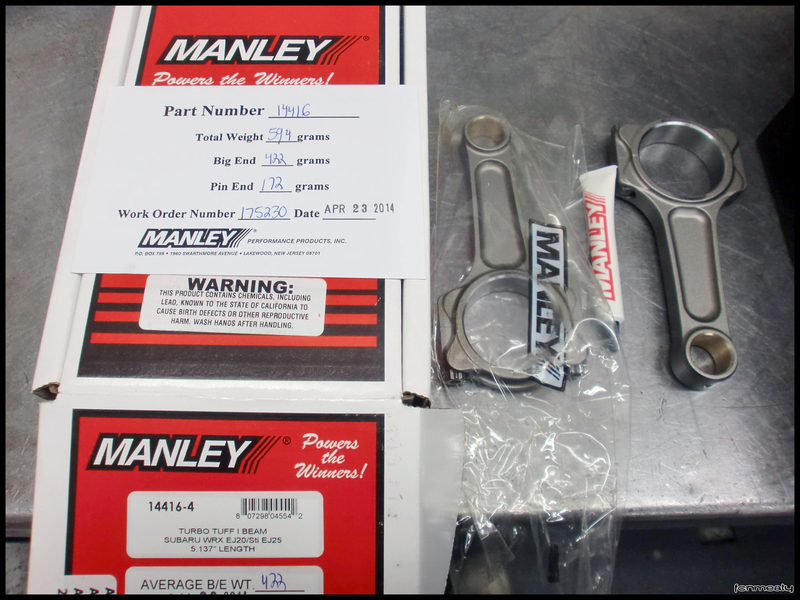 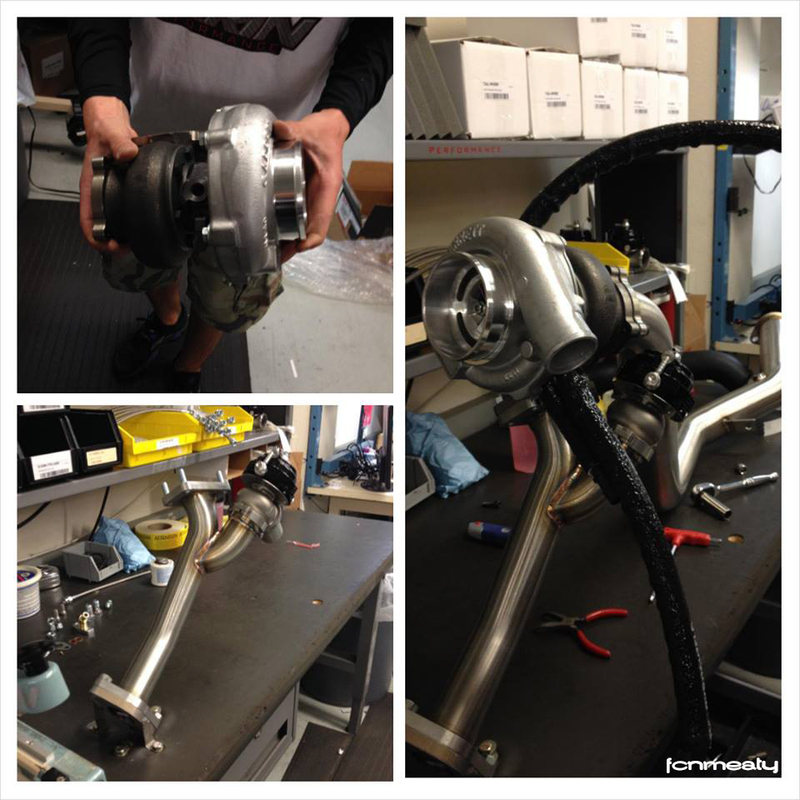 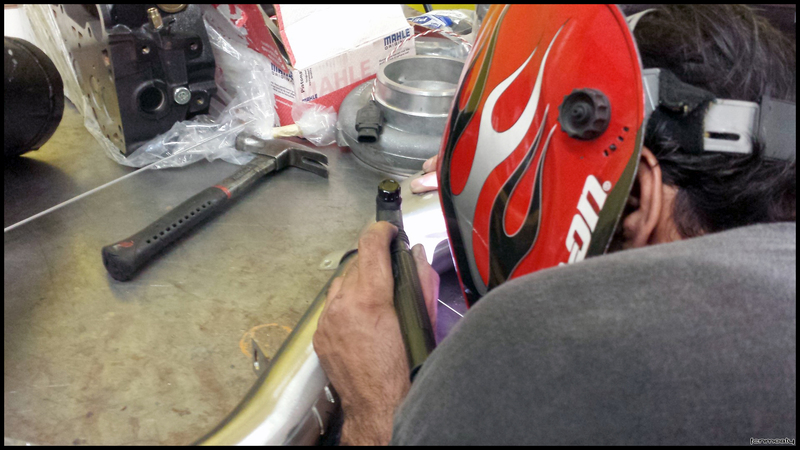 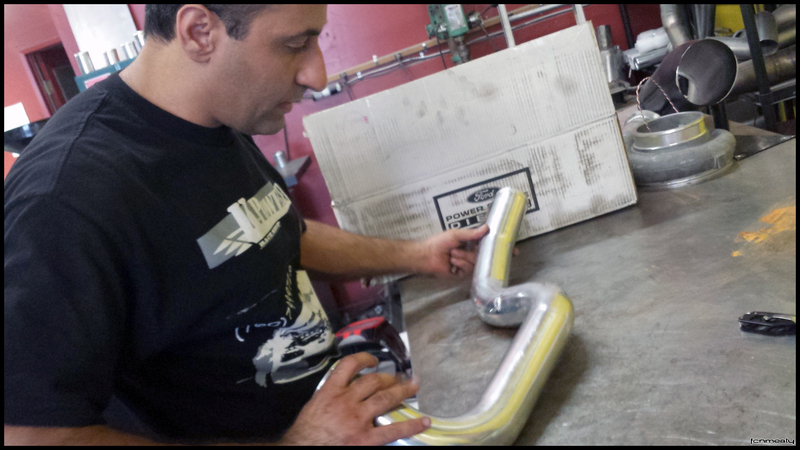 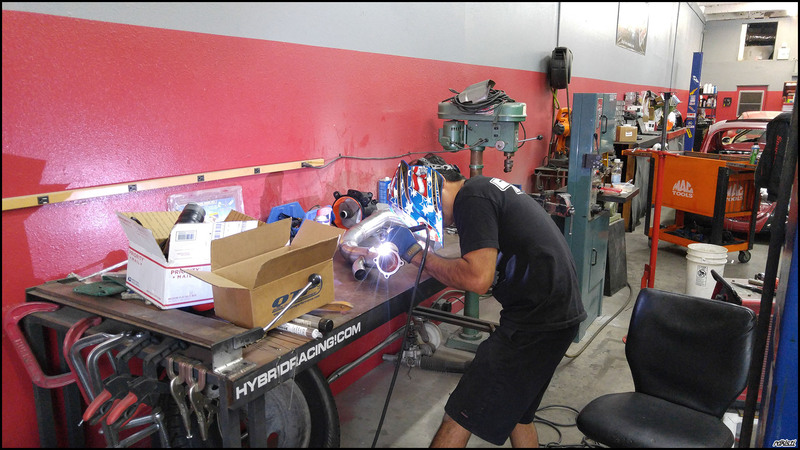 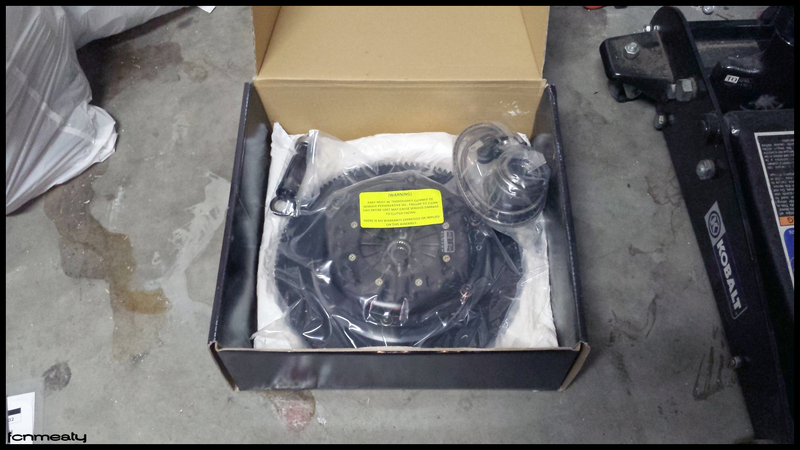 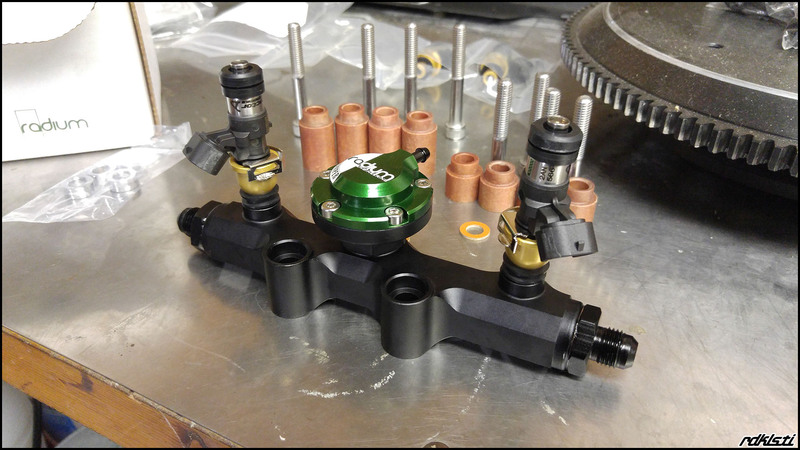 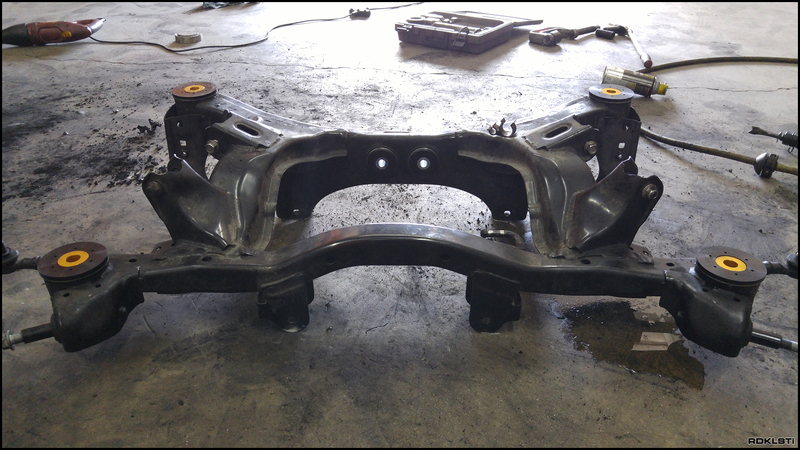 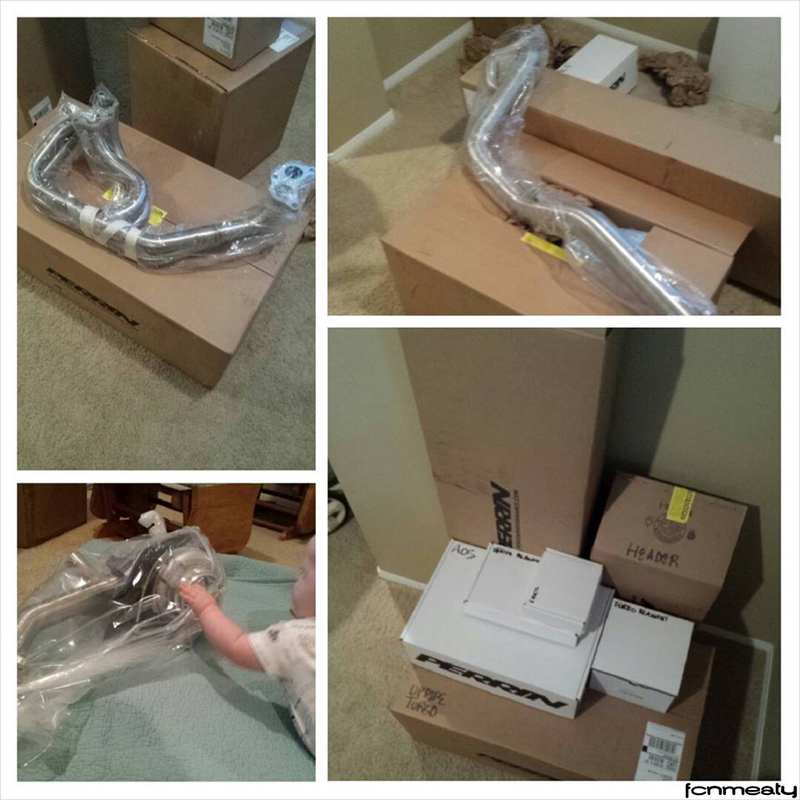 Received some assembly pictures from Outfront Motorsports. 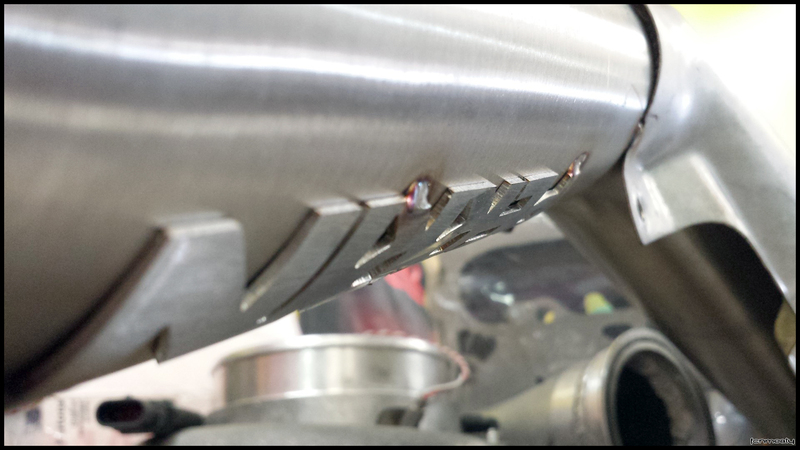 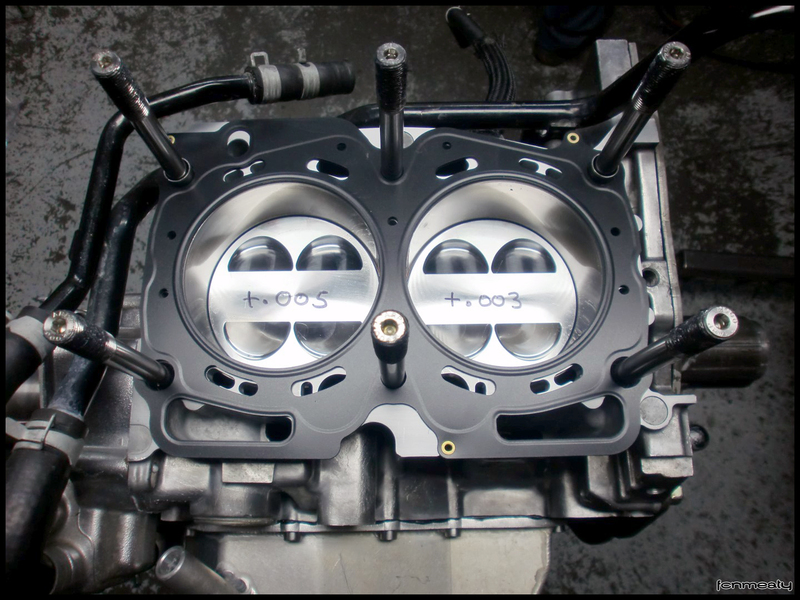 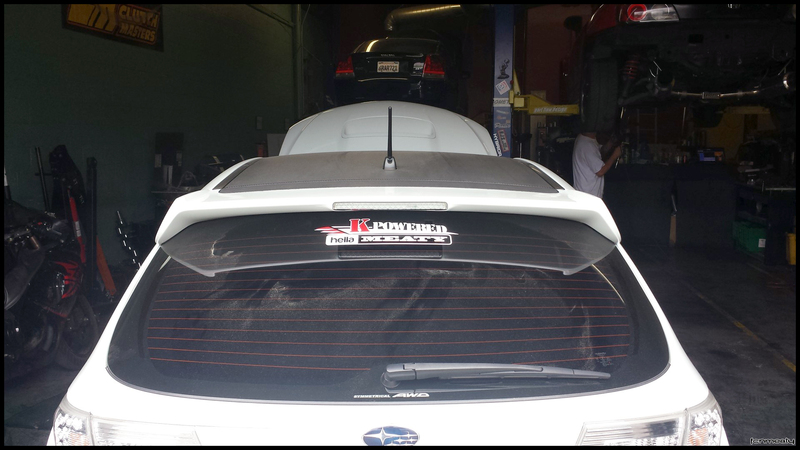 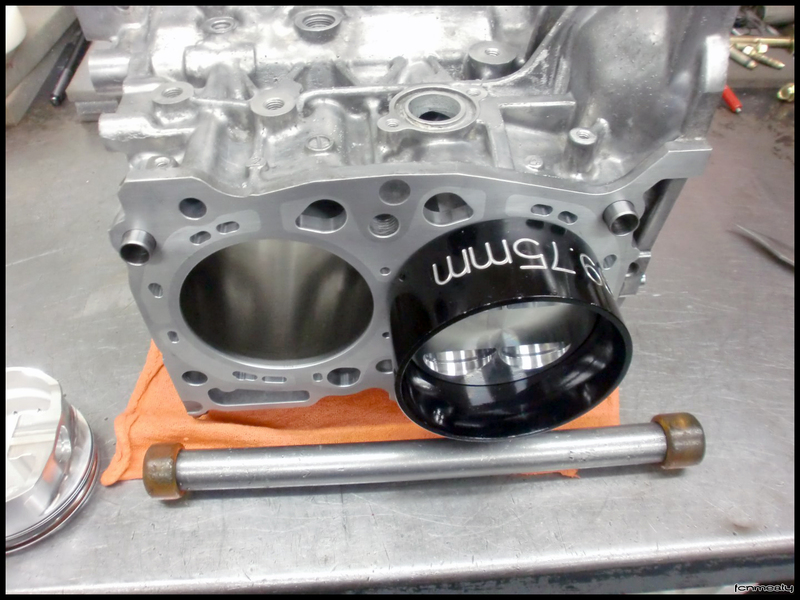 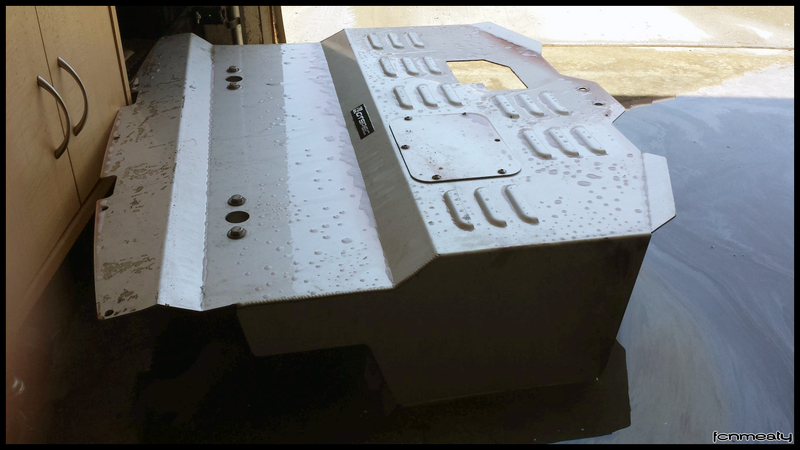 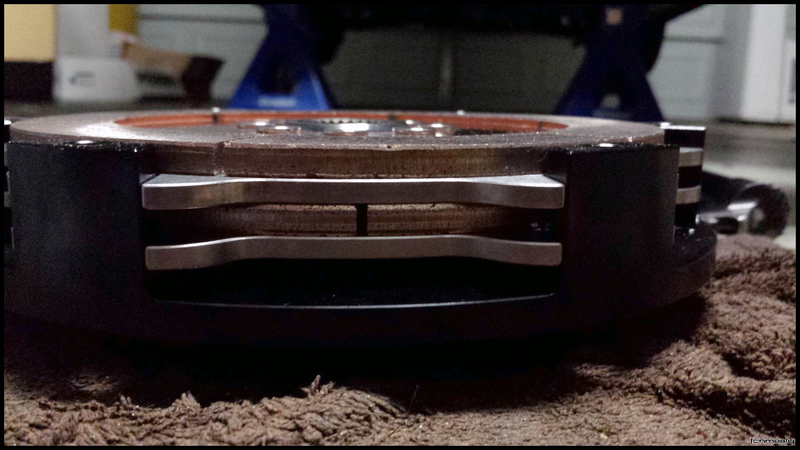 Stopped by Outfront Motorsports to check out the newly pinned closed deck case halves. 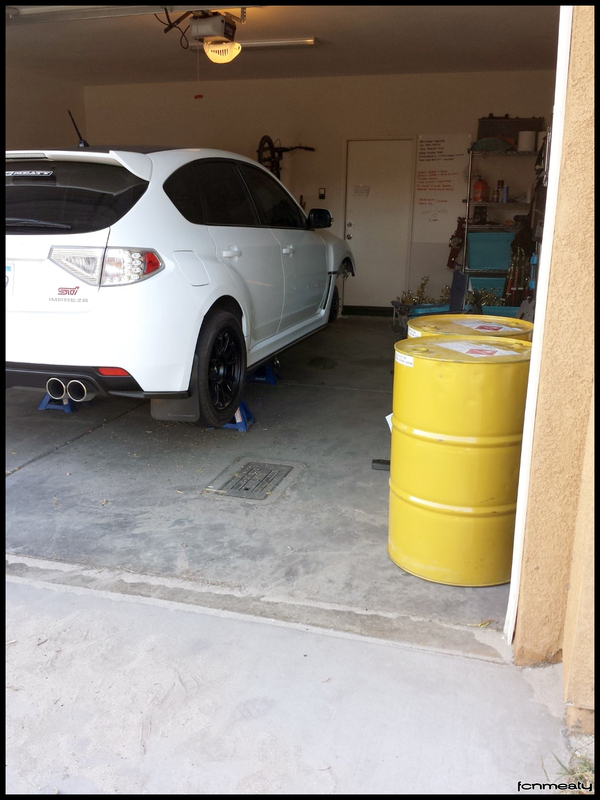 Snagged up a couple 55 gallon drums from a buddy to stock up on E85. 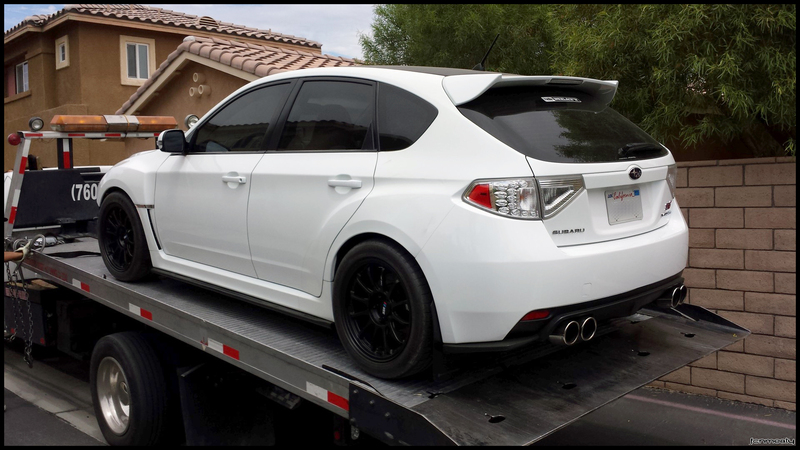 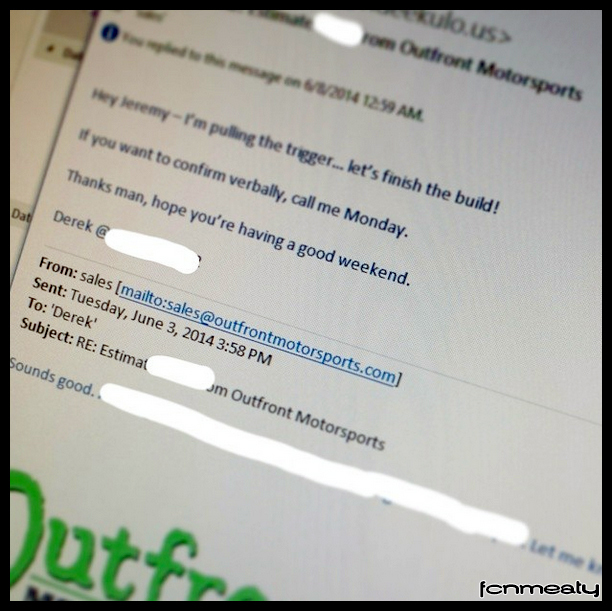 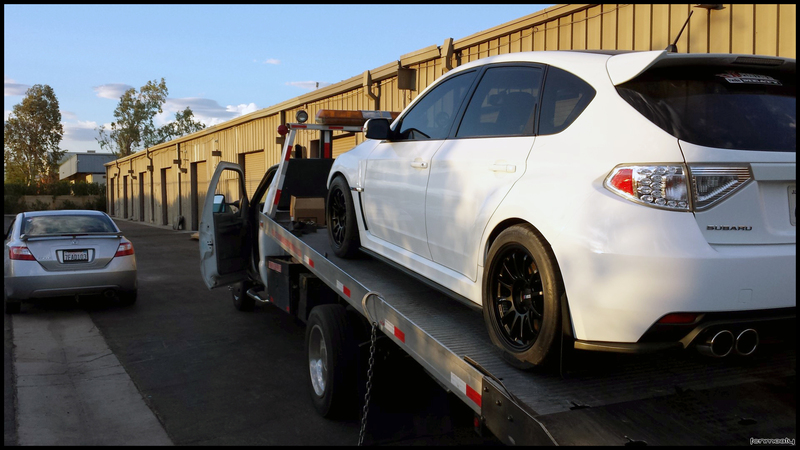 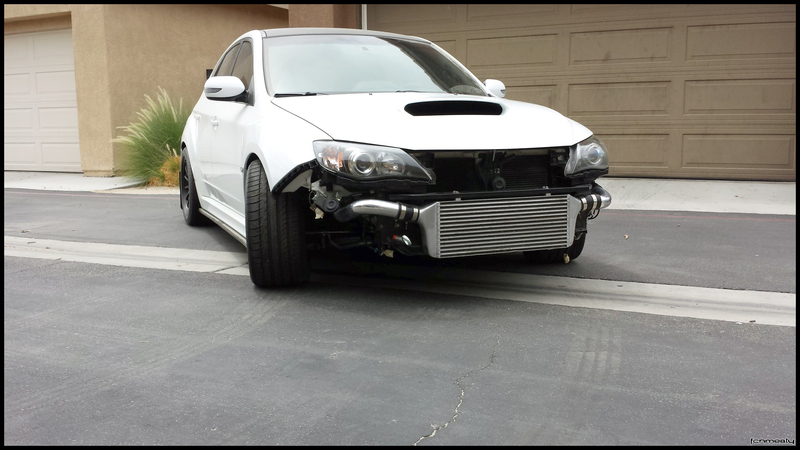 Sent an email to Outfront Motorsports to proceed with finishing the build. 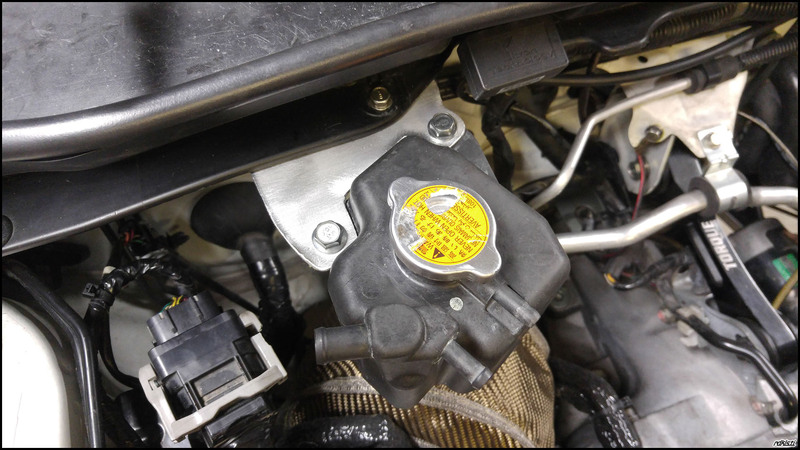 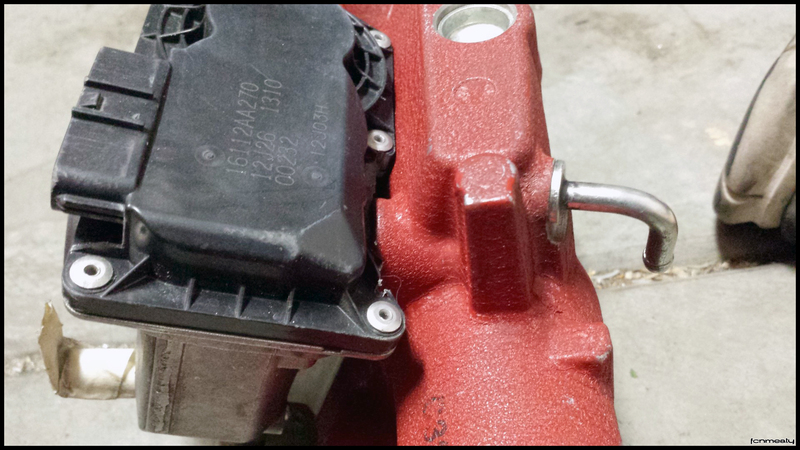 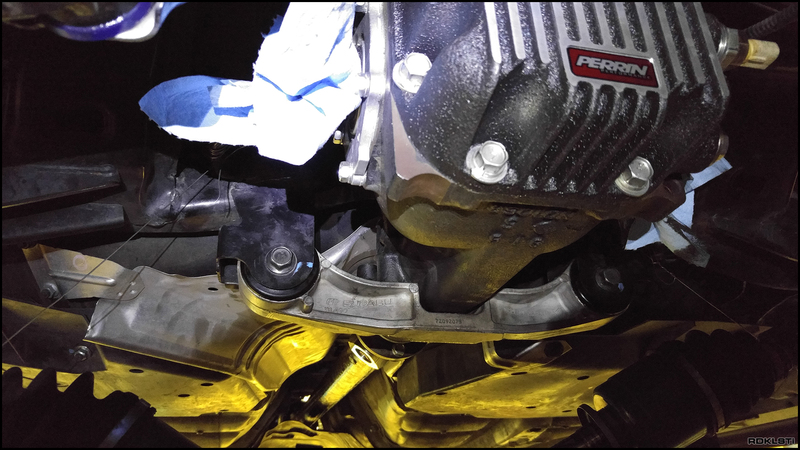 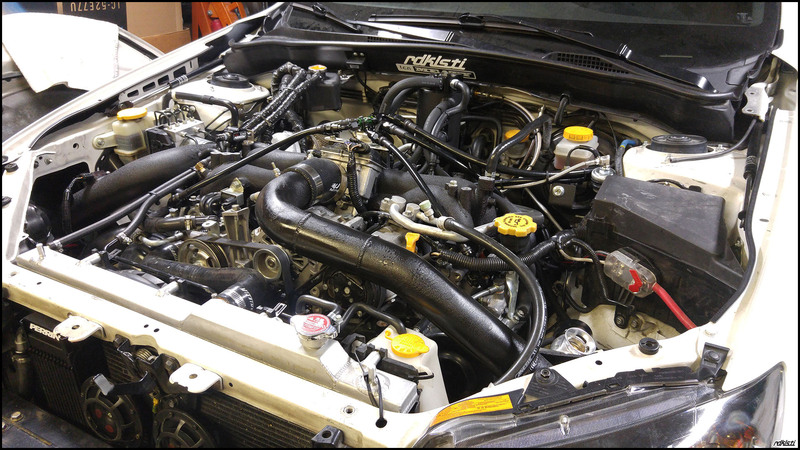 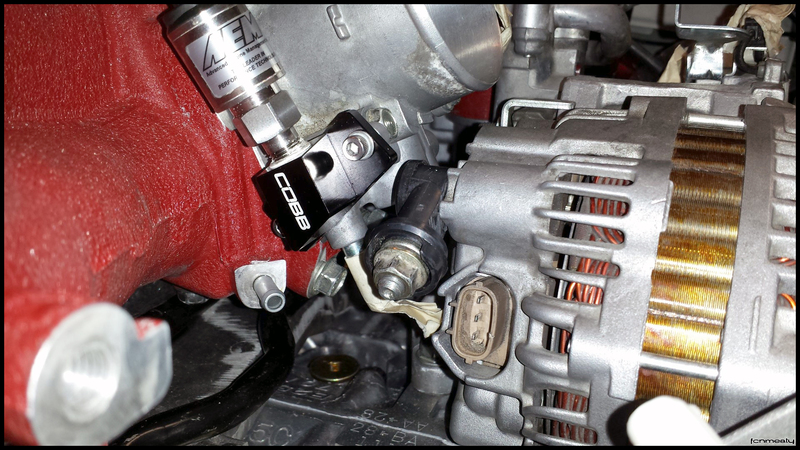 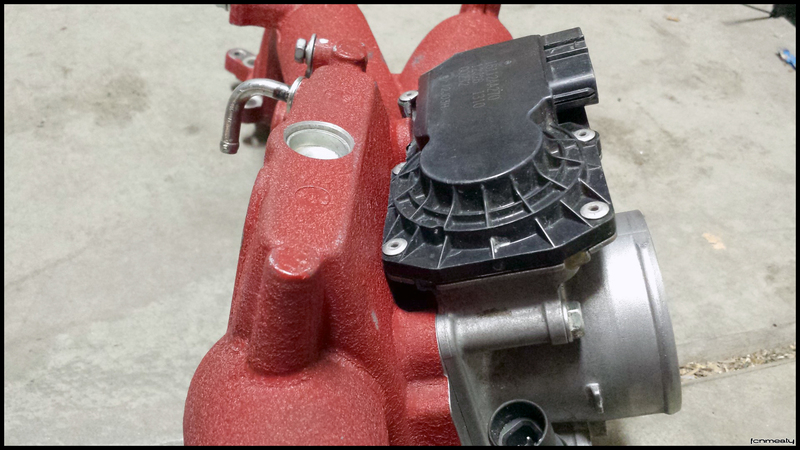 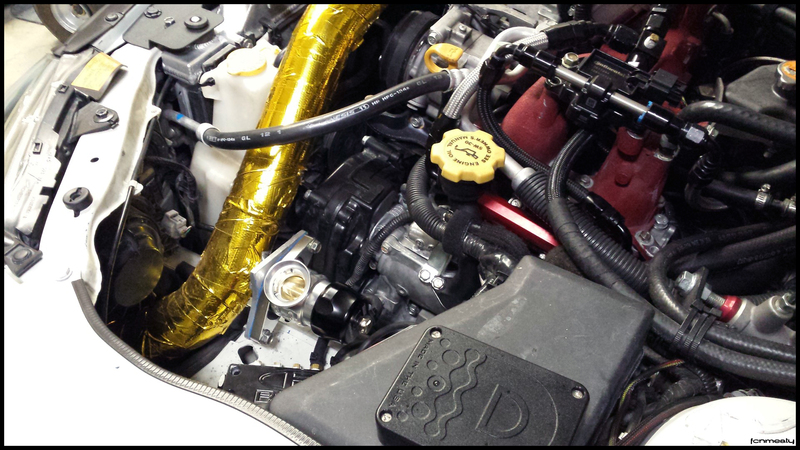 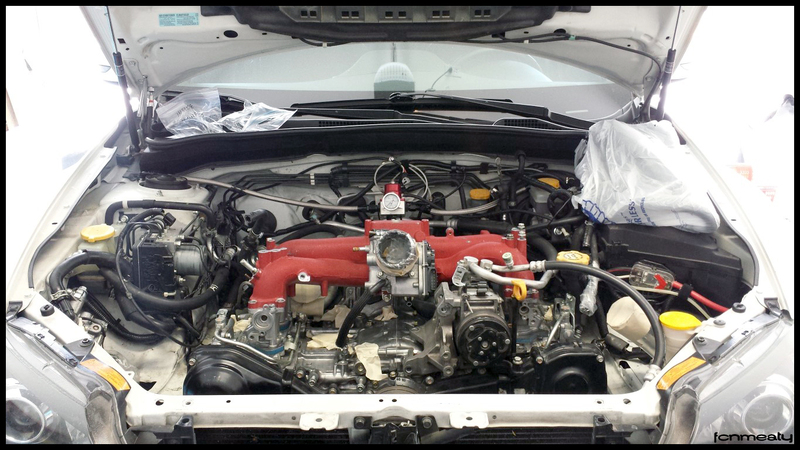 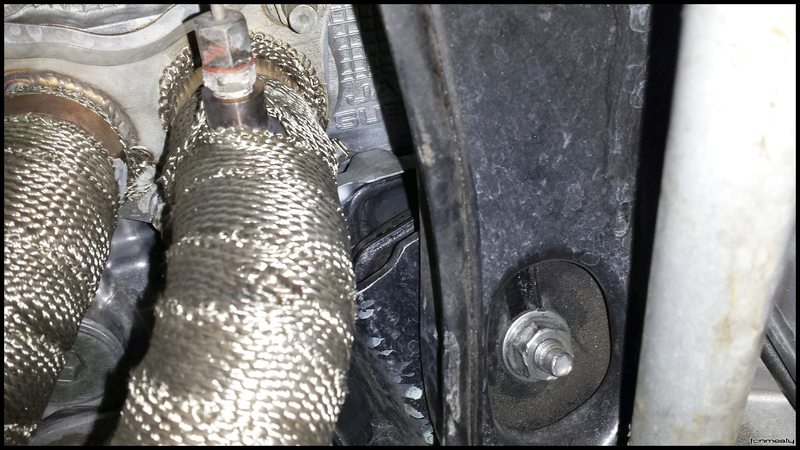 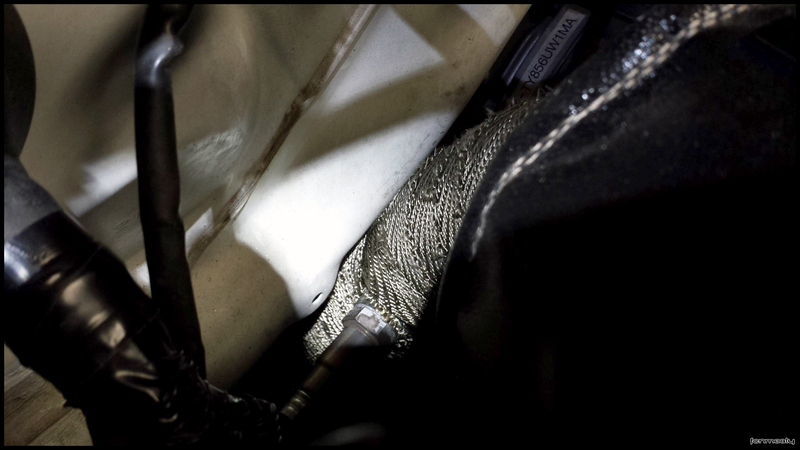 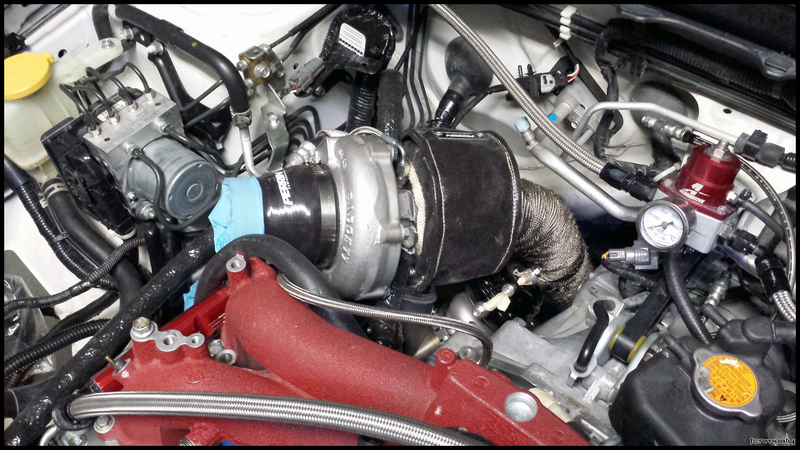 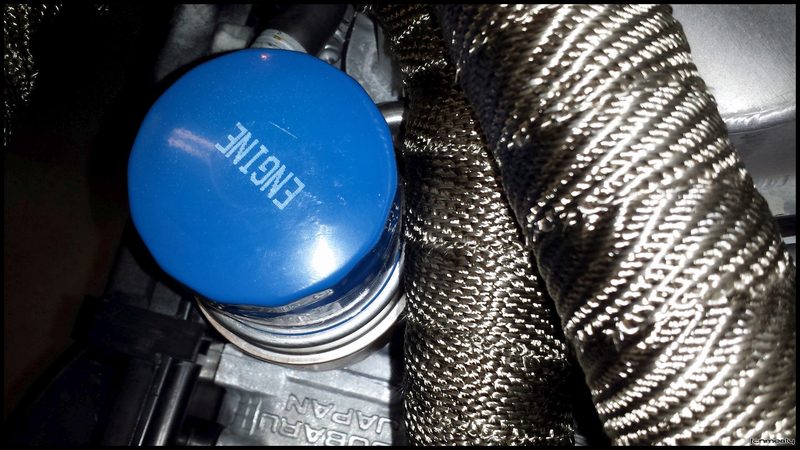 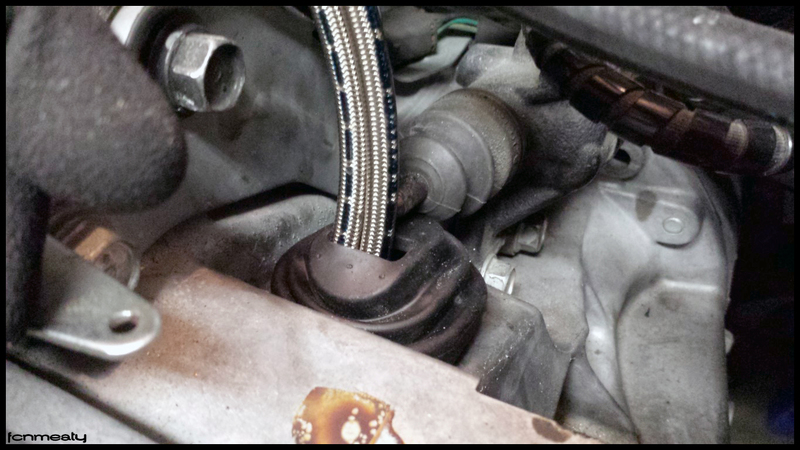 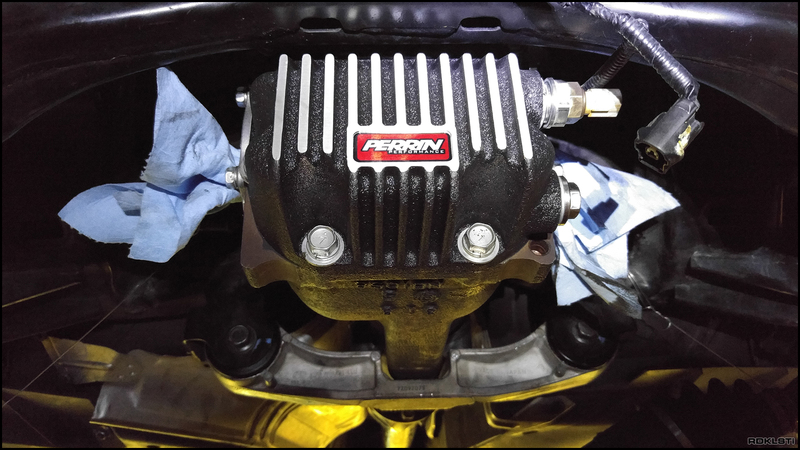 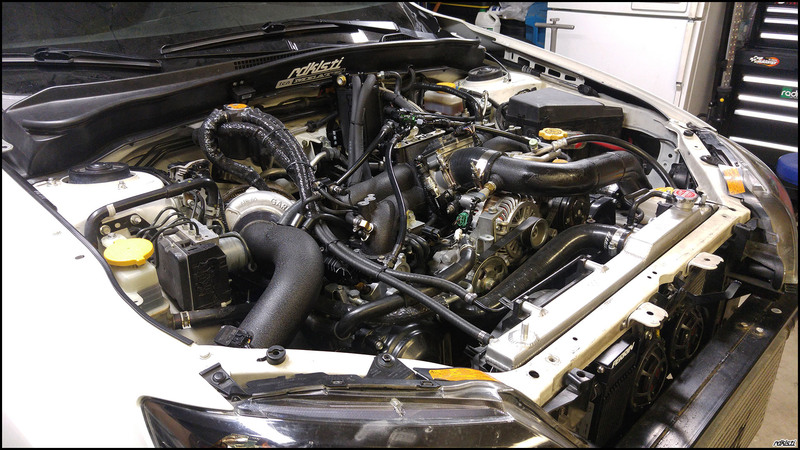 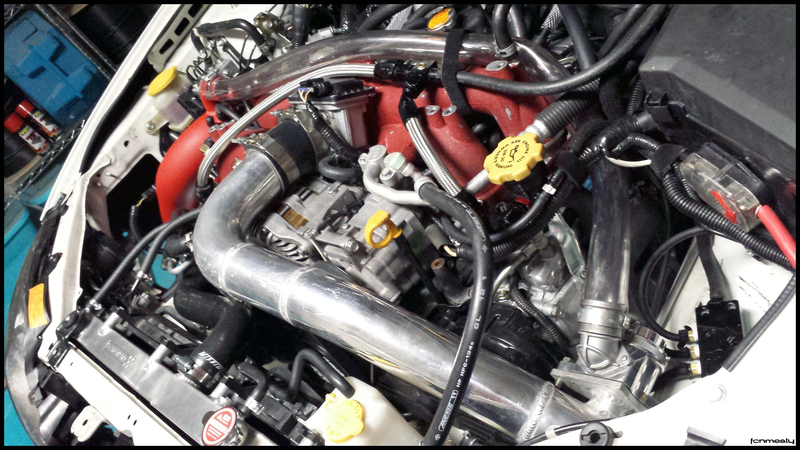 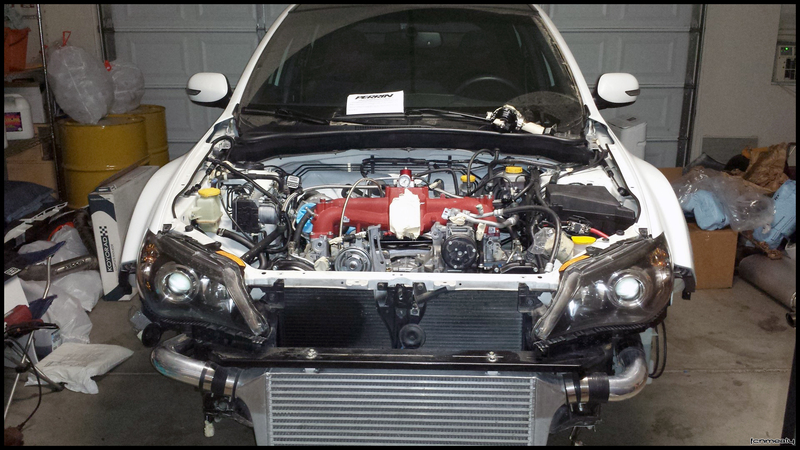 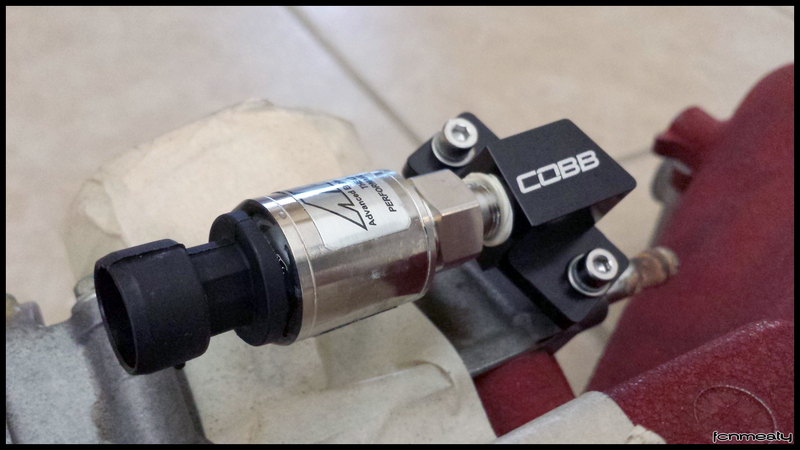 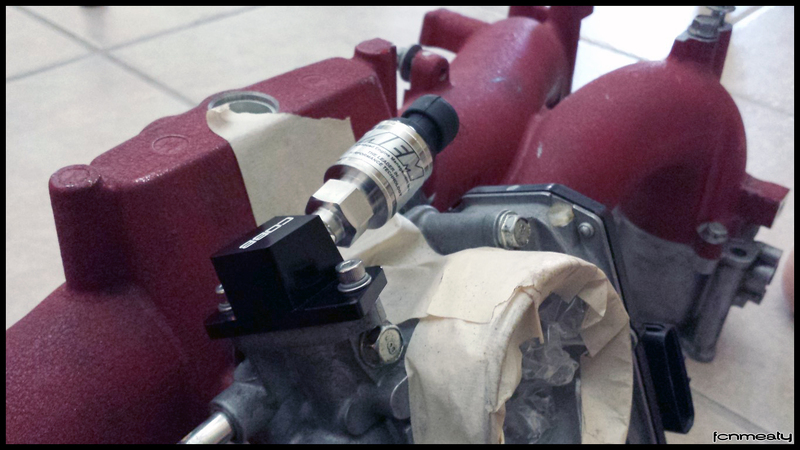 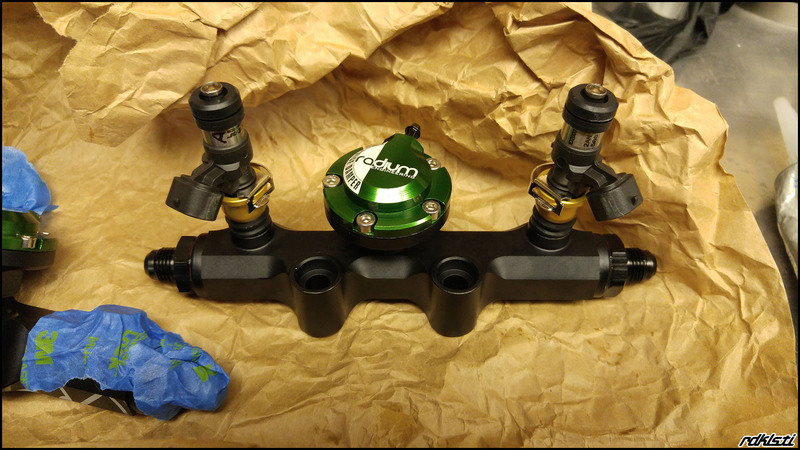 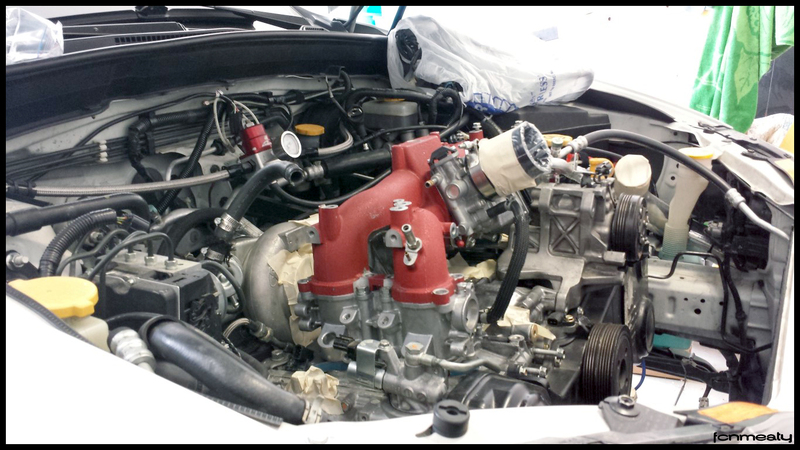 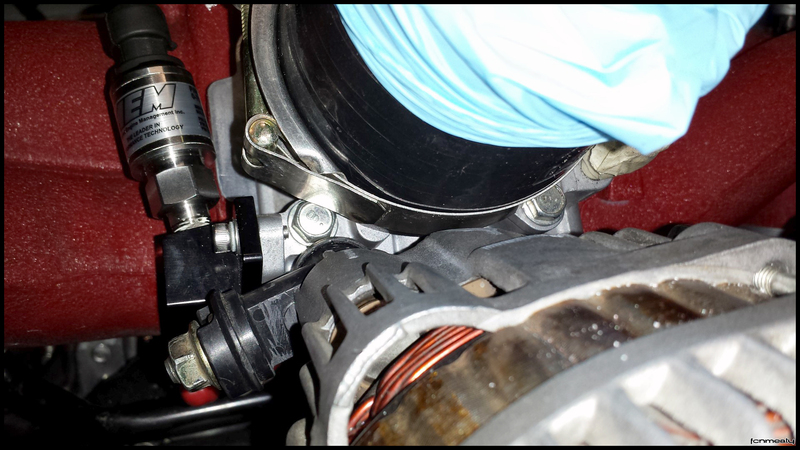 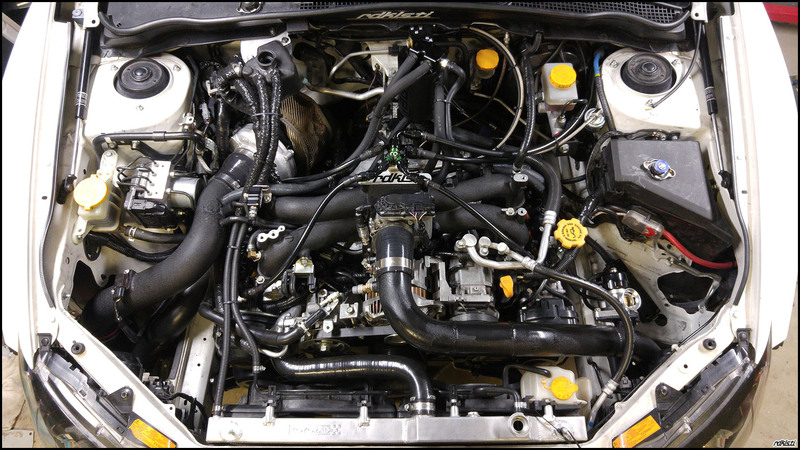 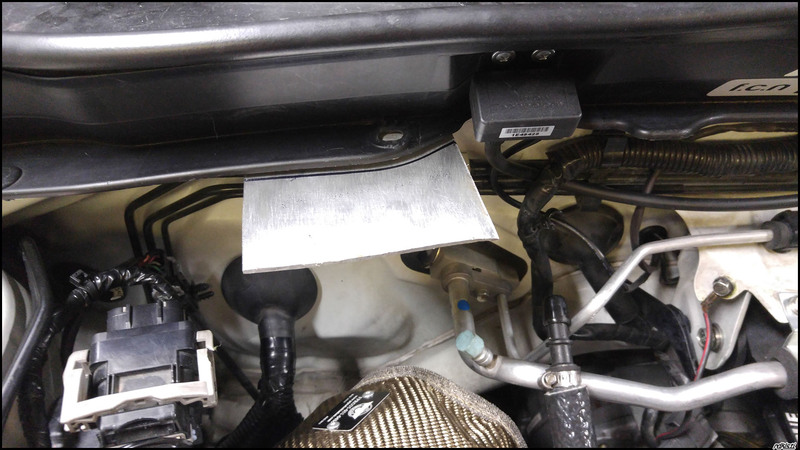 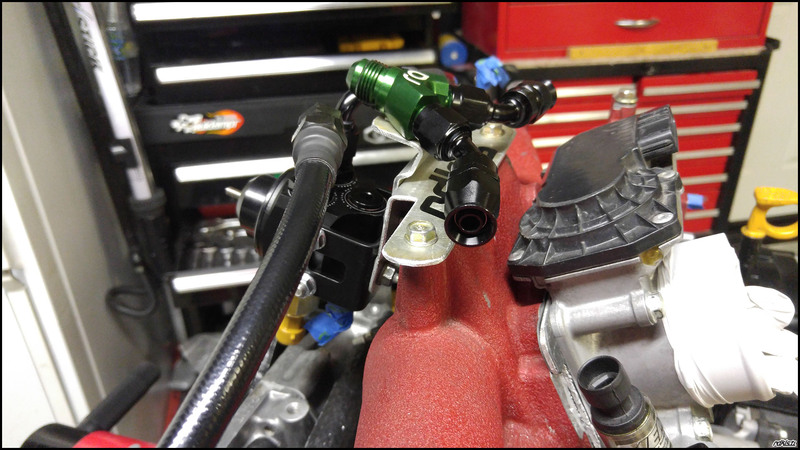 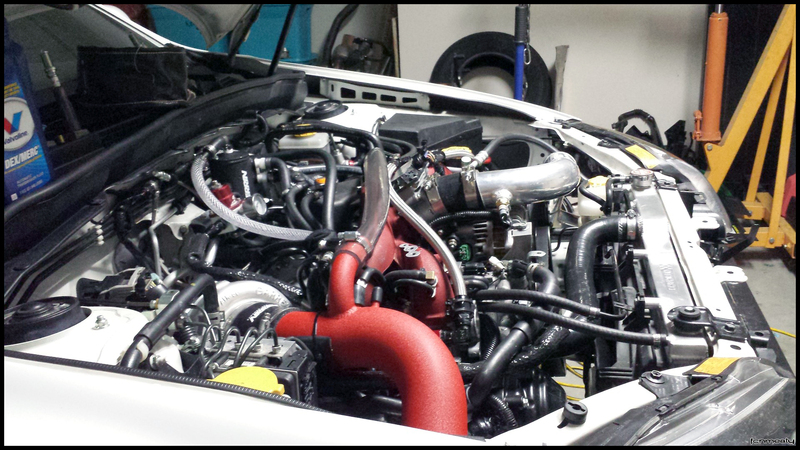 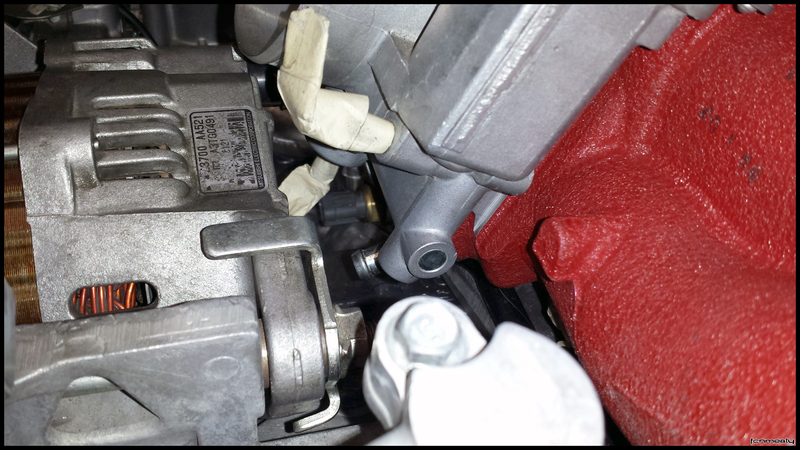 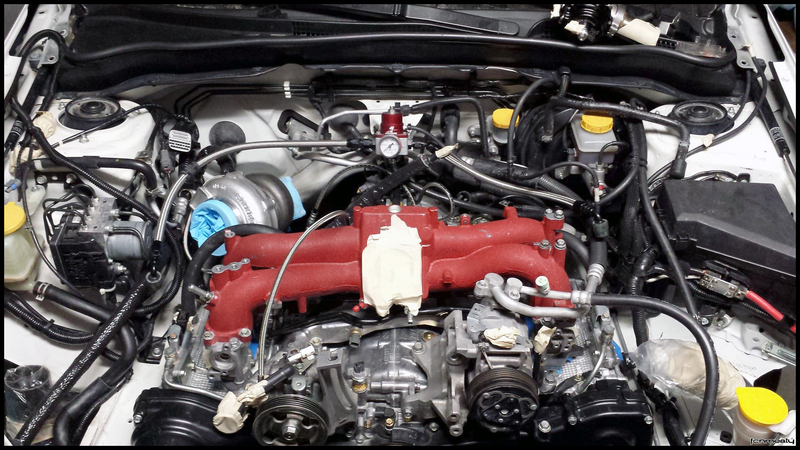 Prepped intake manifold with new AEM 5-bar MAP sensor and COBB MAP sensor adapter. 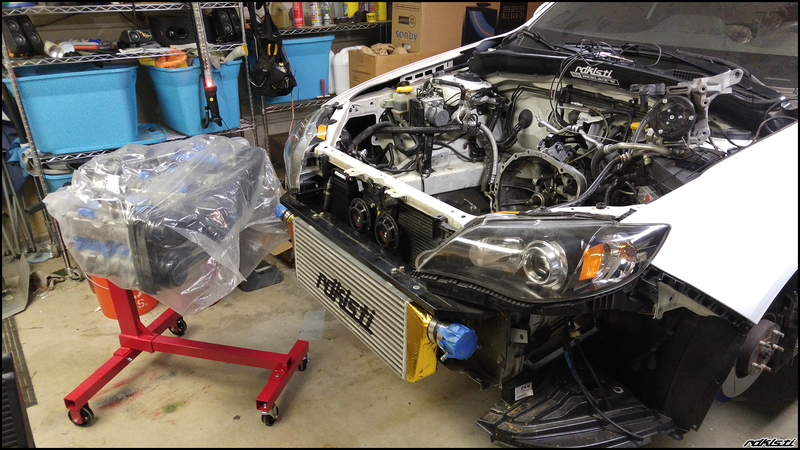 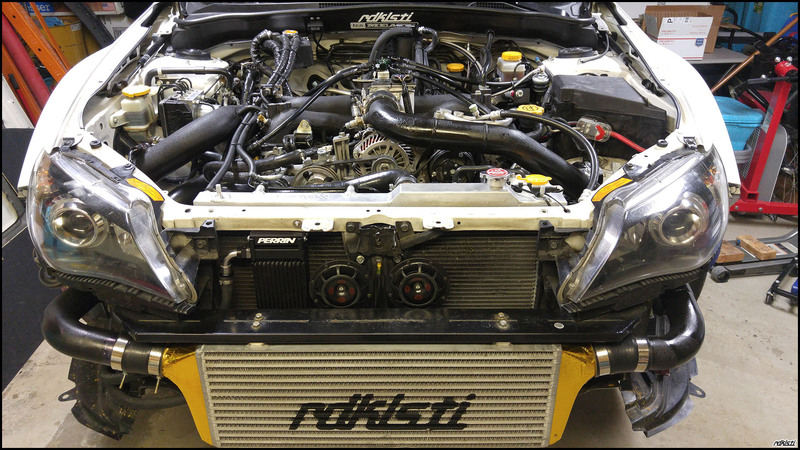 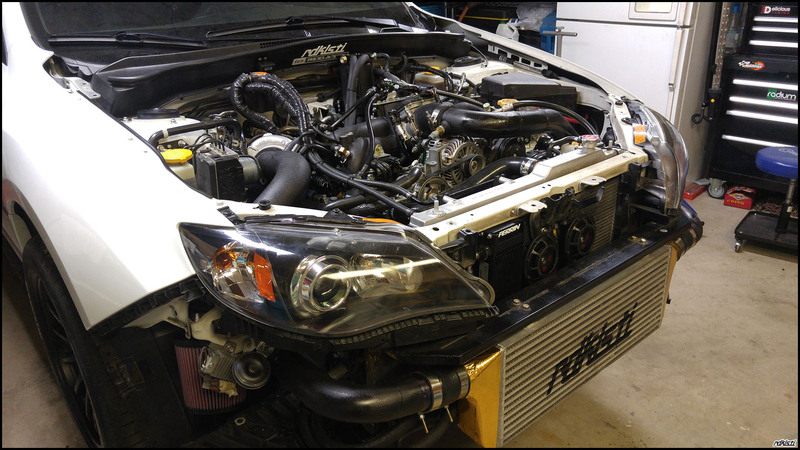 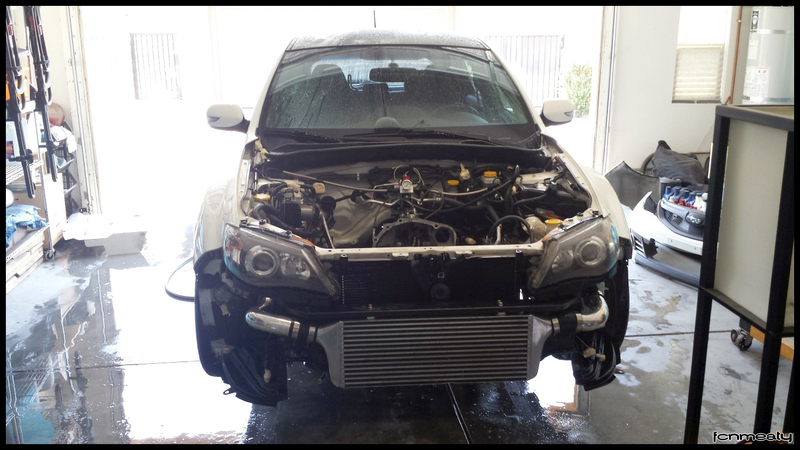 In preparation for the upcoming install, I did some garage organization and washed the STi, including degreasing the engine bay and the GTSpec undertray. 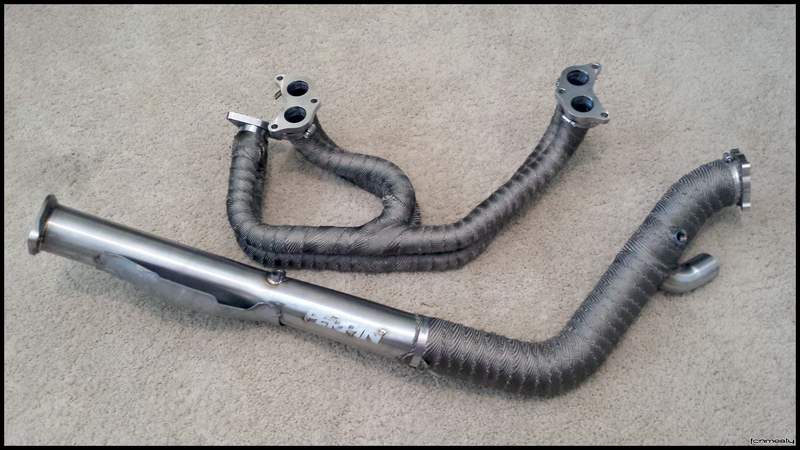 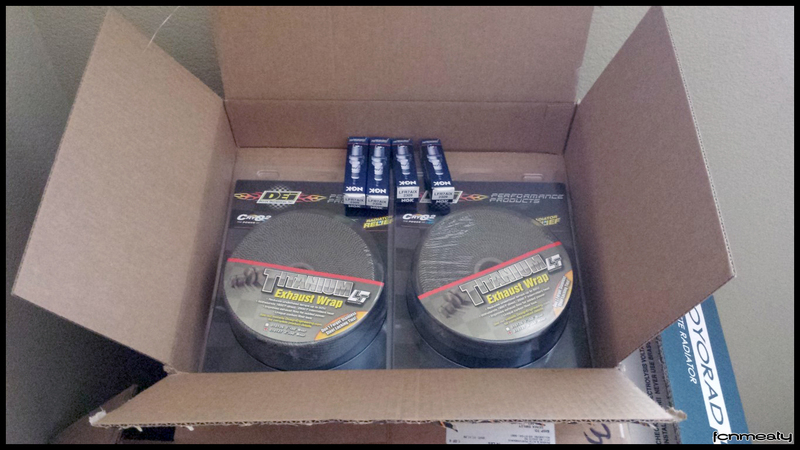 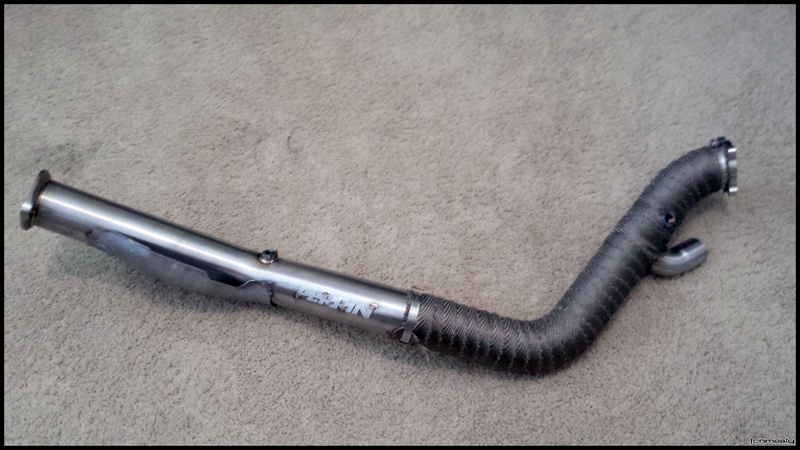 I also received my DEI titanium wrap and NGK one-step colder plugs today. 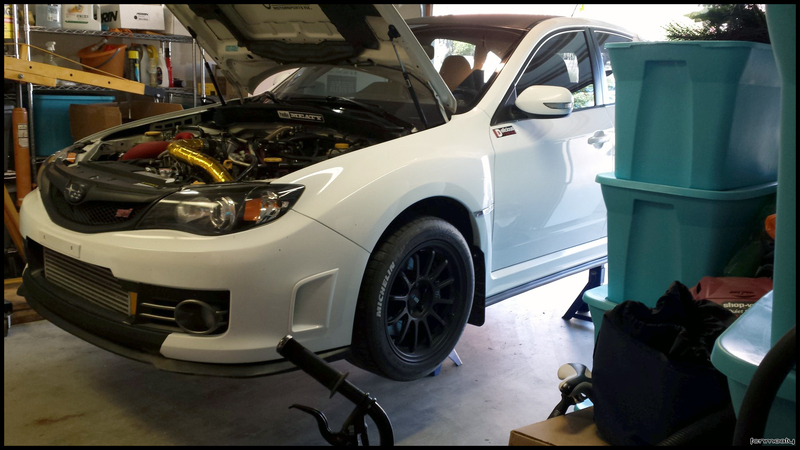 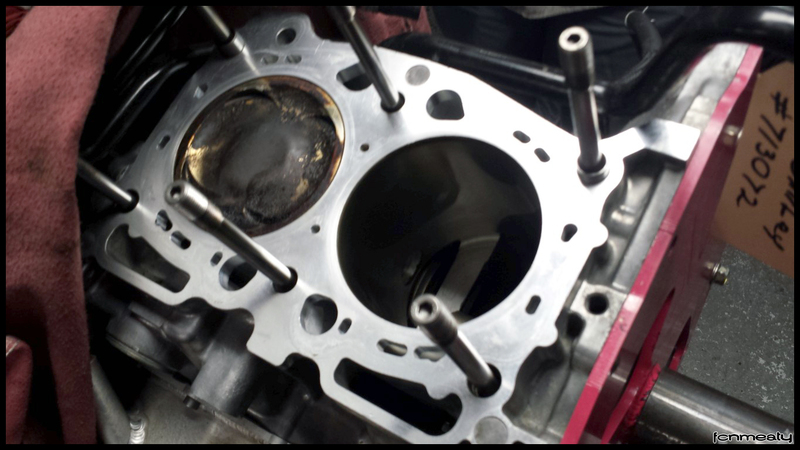 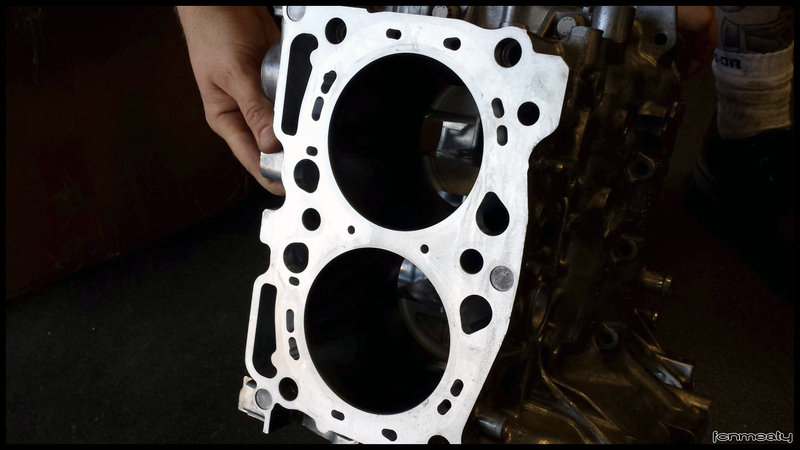 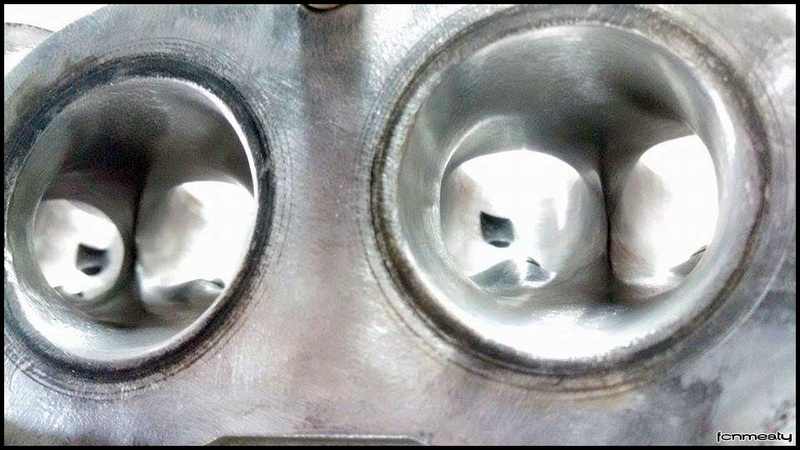 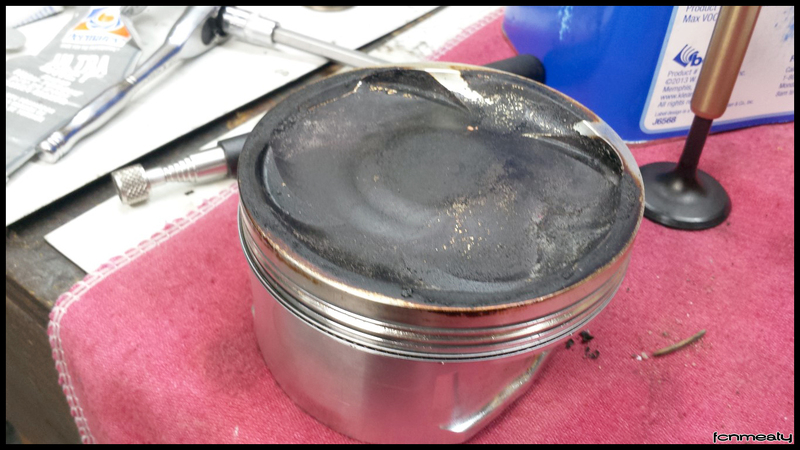 Stopped by Outfront Motorsports to check in on the engine. 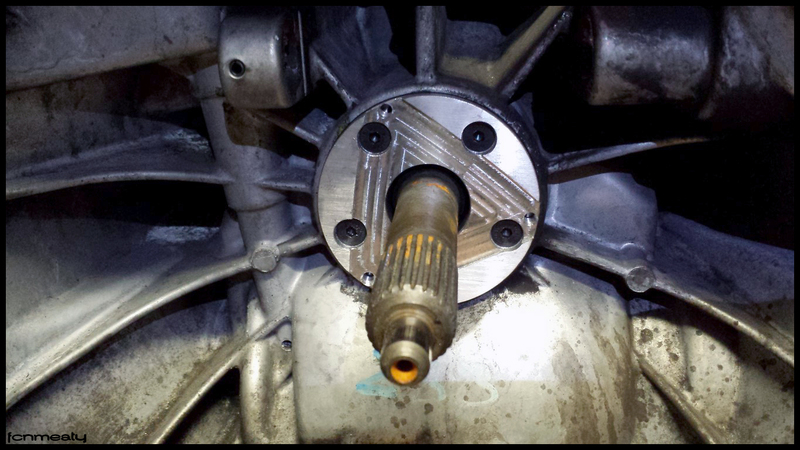 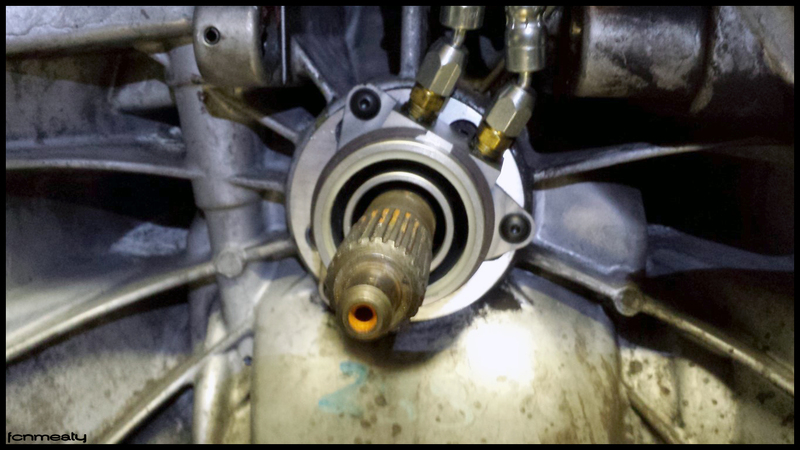 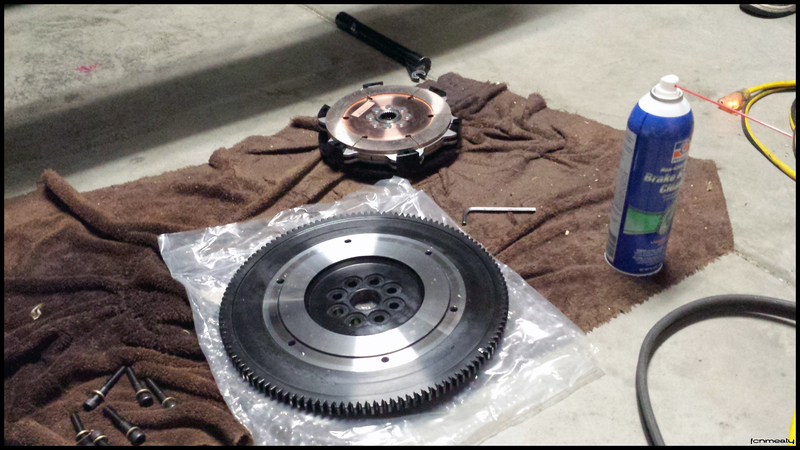 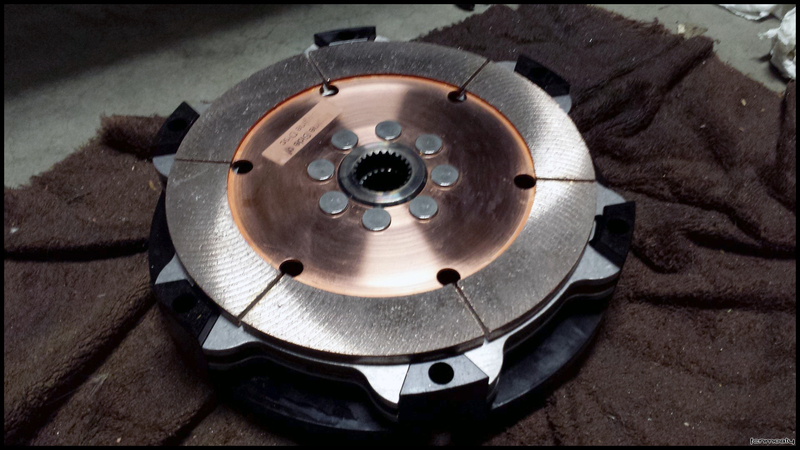 Pull to push clutch conversion using replacement bearing/slave cylinder from my new Competition Clutch Rigid Twin-Disc. 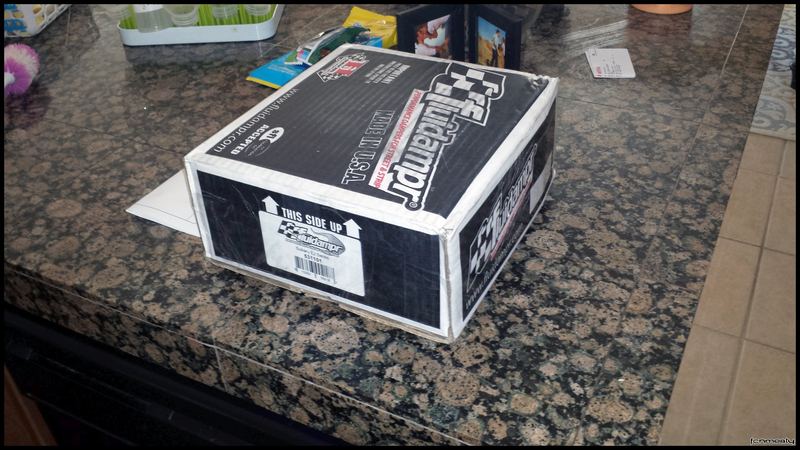 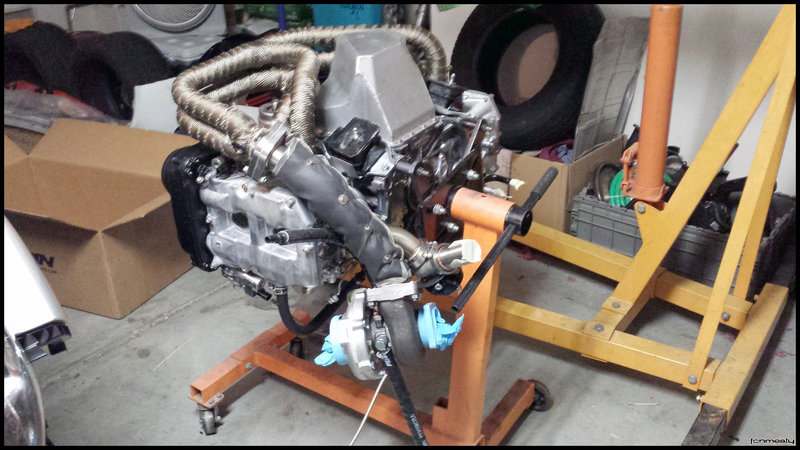 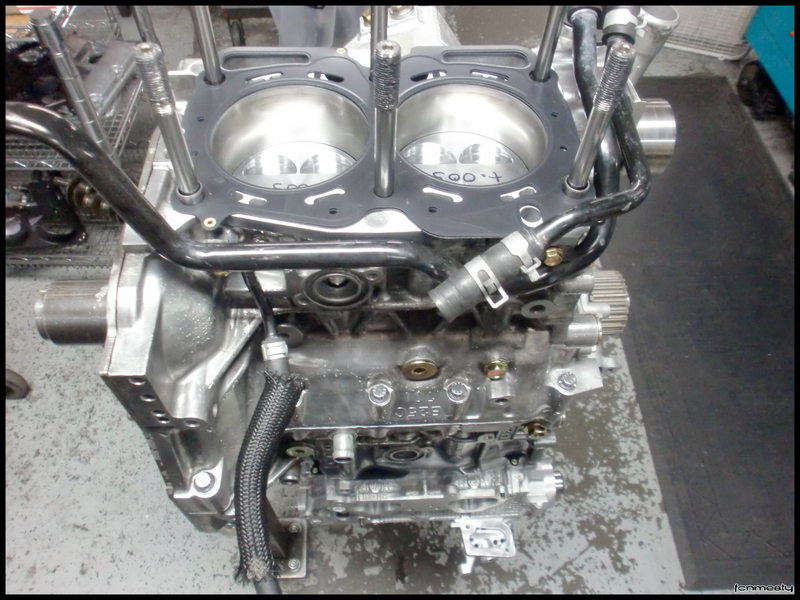 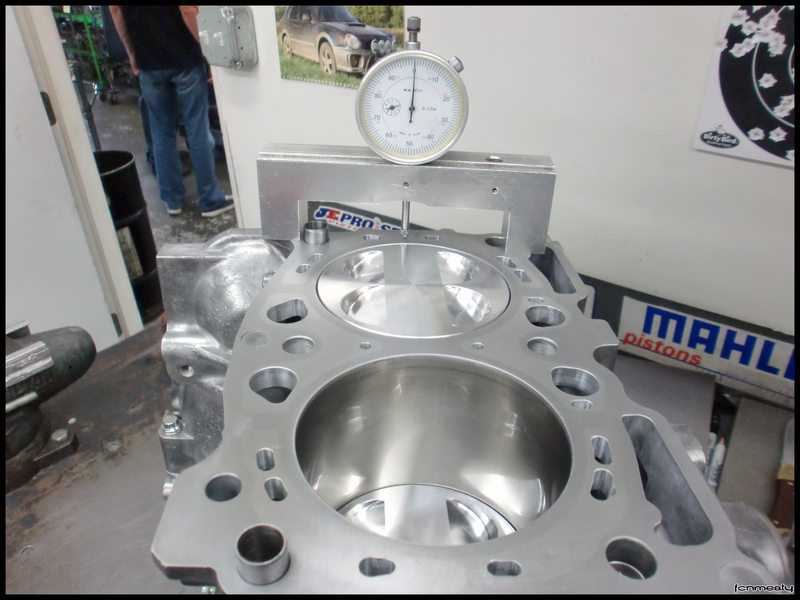 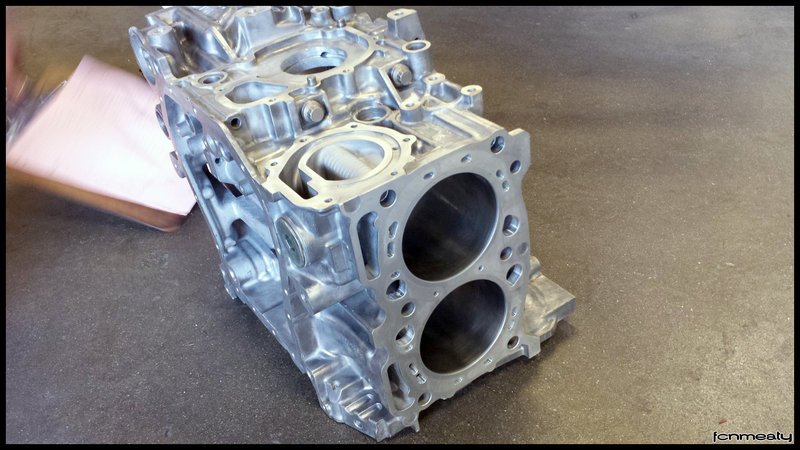 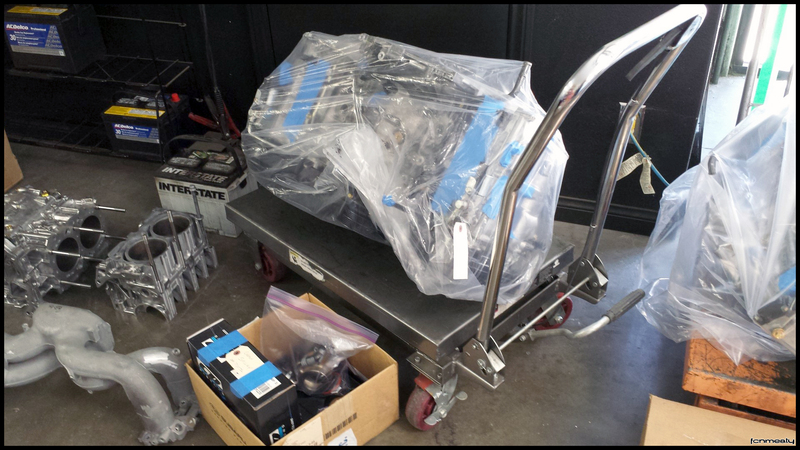 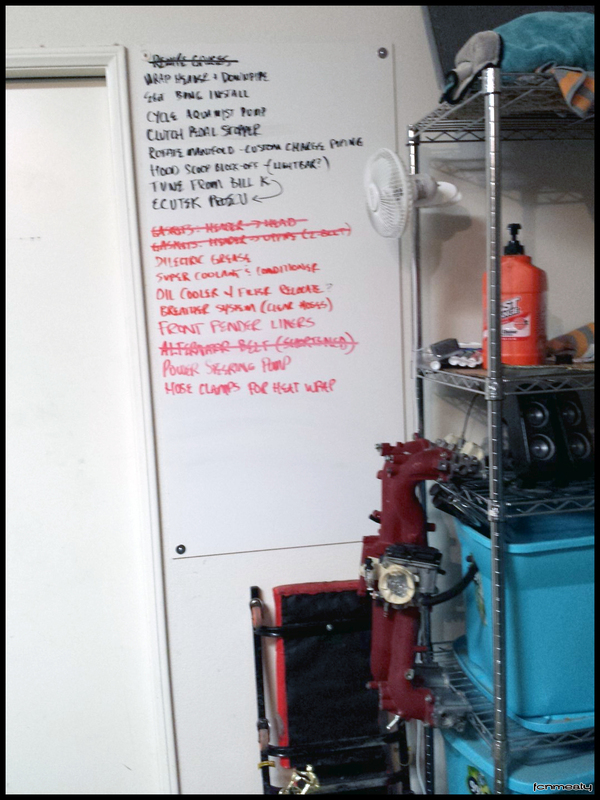 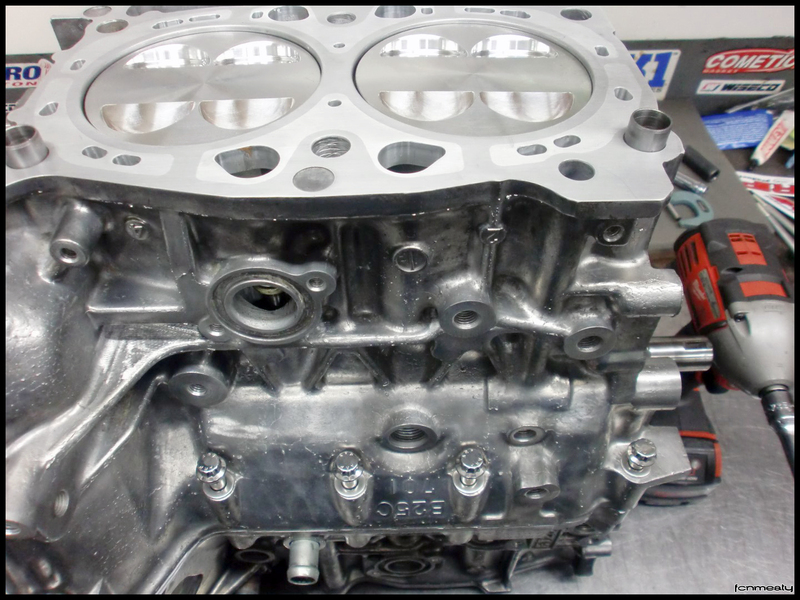 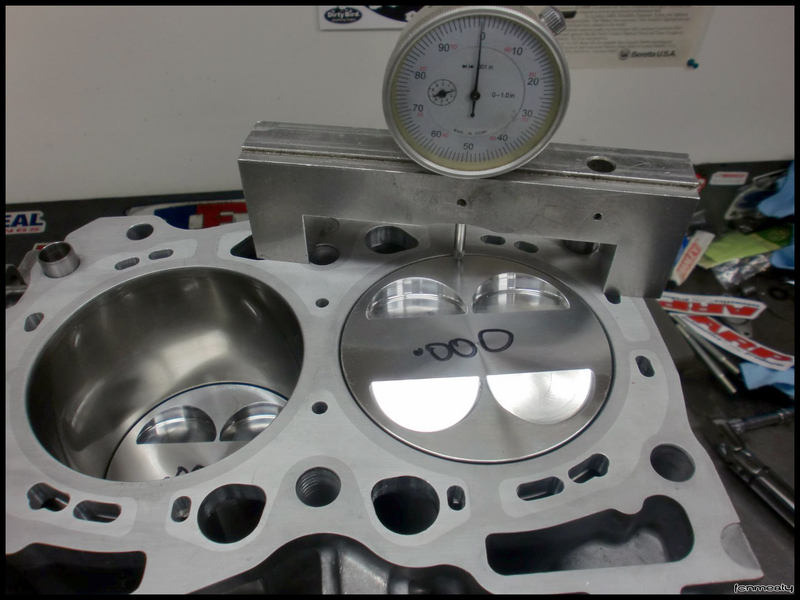 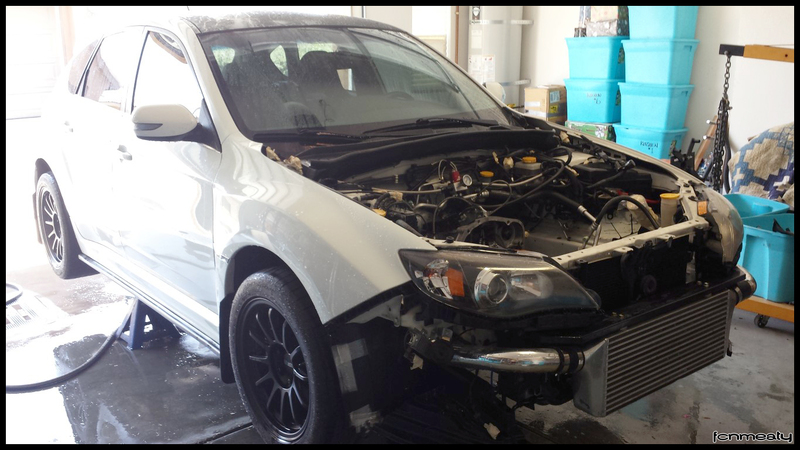 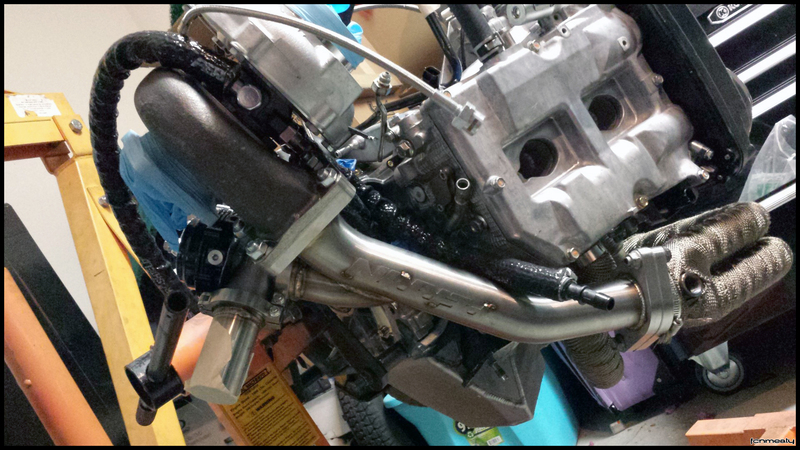 Engine dropped off at Outfront Motorsports for some final build plans. 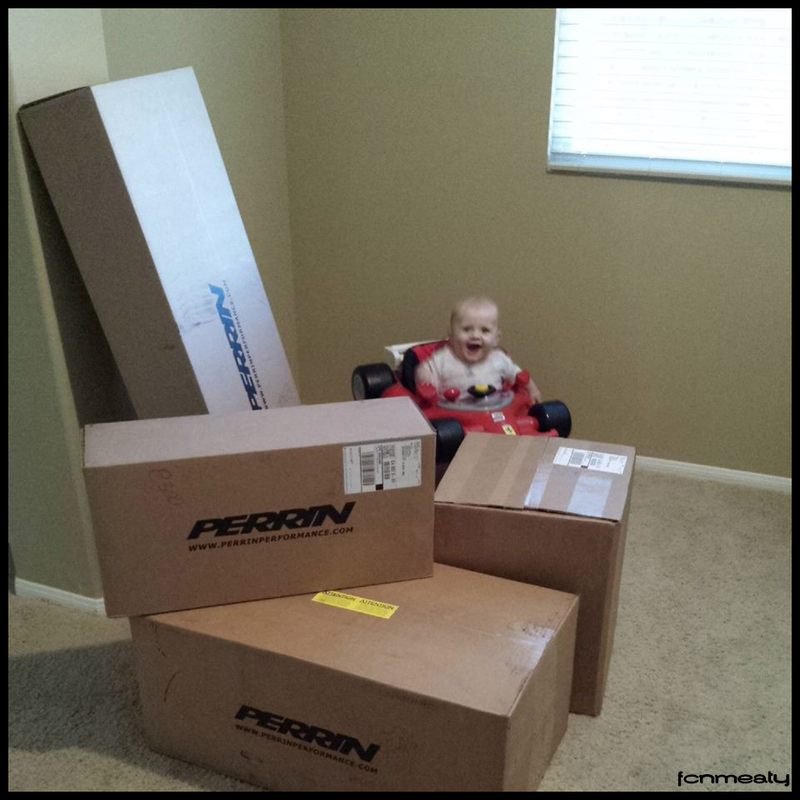 Parts received from Perrin, my son is as happy as I am! 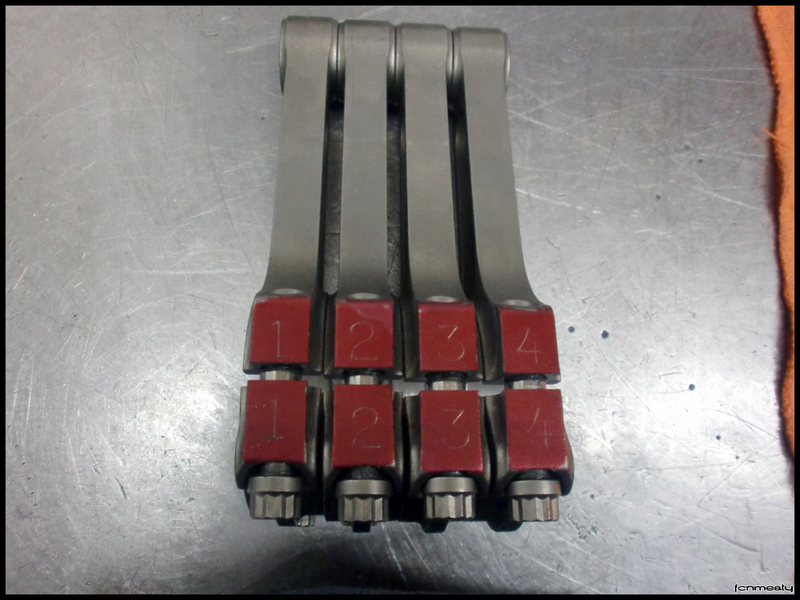 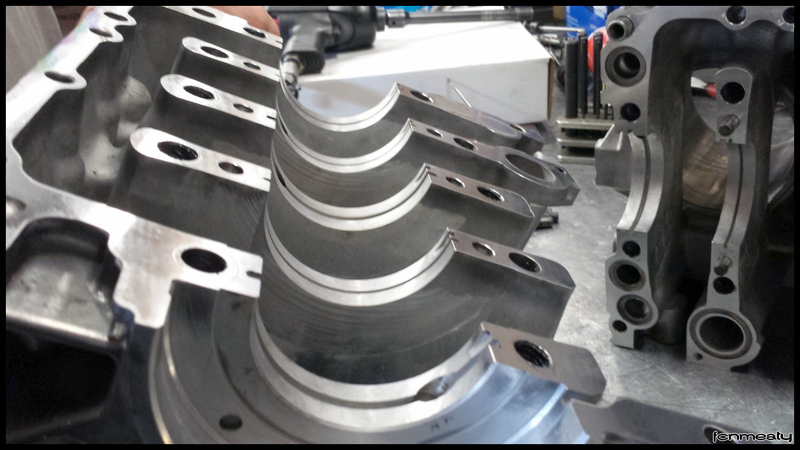 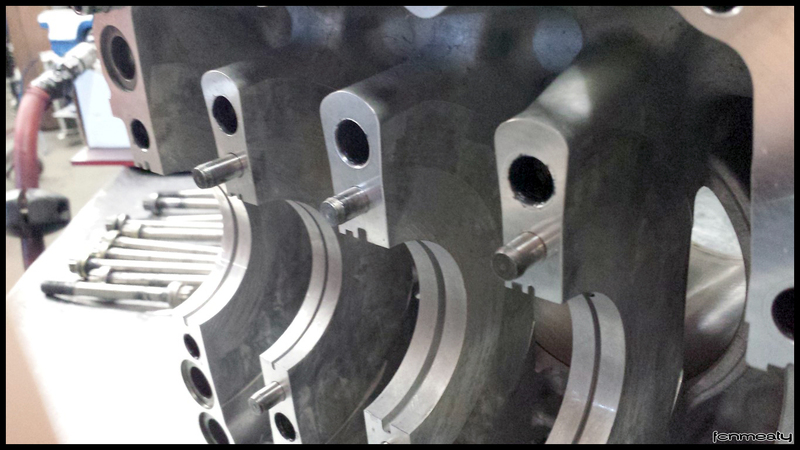 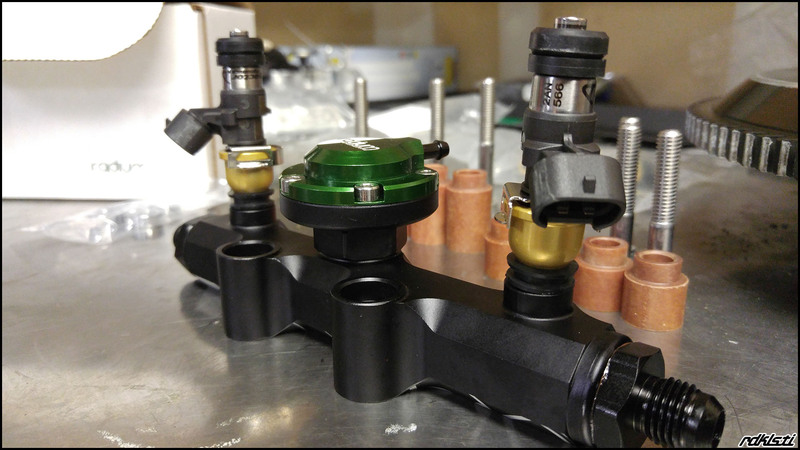 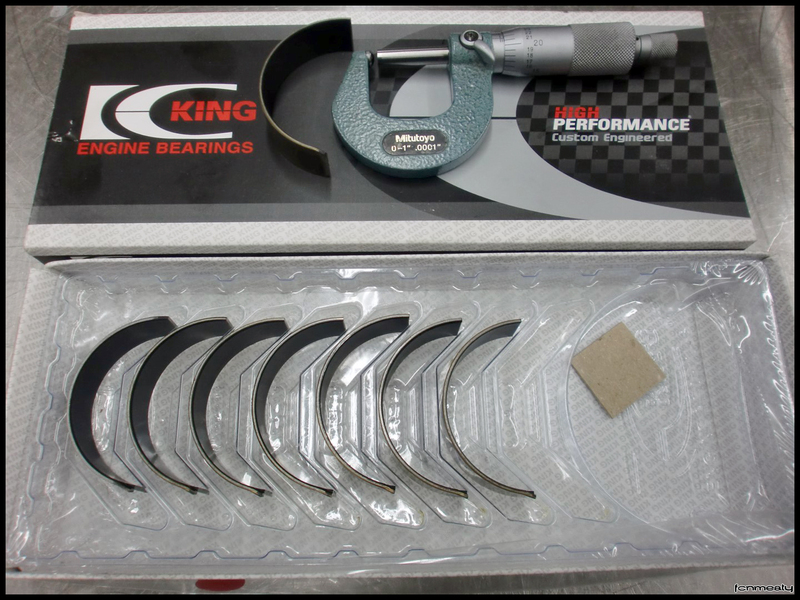 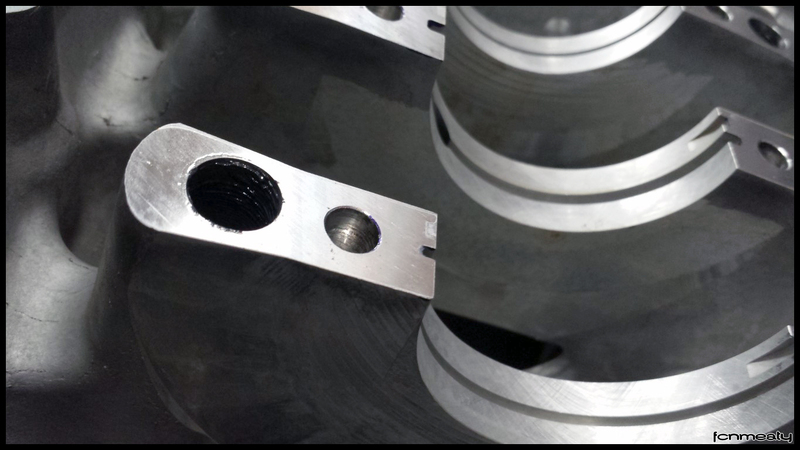 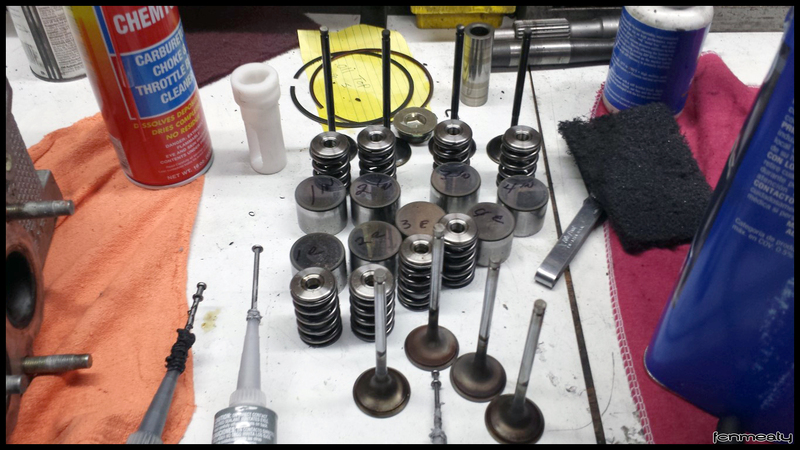 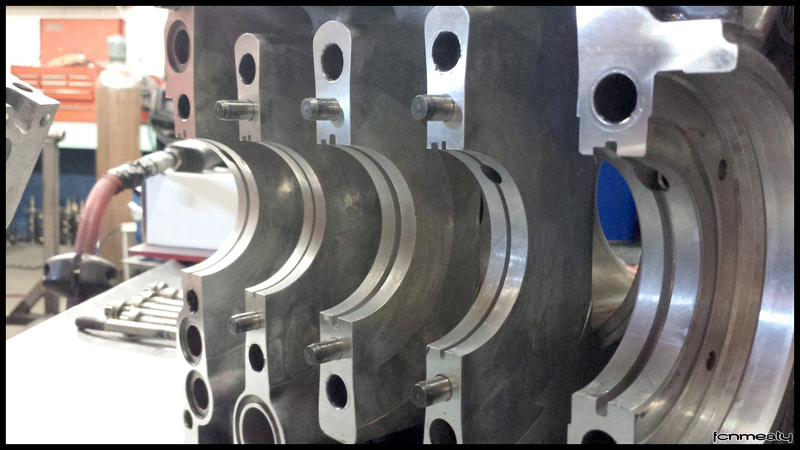 Parts being prepped at Perrin HQ. 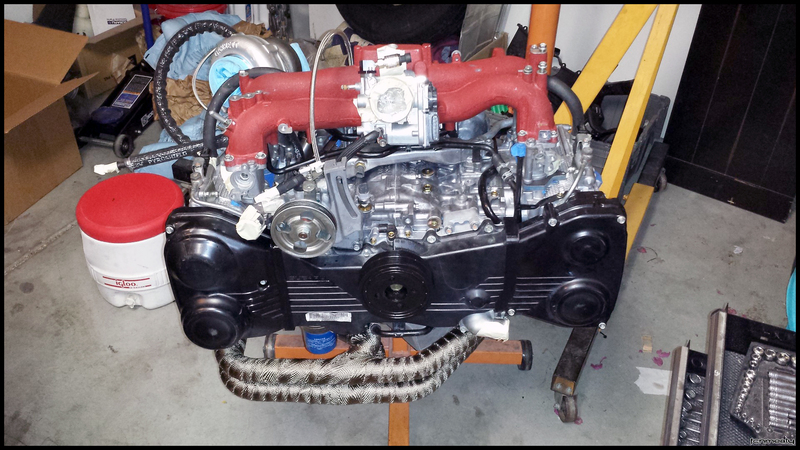 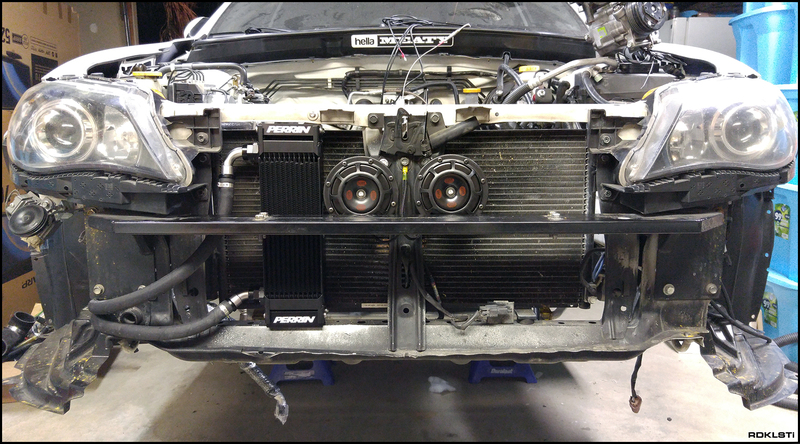 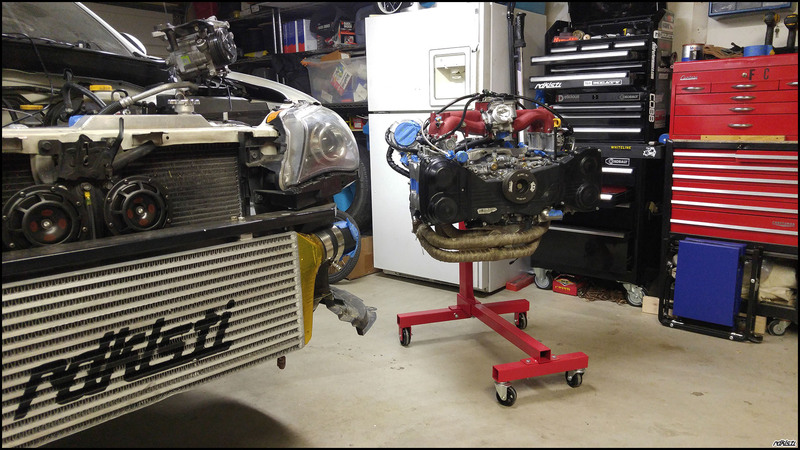 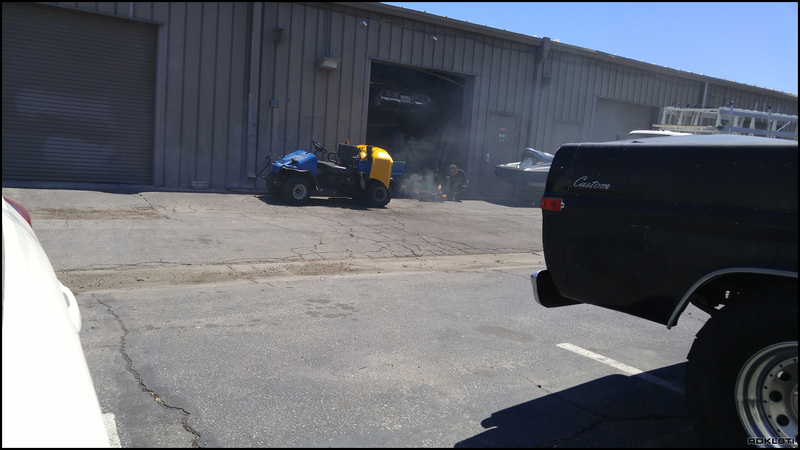 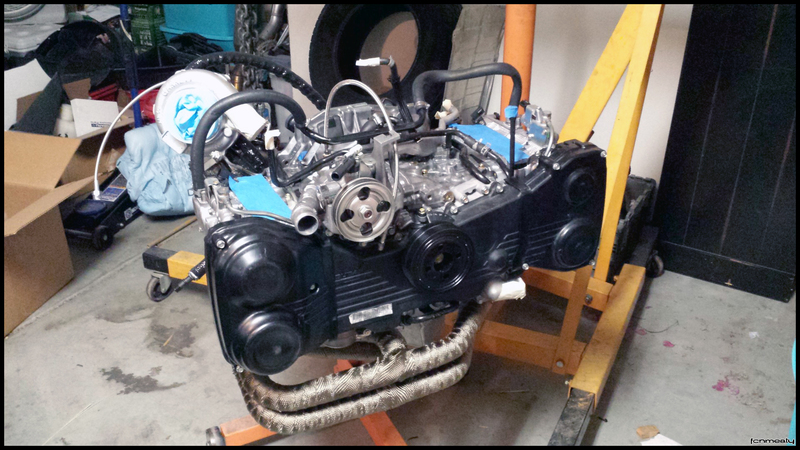 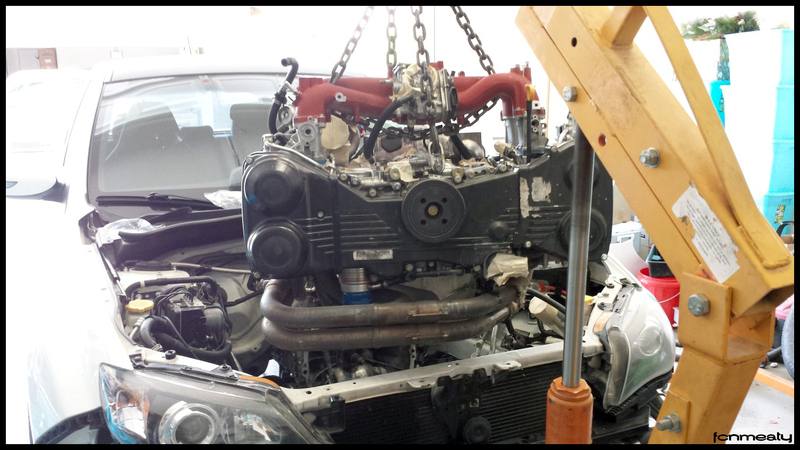 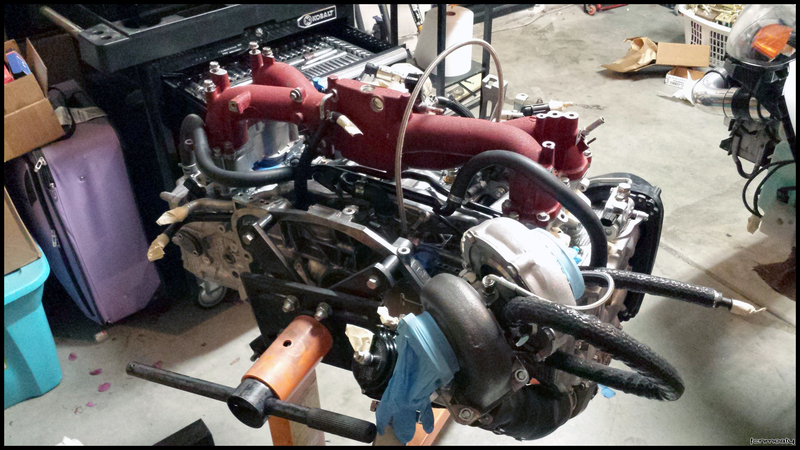 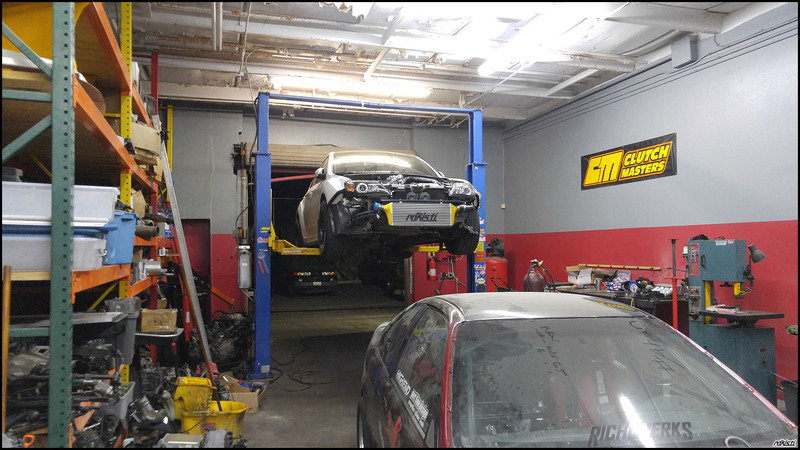 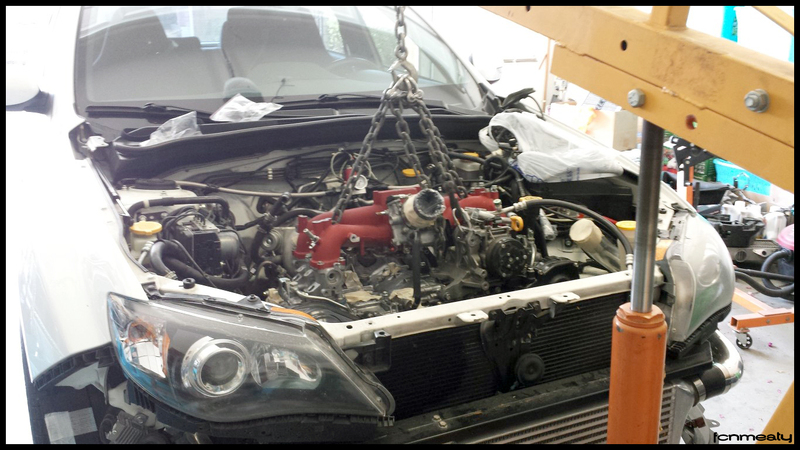 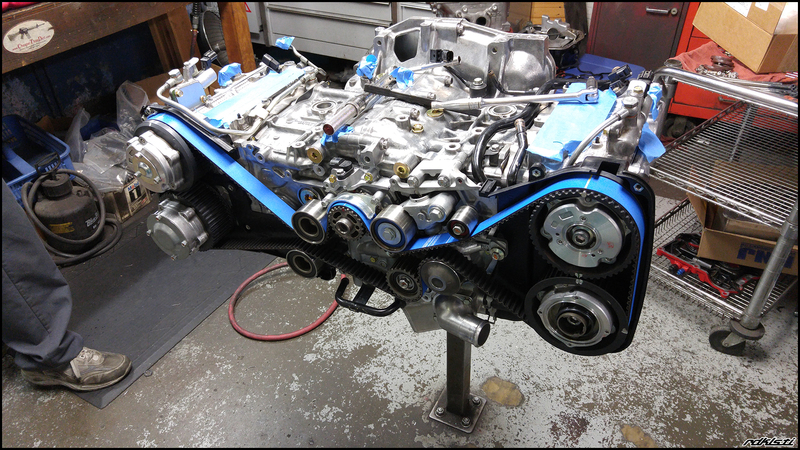 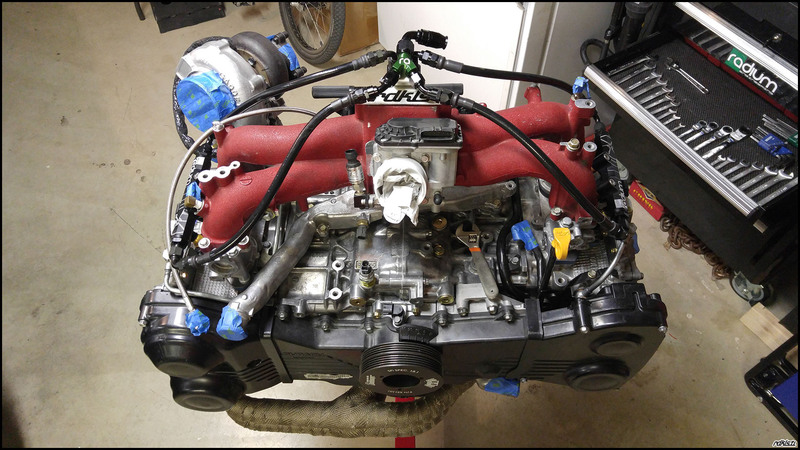 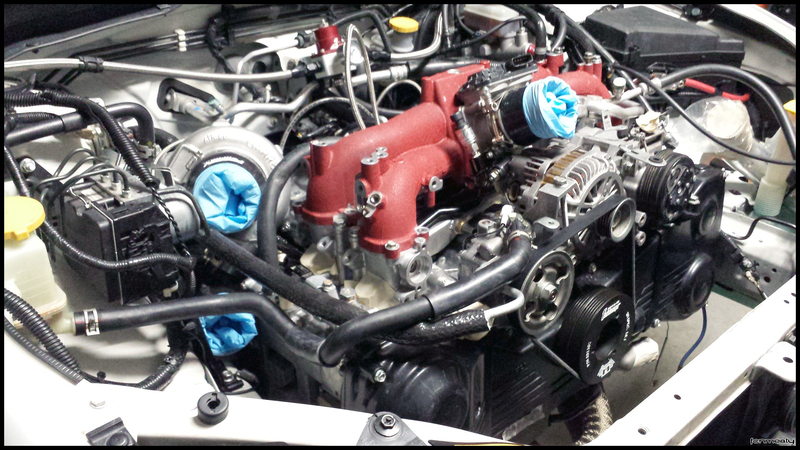 Pulled engine to bring to Outfront Motorsports to finish build.